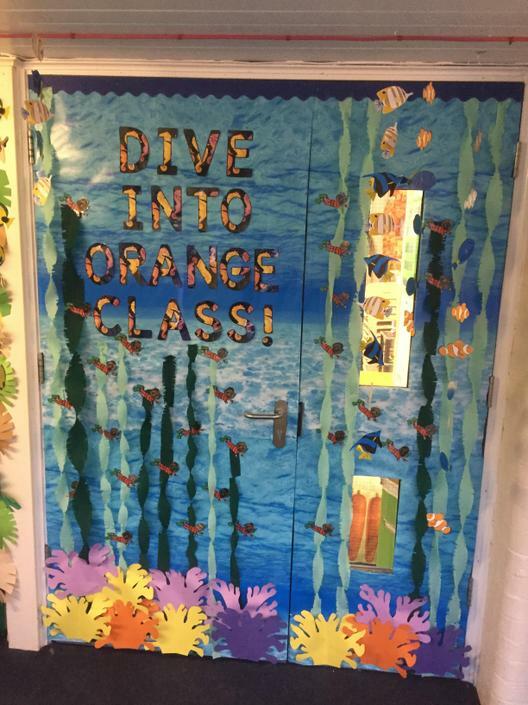 Welcome to the Orange class page. 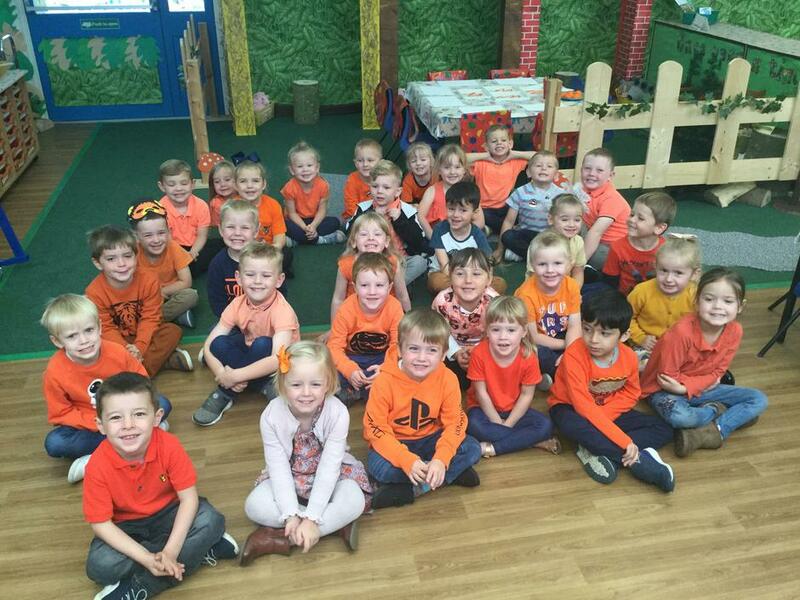 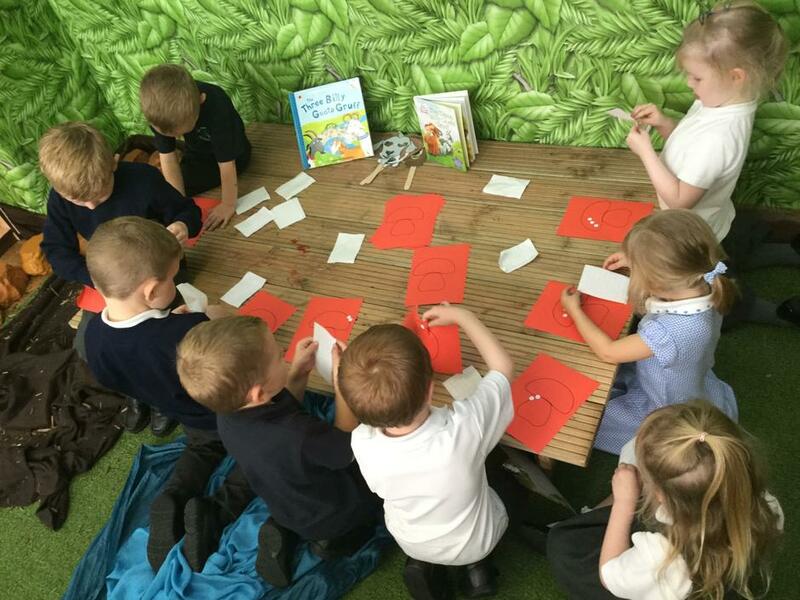 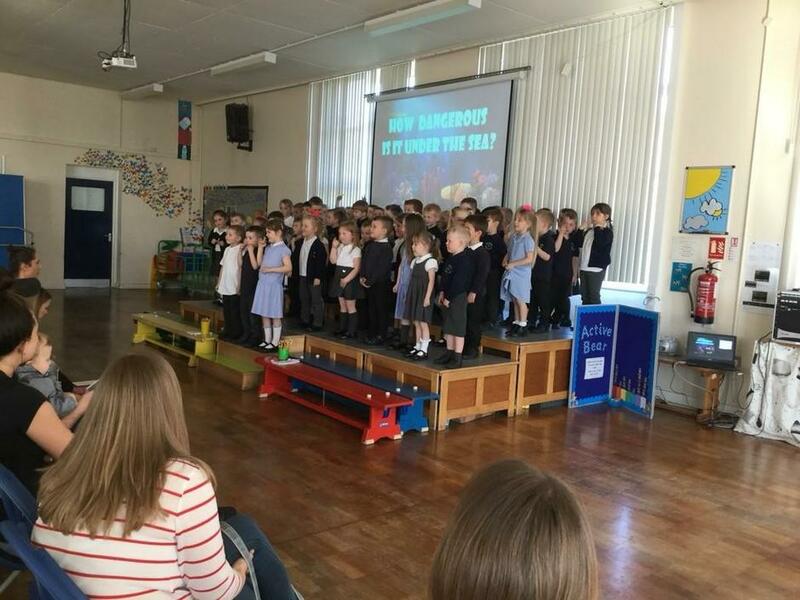 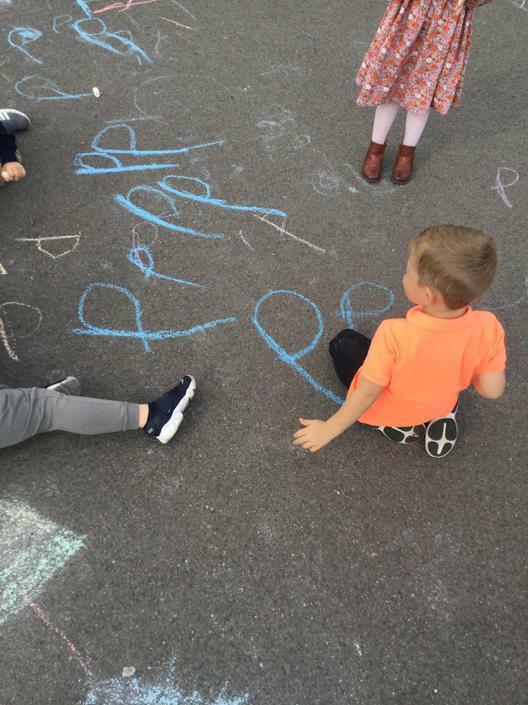 The class teacher in Orange class is Miss Parker and the Early Years Practitioner is Miss Wells. 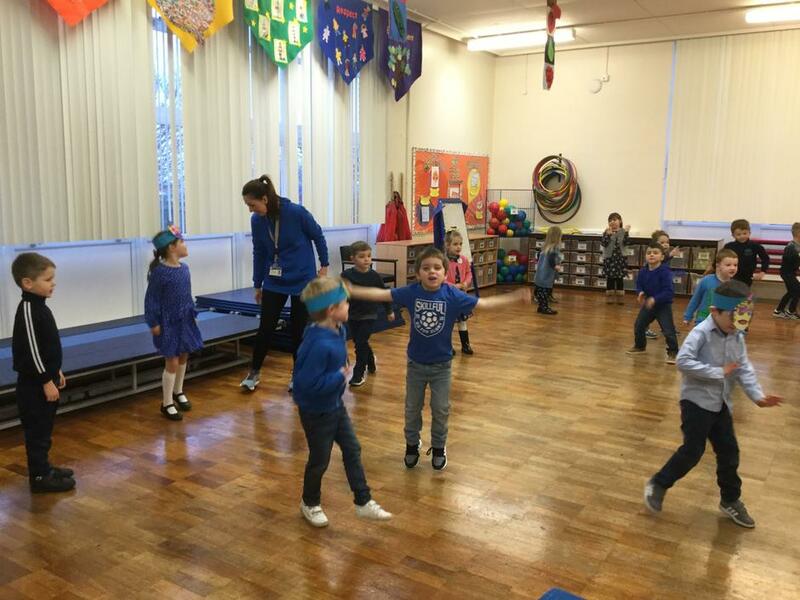 Mrs Arrand, Mrs Holmes and Mrs White support and help us too! 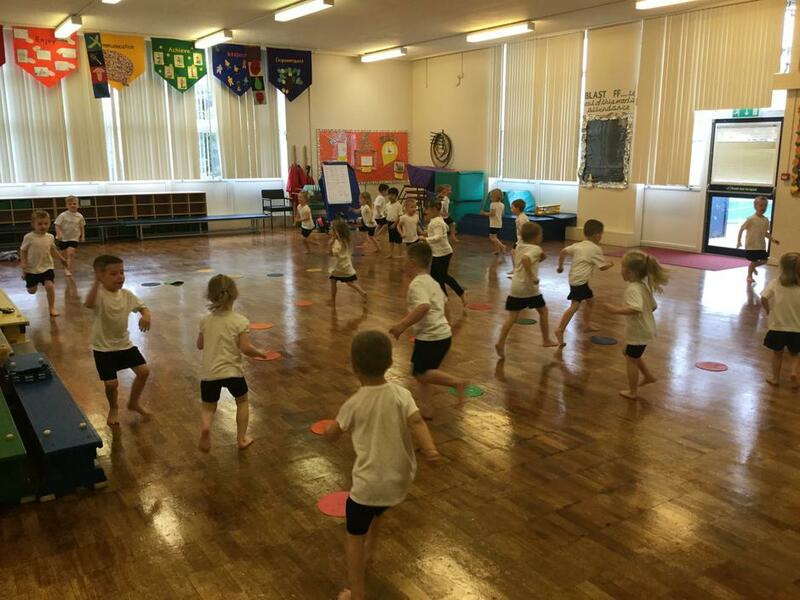 Our PE days are Monday and Friday; please send your child's PE kit in on a Monday and we will send it home on a Friday. 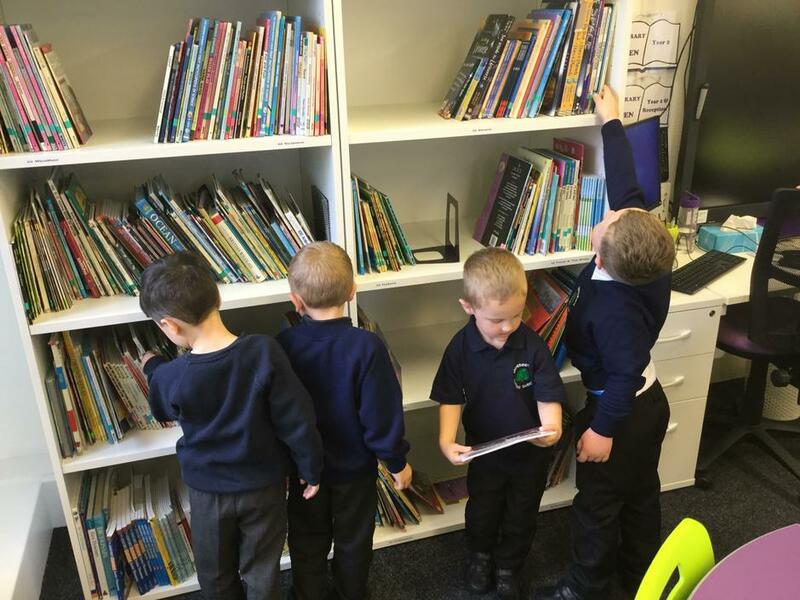 We give out homework books on a Friday and collect them in on a Wednesday. 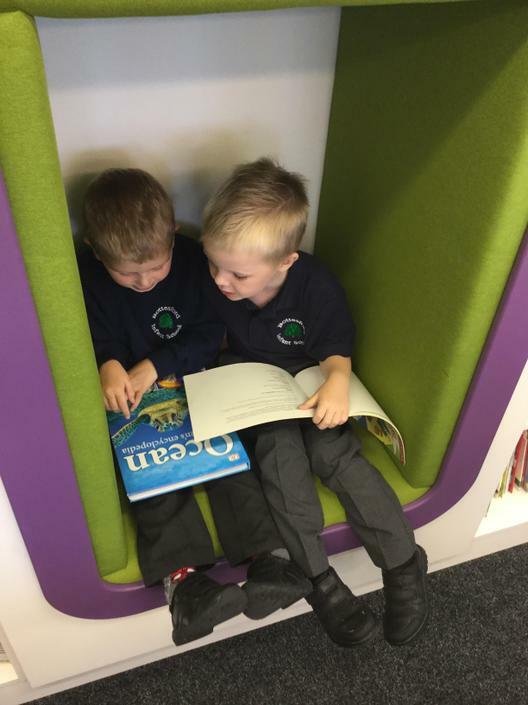 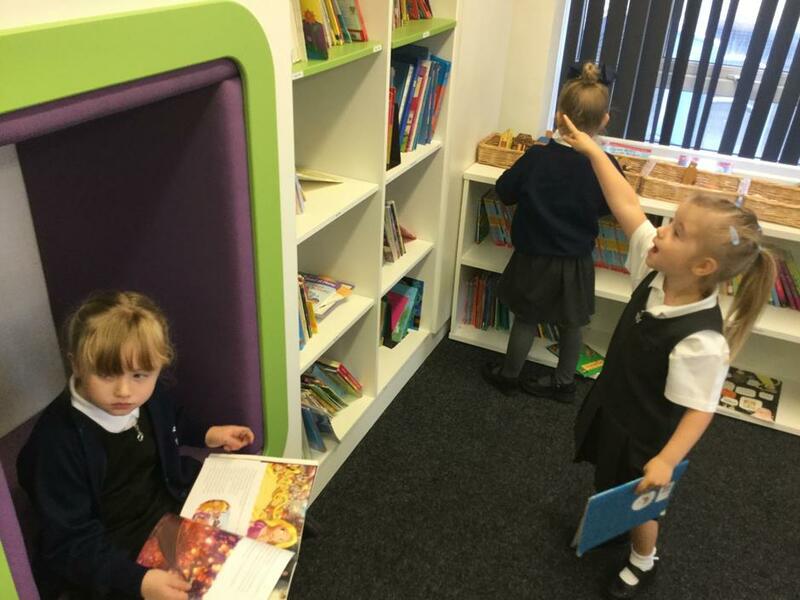 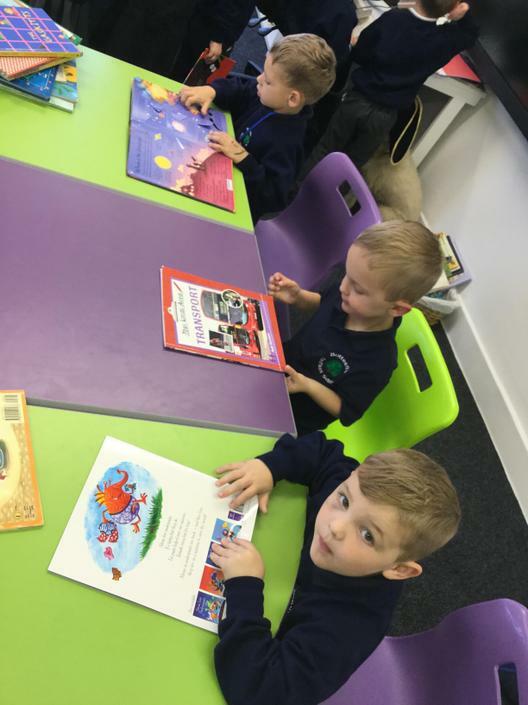 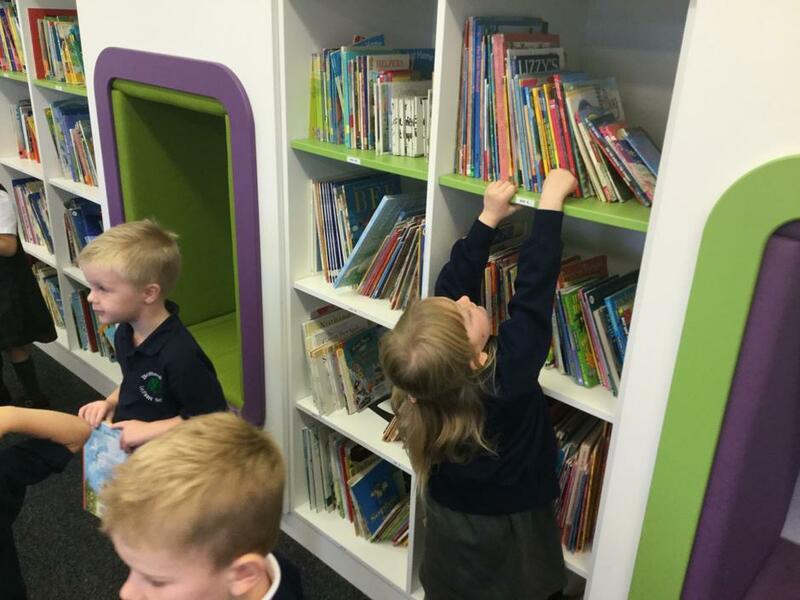 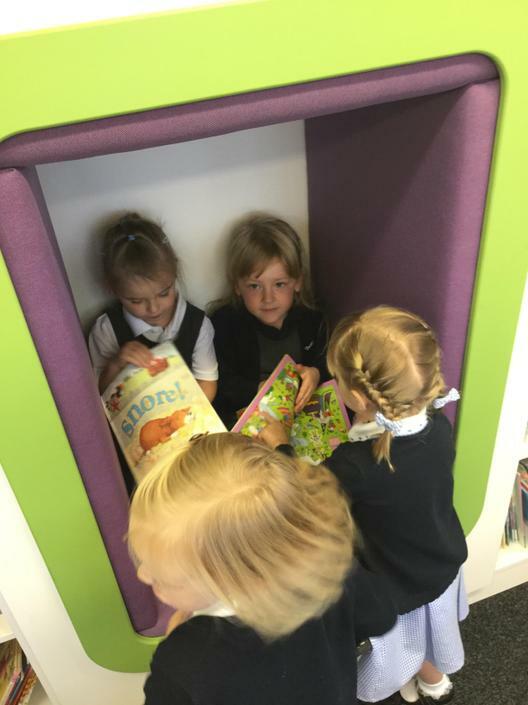 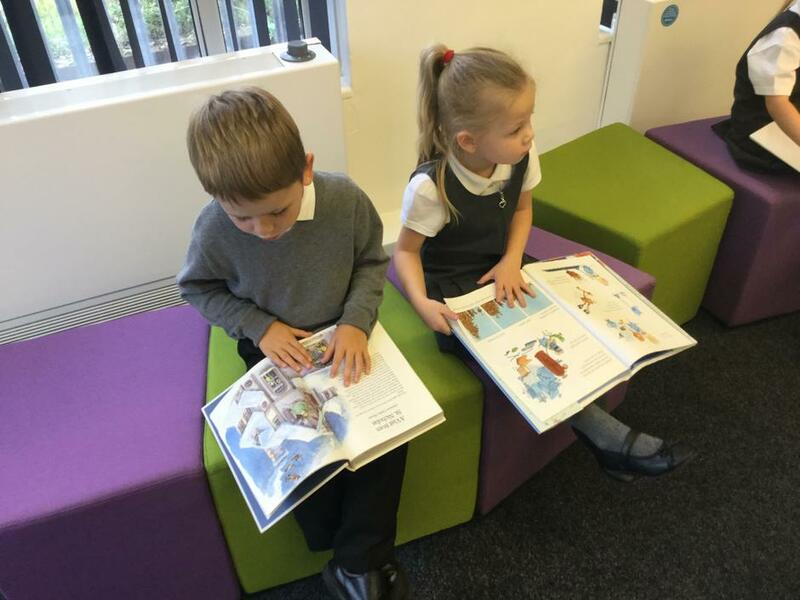 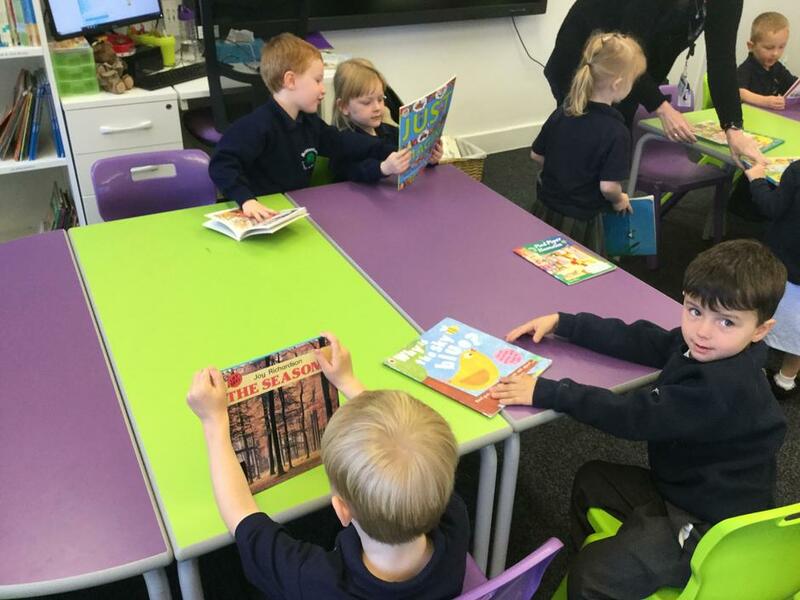 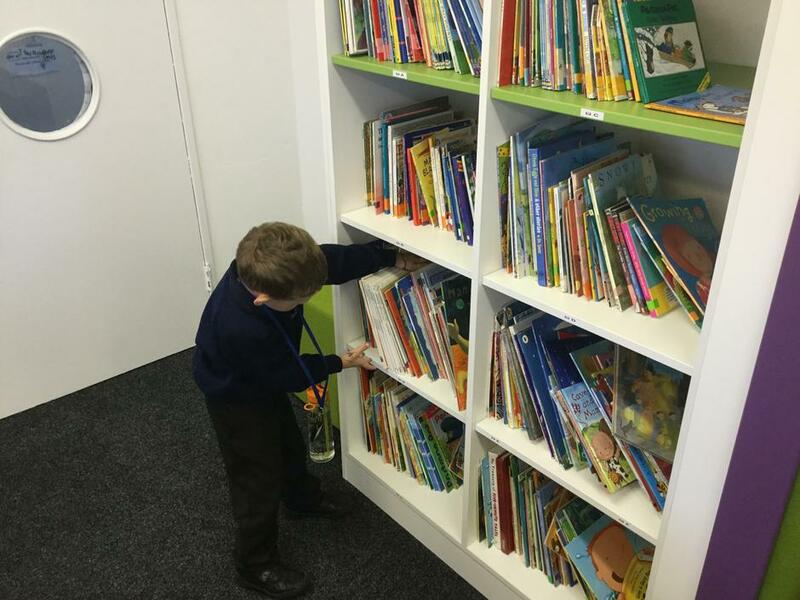 Our reading books will also be changed on a Wednesday. 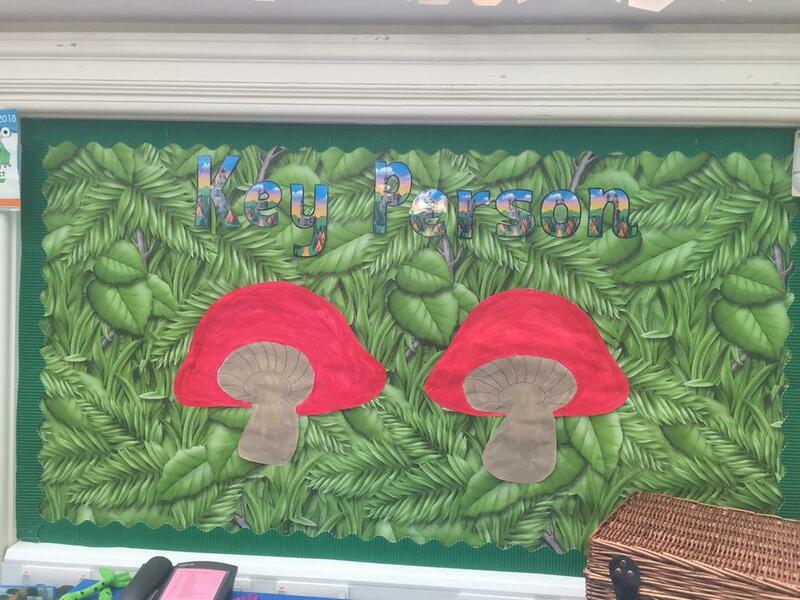 Please follow our Twitter page @Miss_N_Parker for more exciting updates! 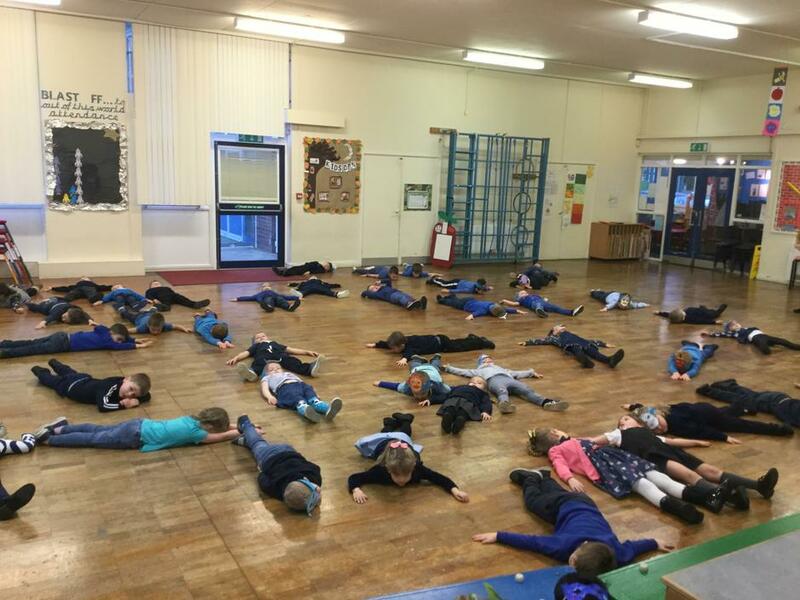 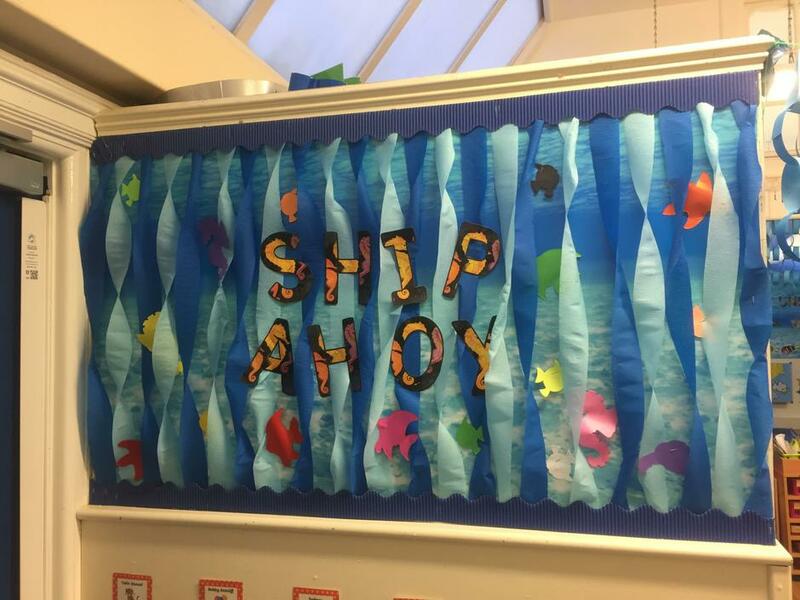 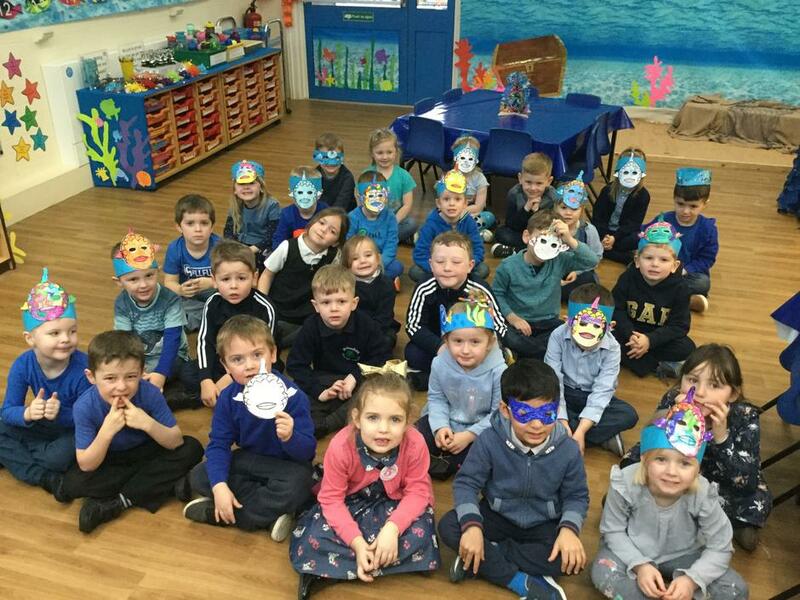 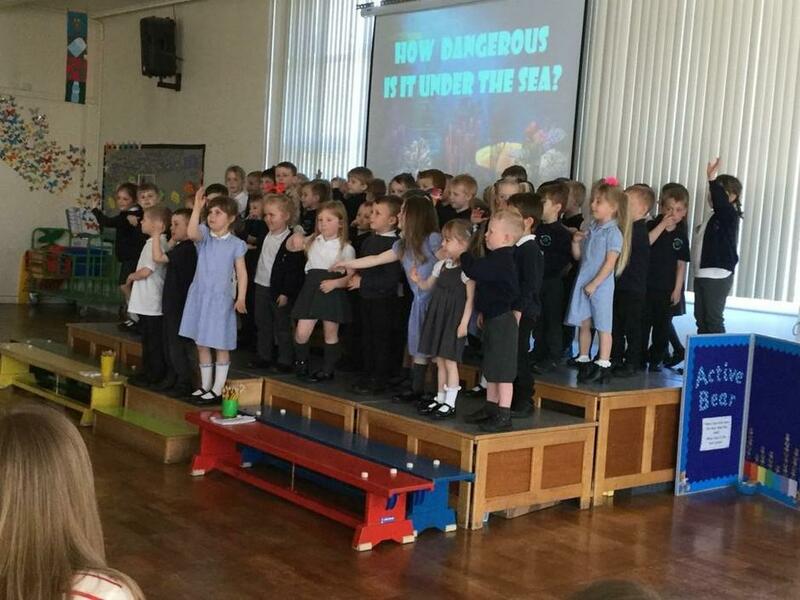 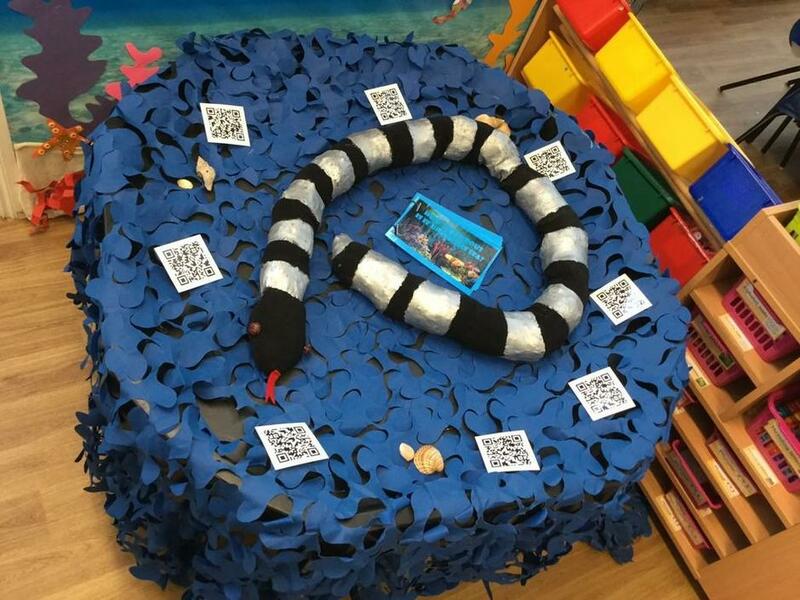 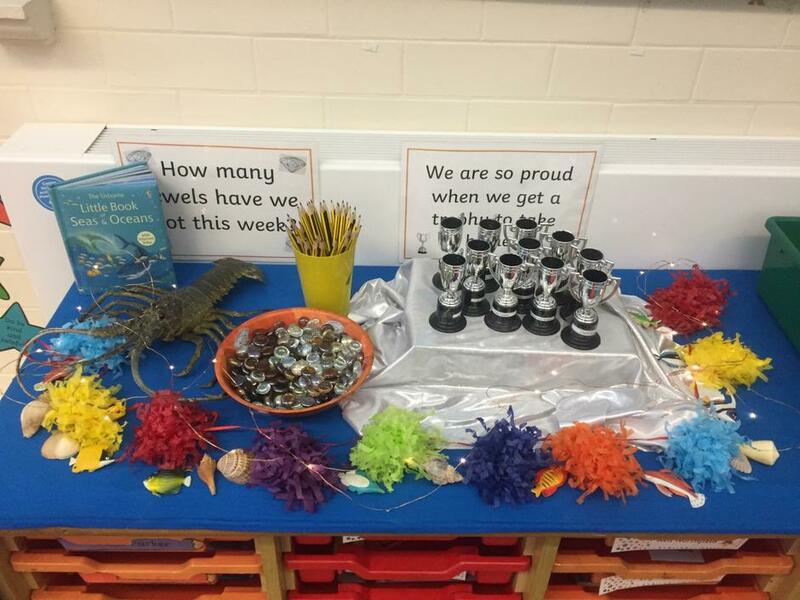 Our whole school theme for the Spring term is 'Ship Ahoy' and our essential question is 'How dangerous is it under the sea?'. 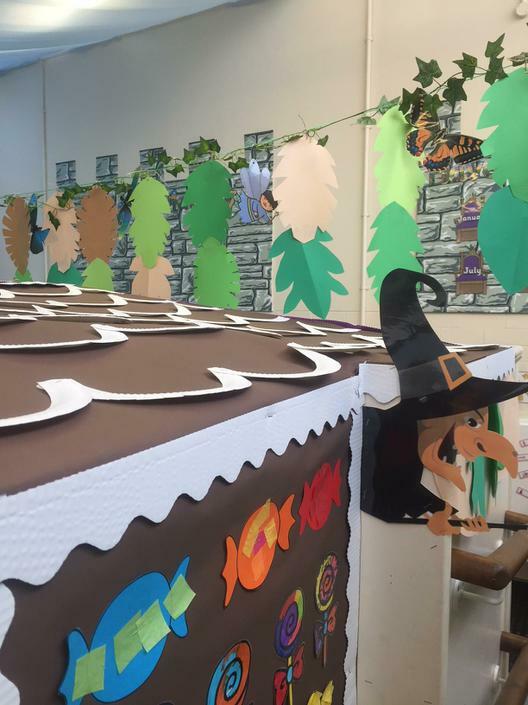 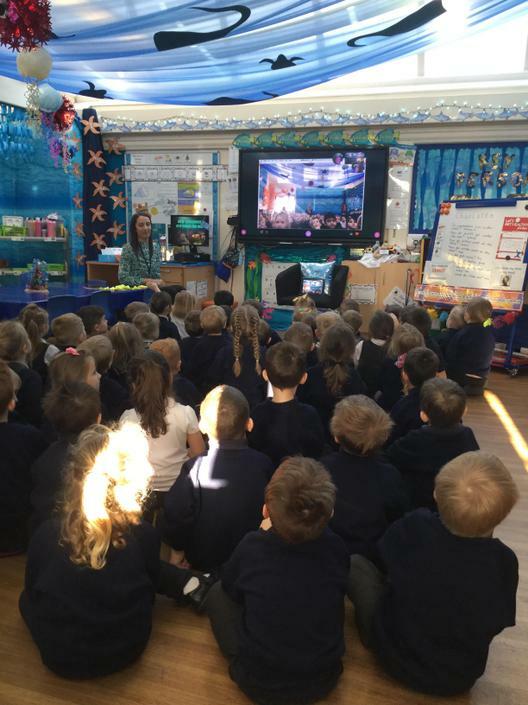 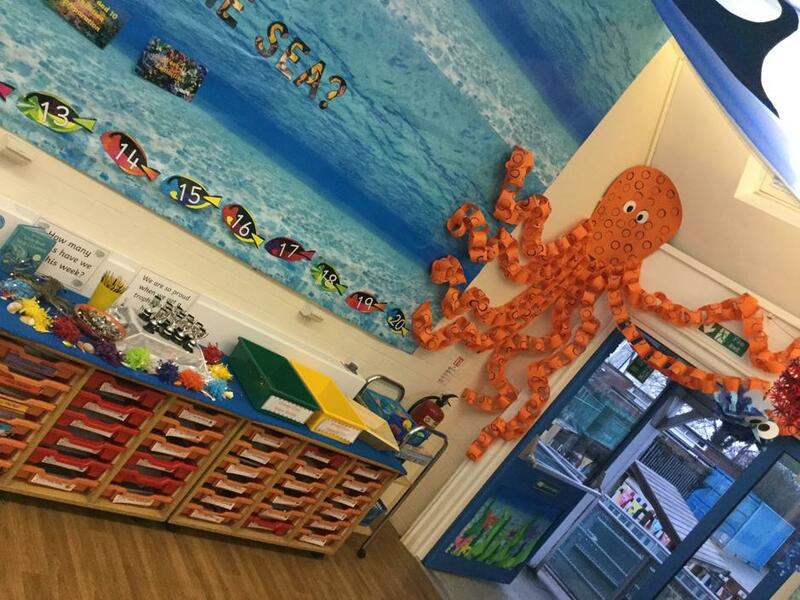 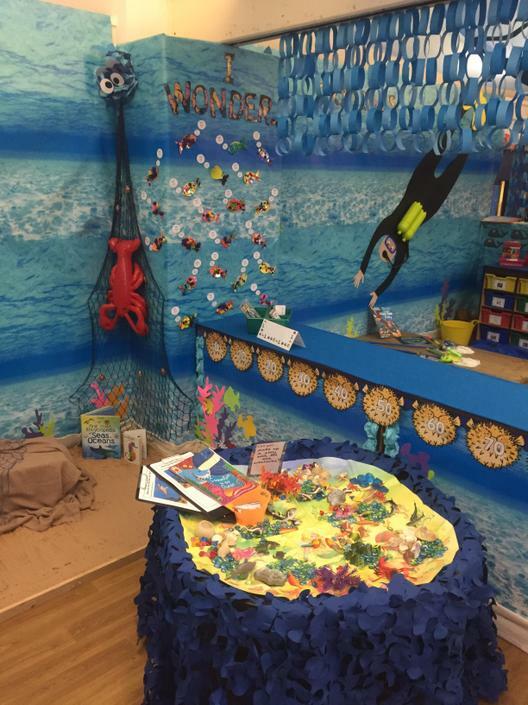 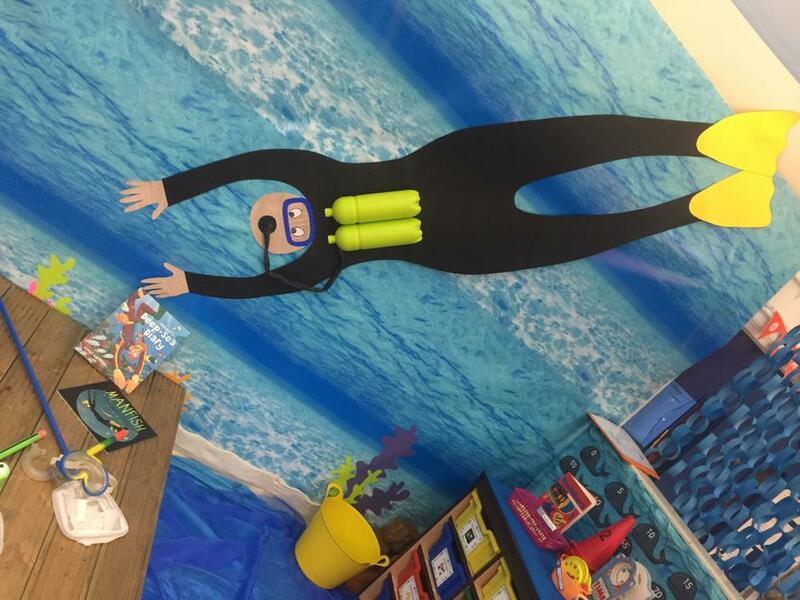 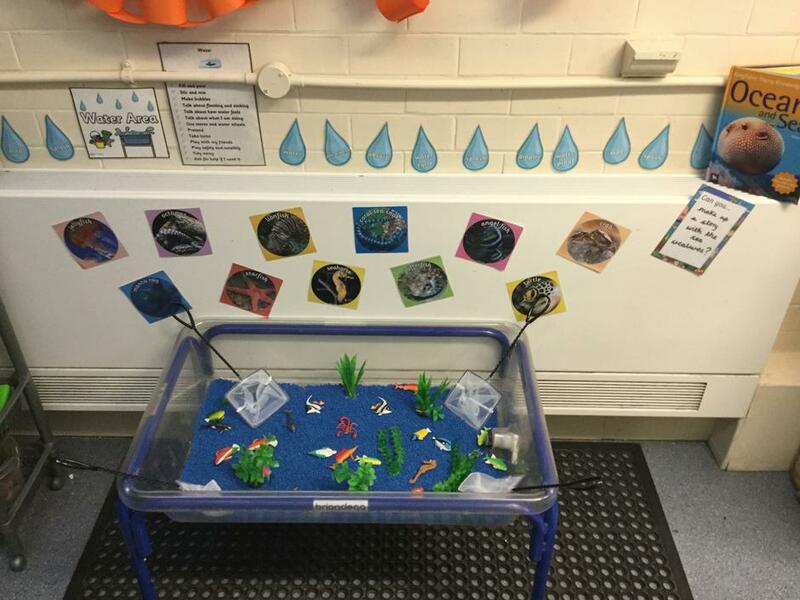 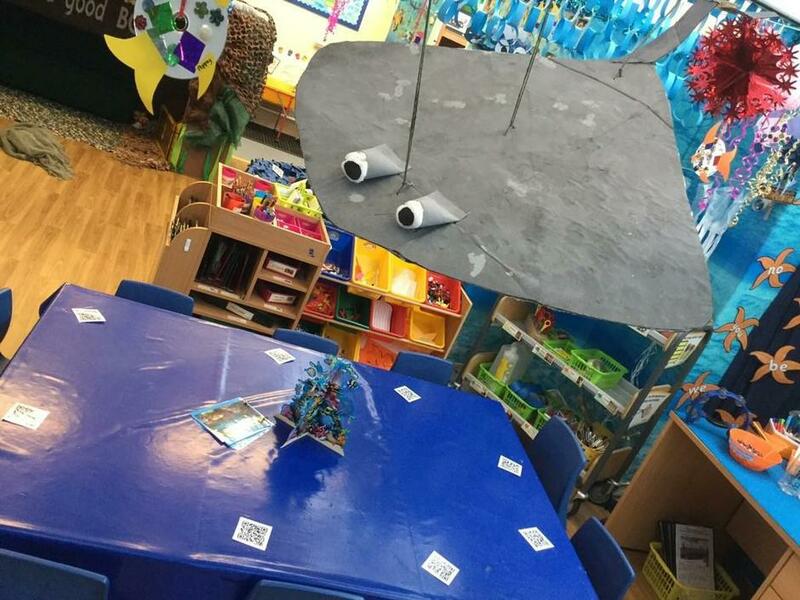 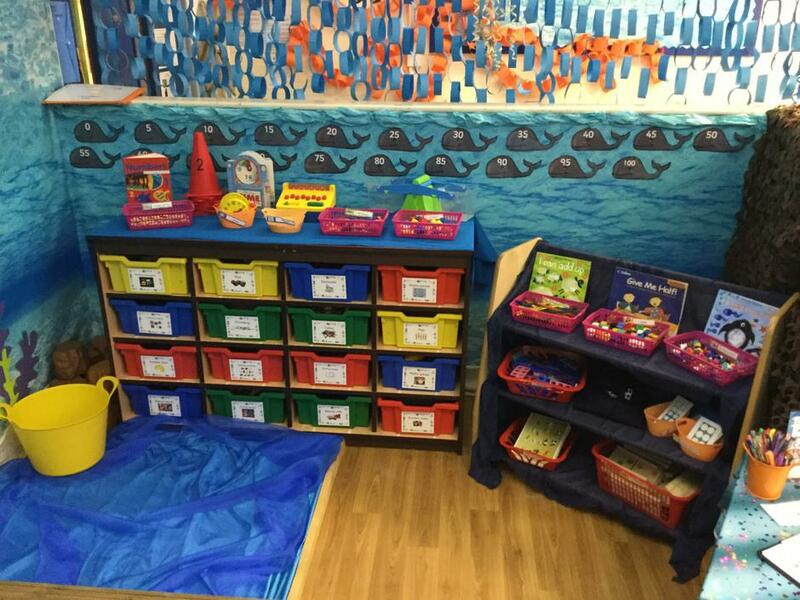 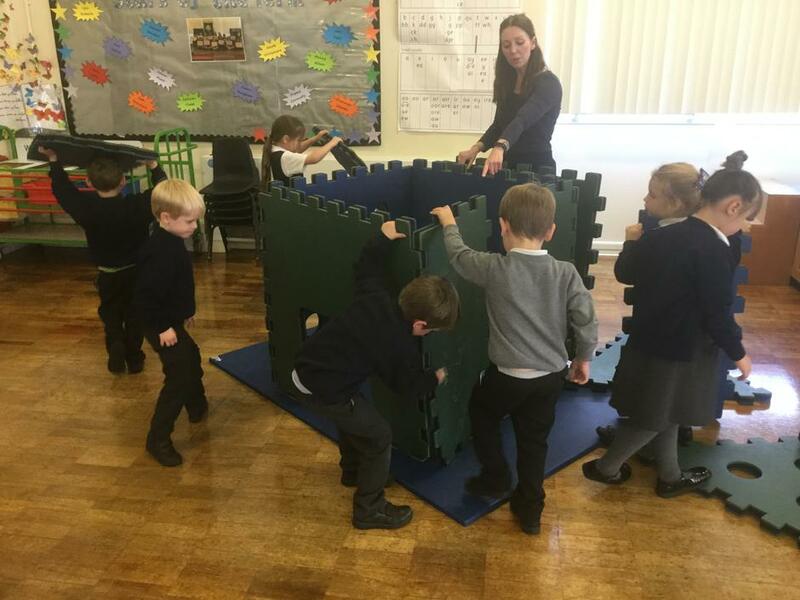 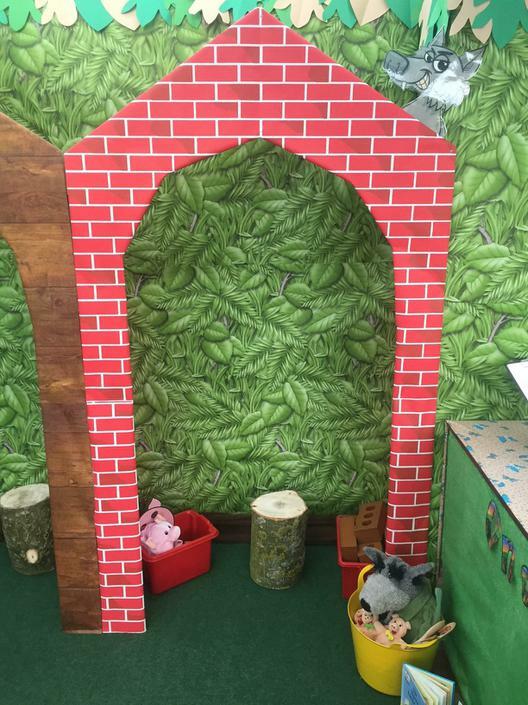 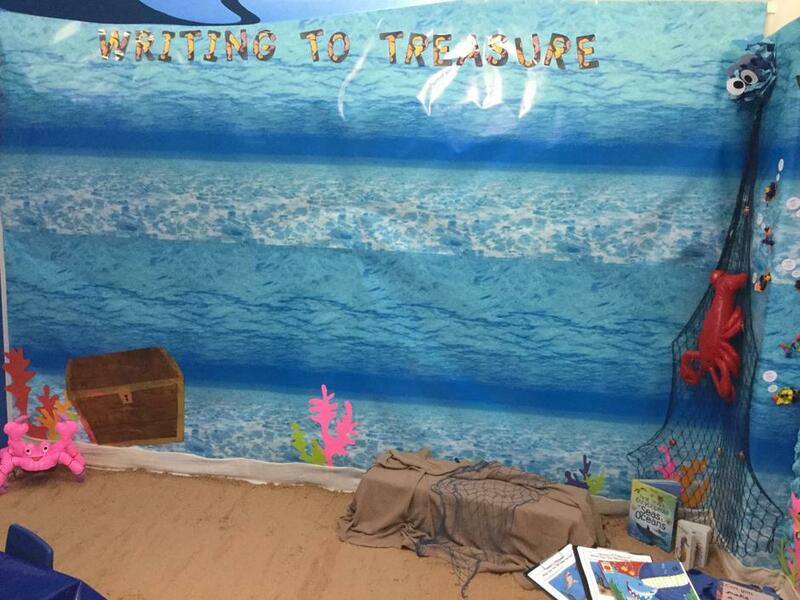 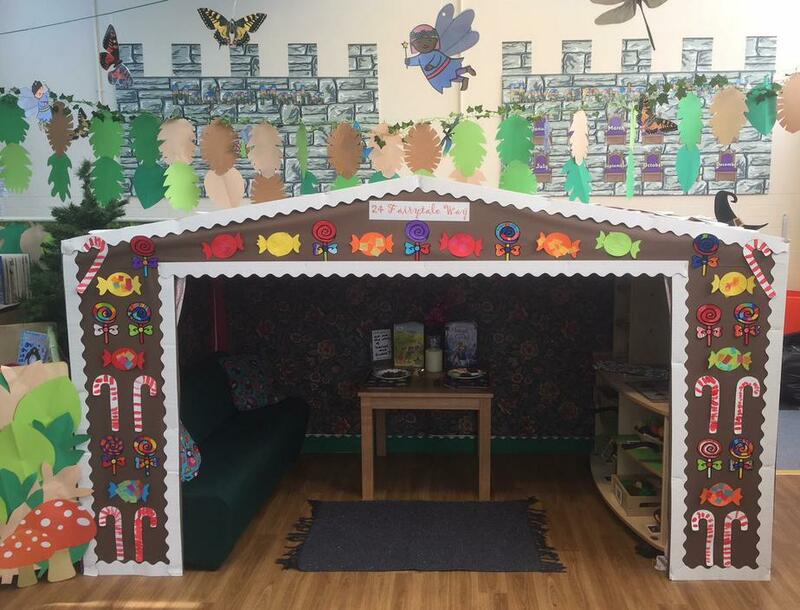 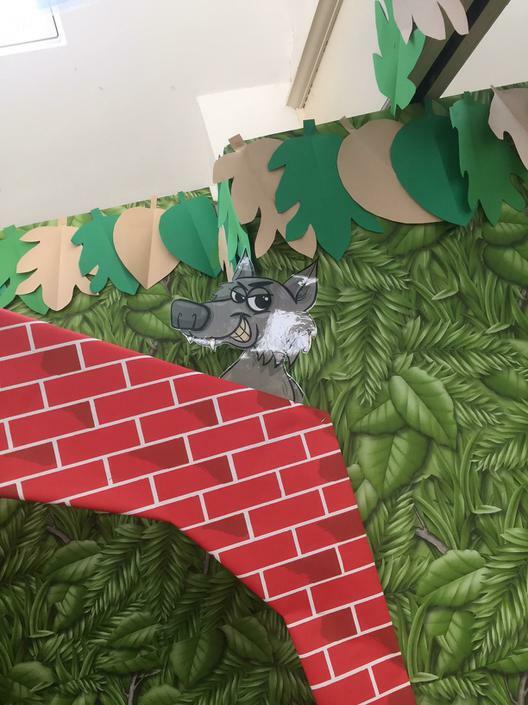 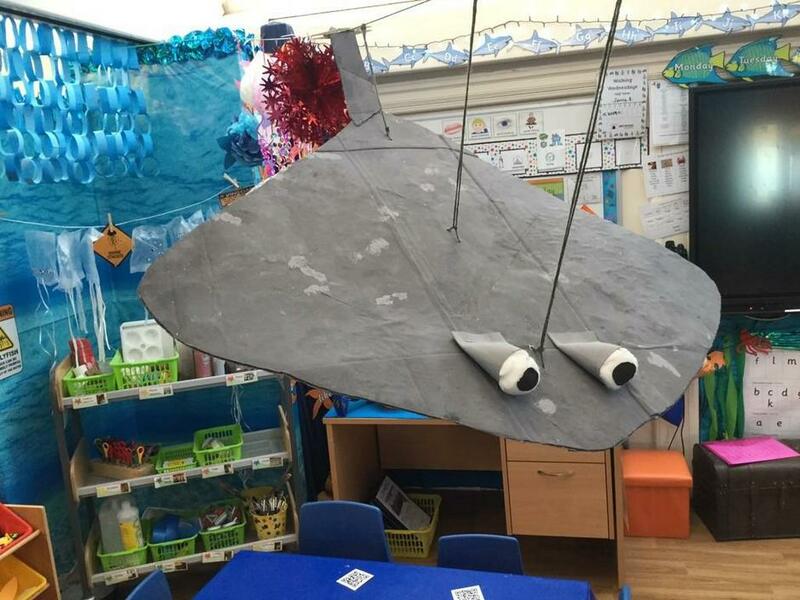 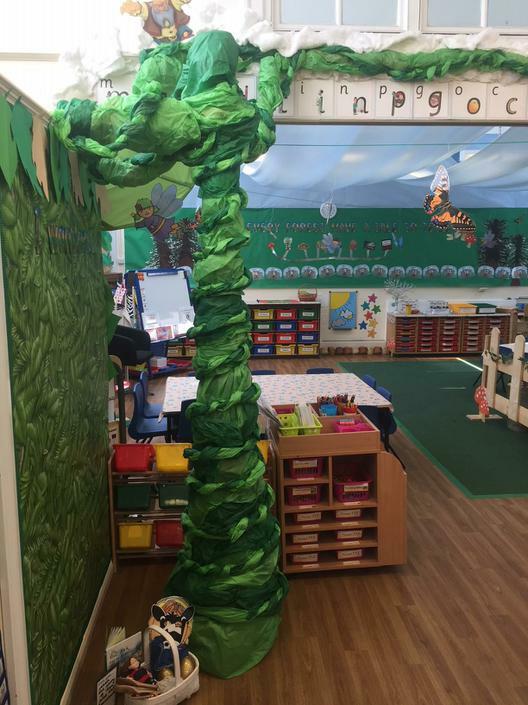 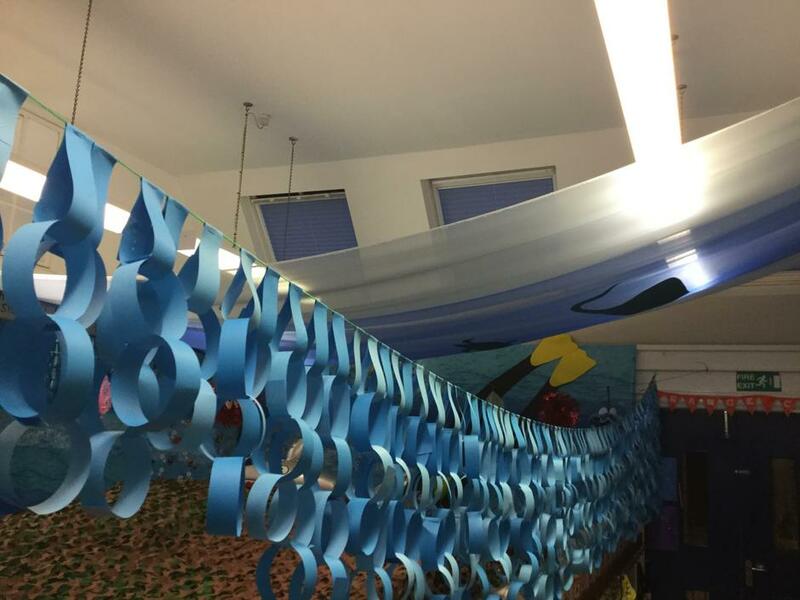 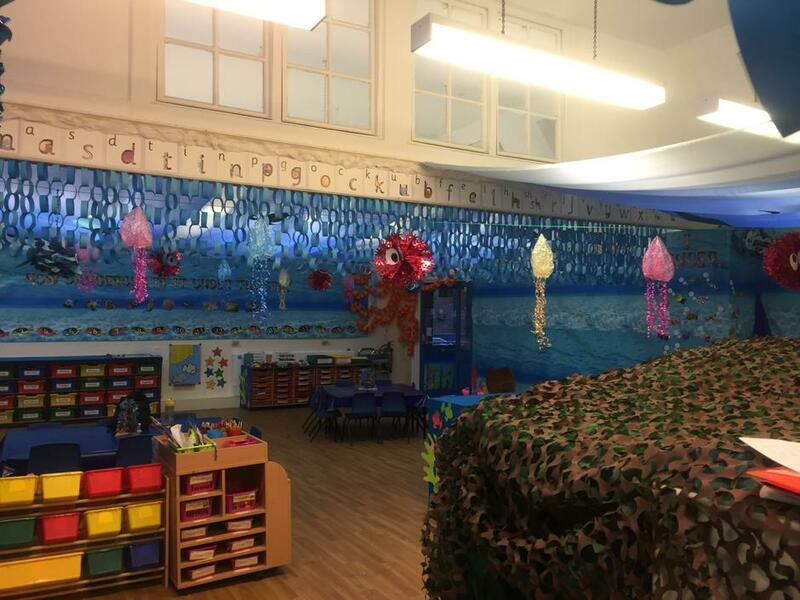 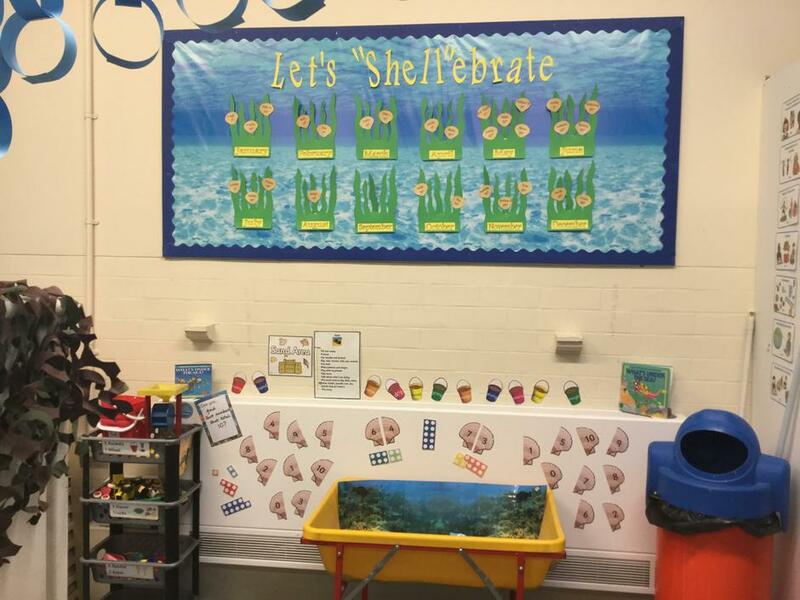 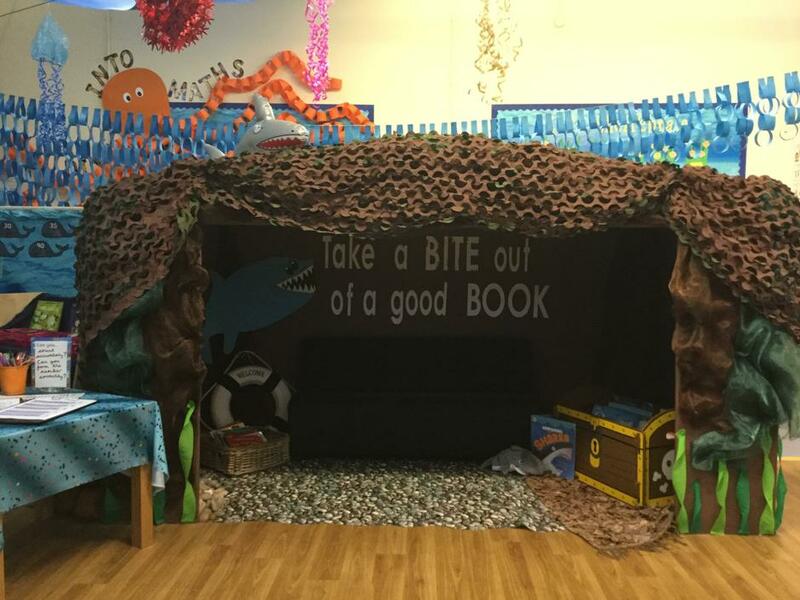 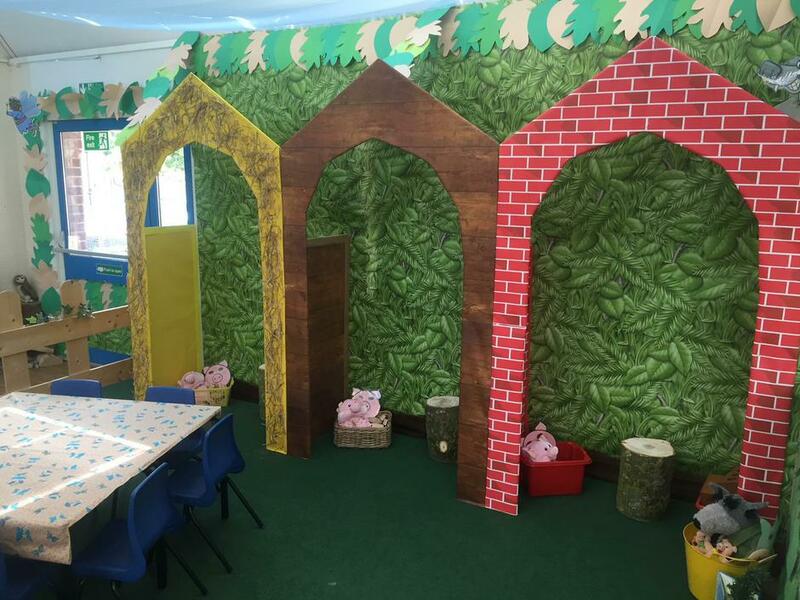 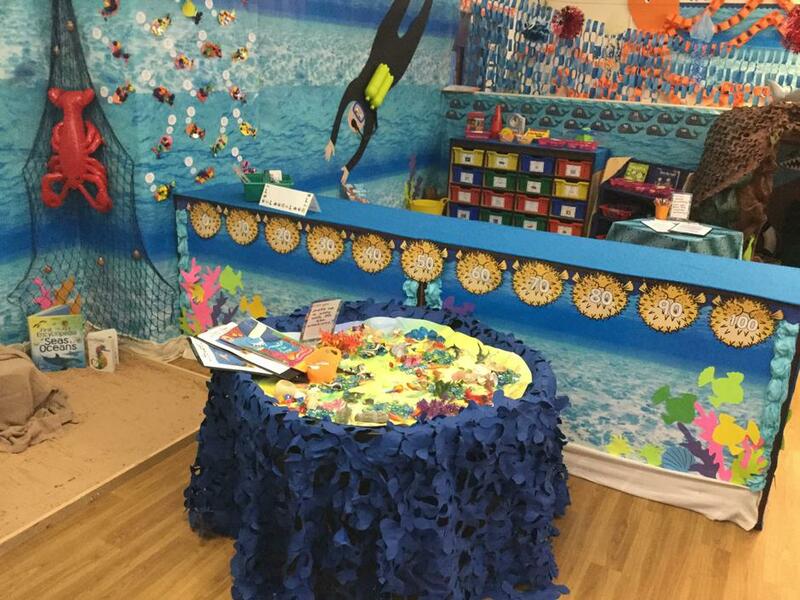 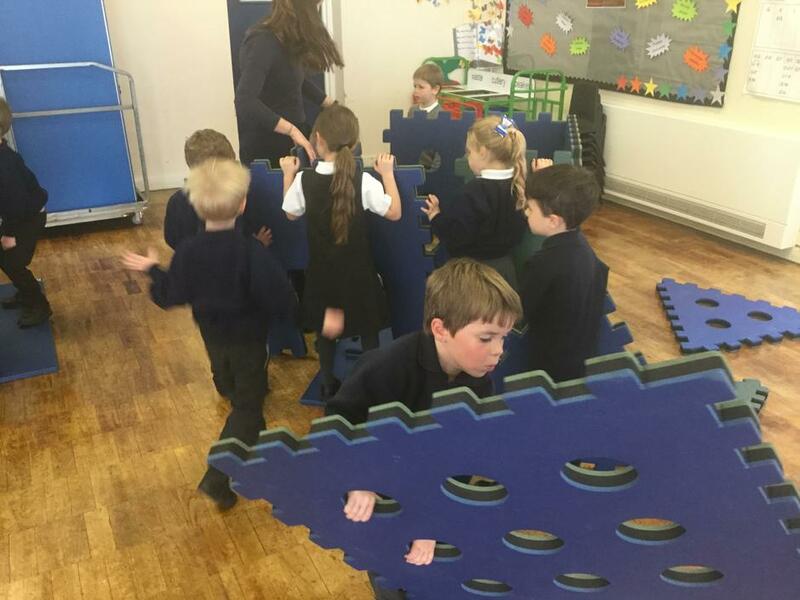 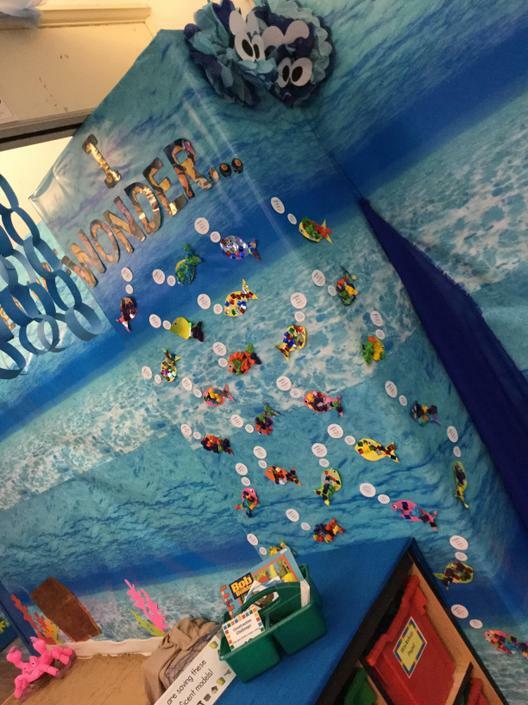 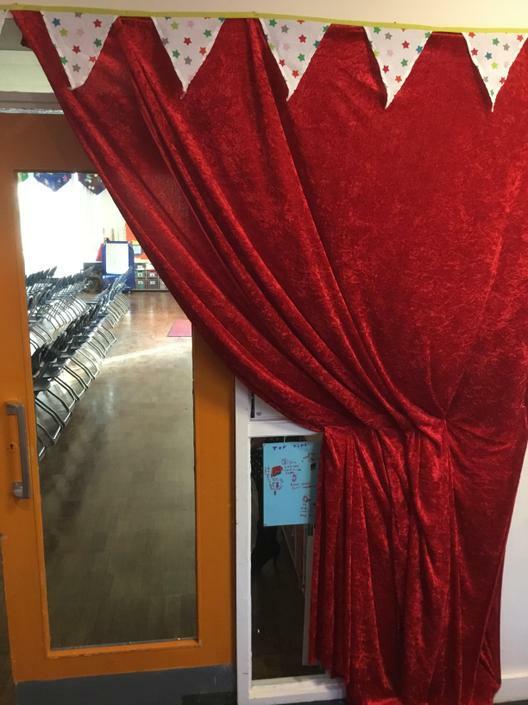 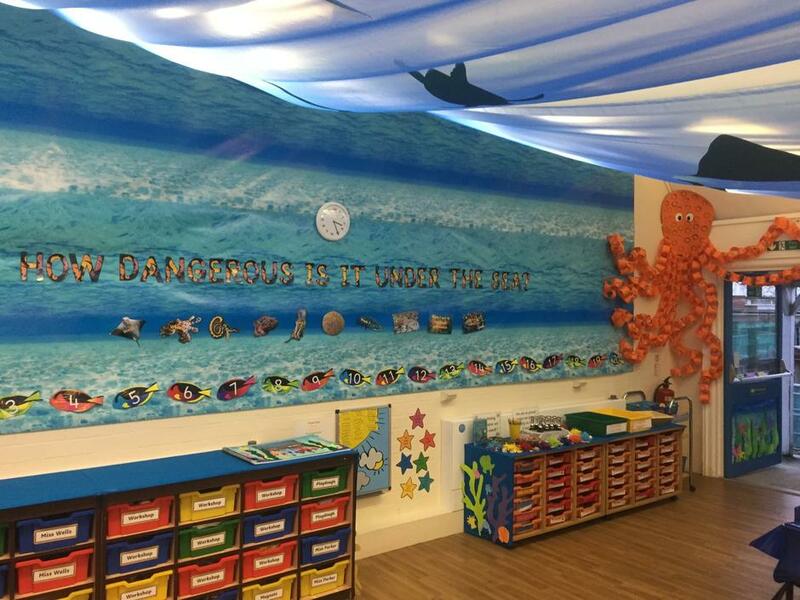 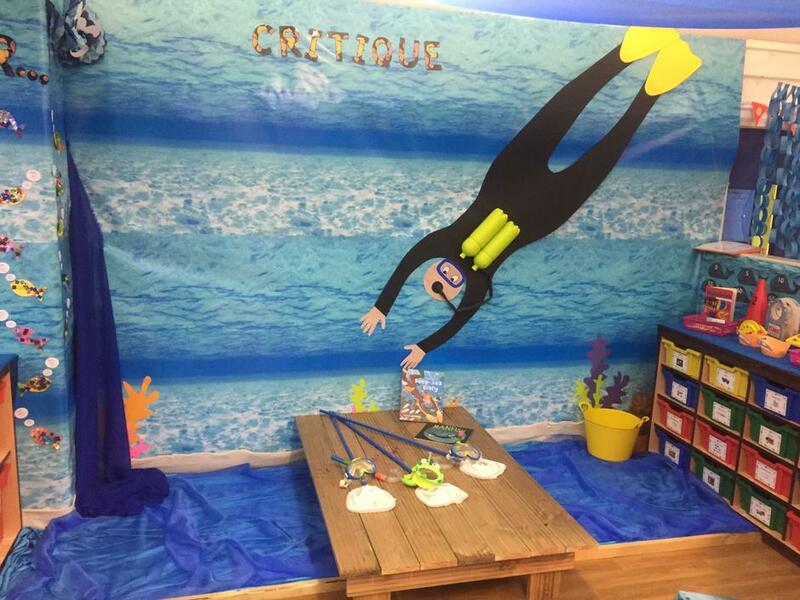 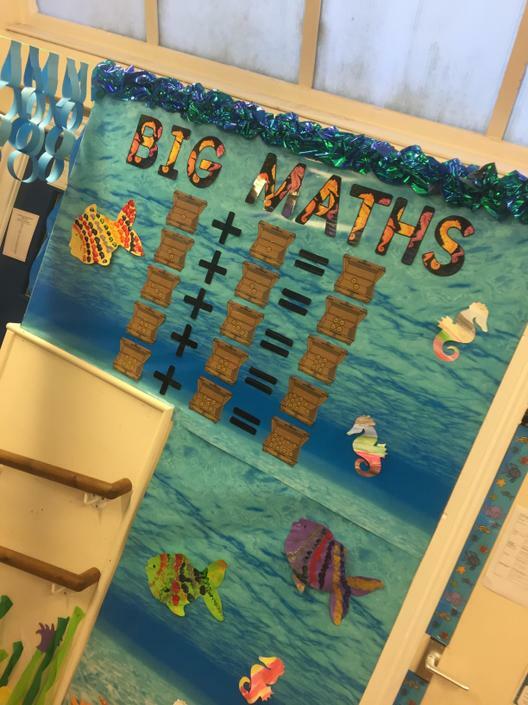 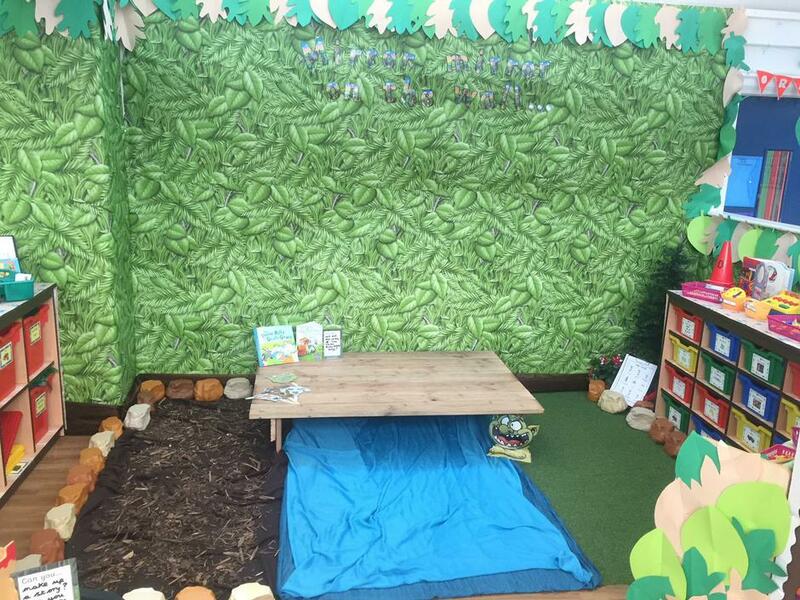 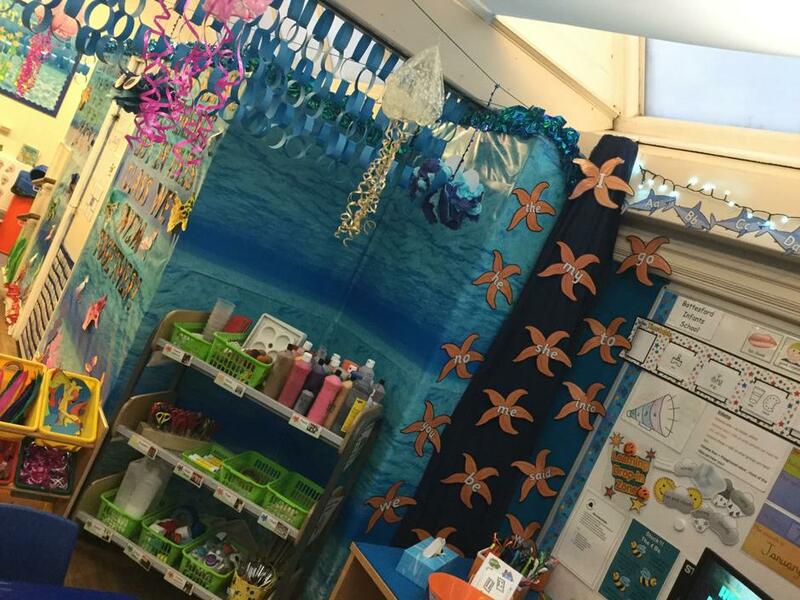 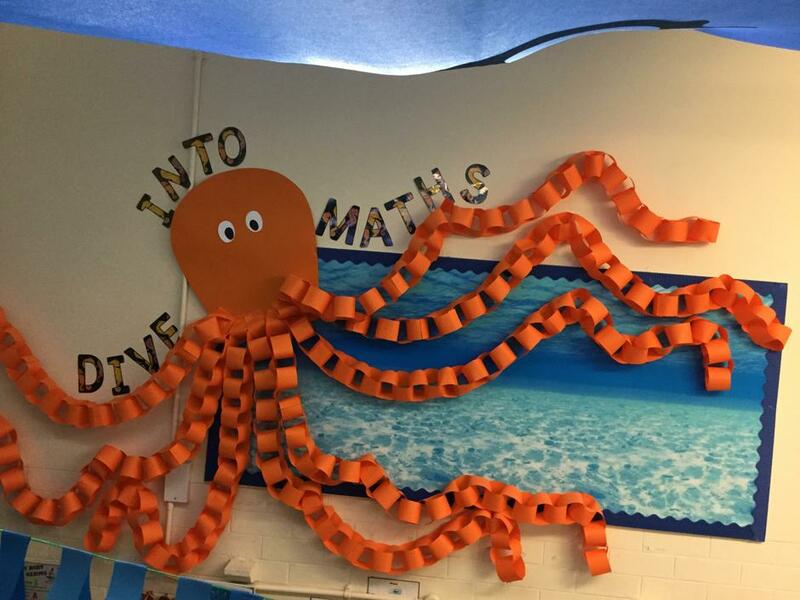 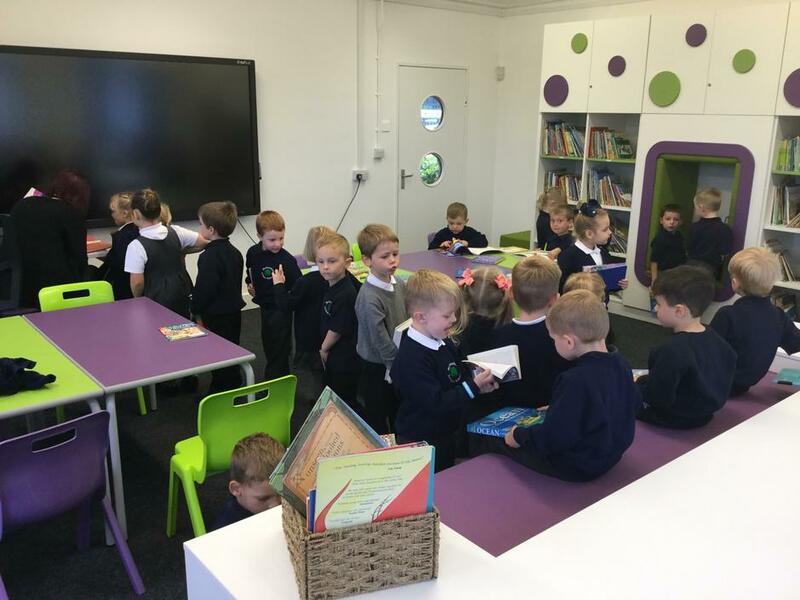 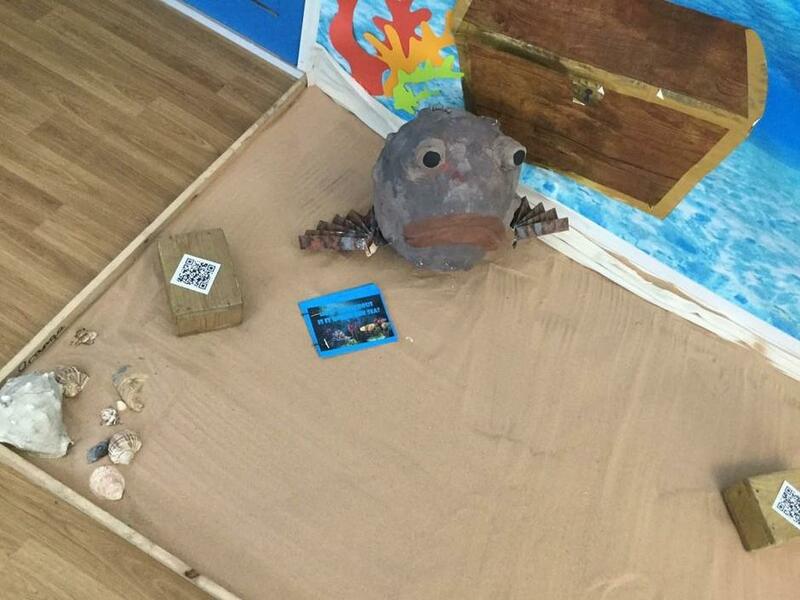 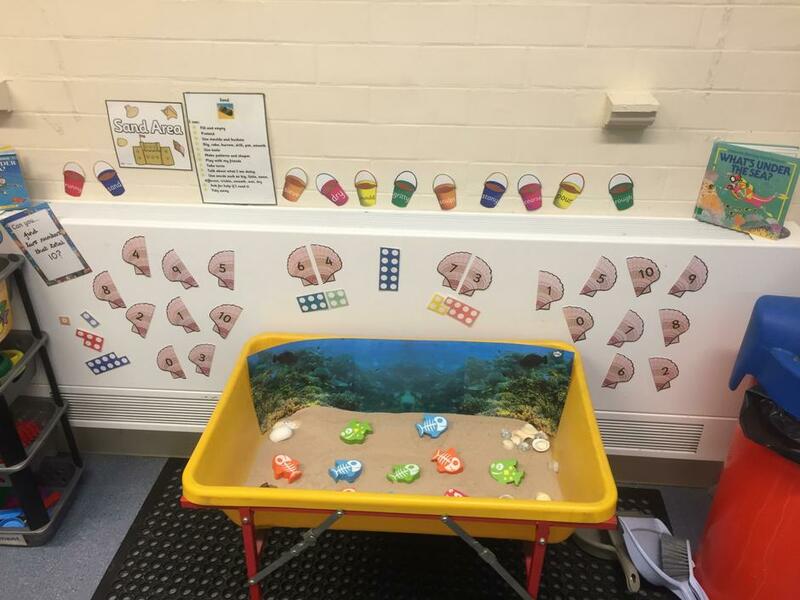 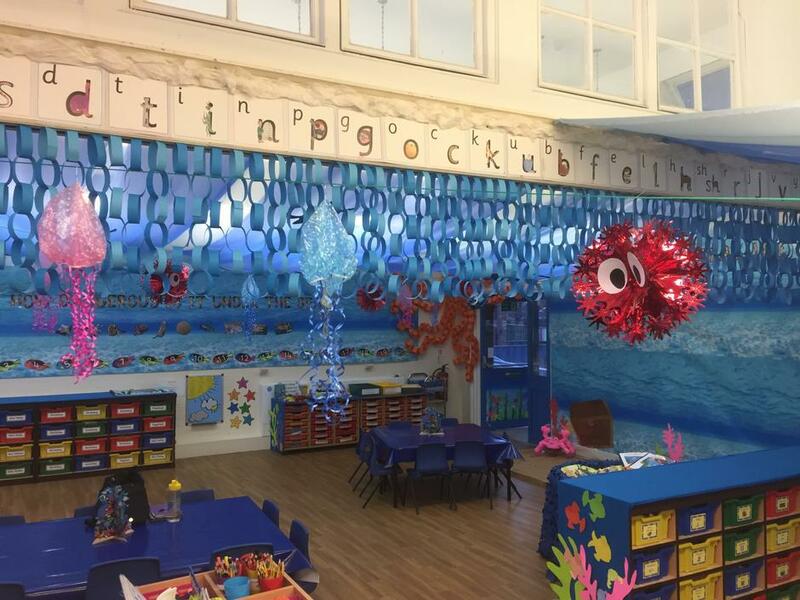 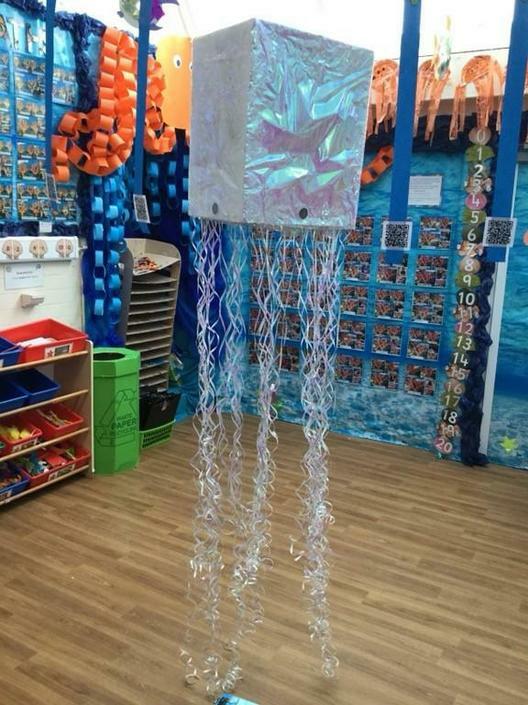 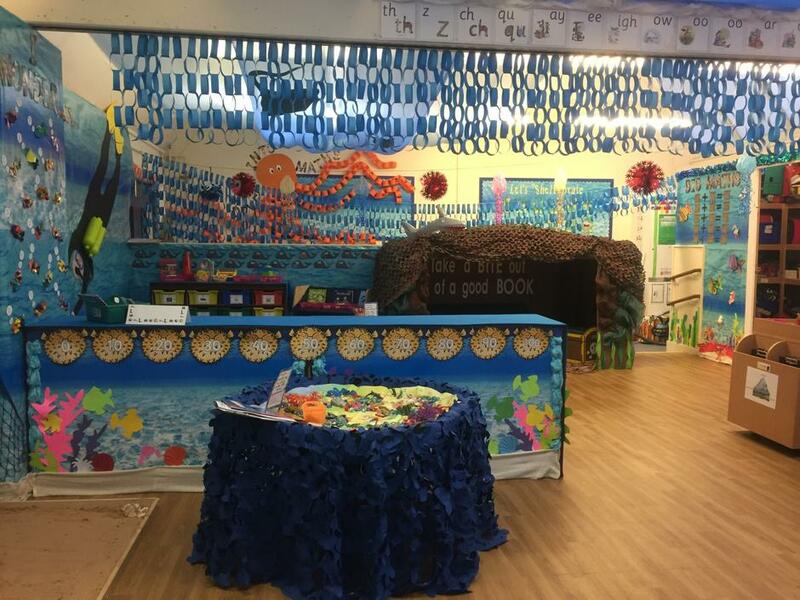 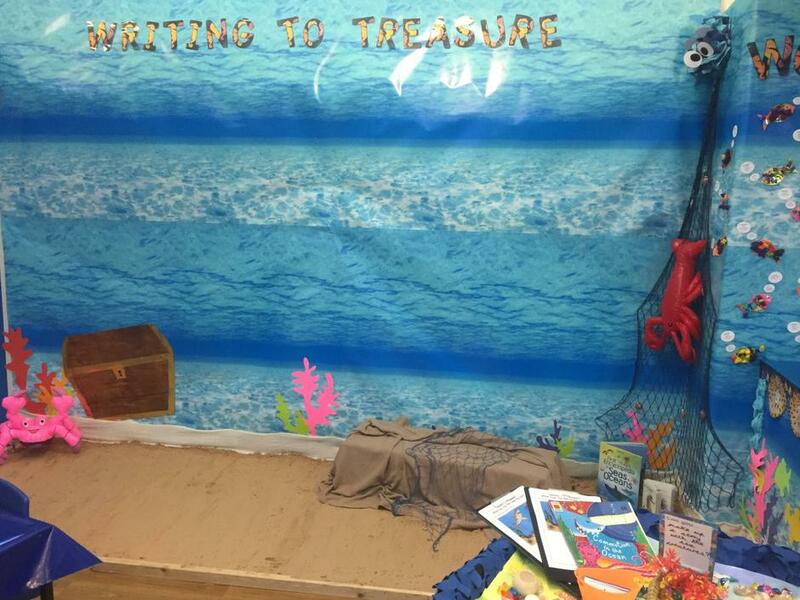 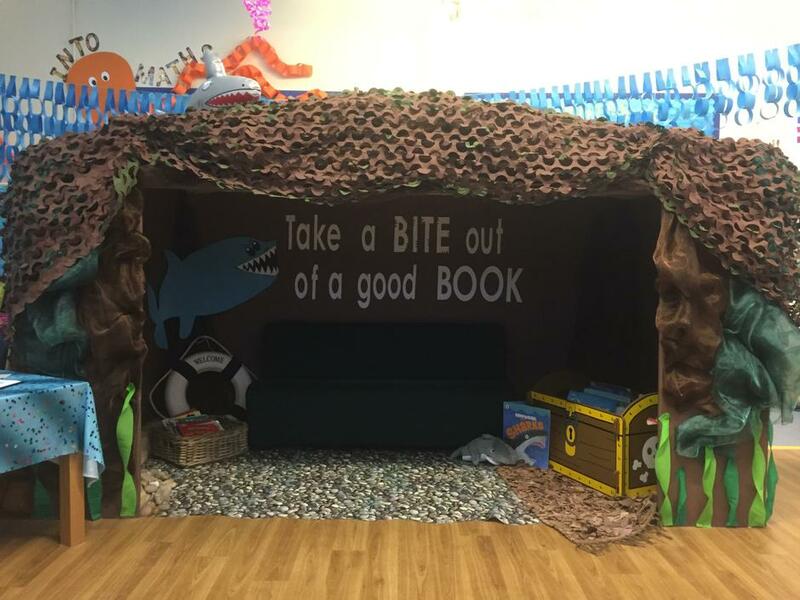 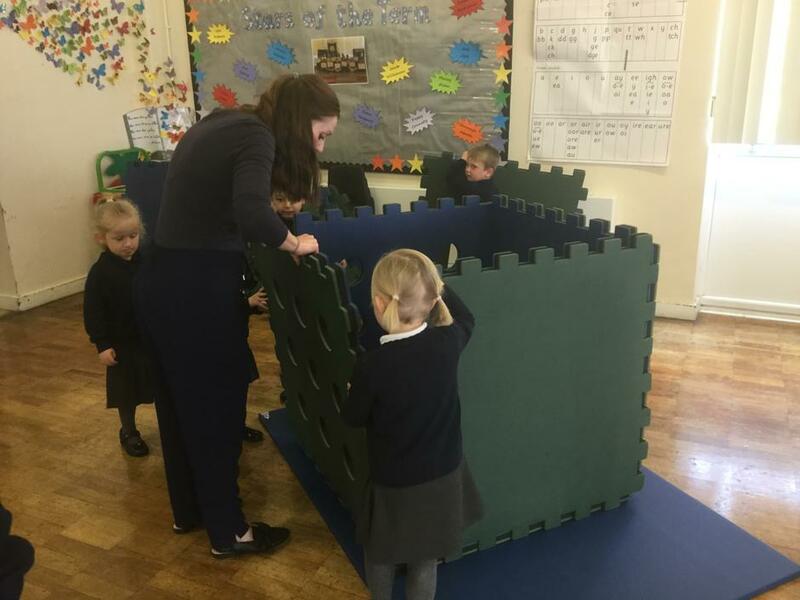 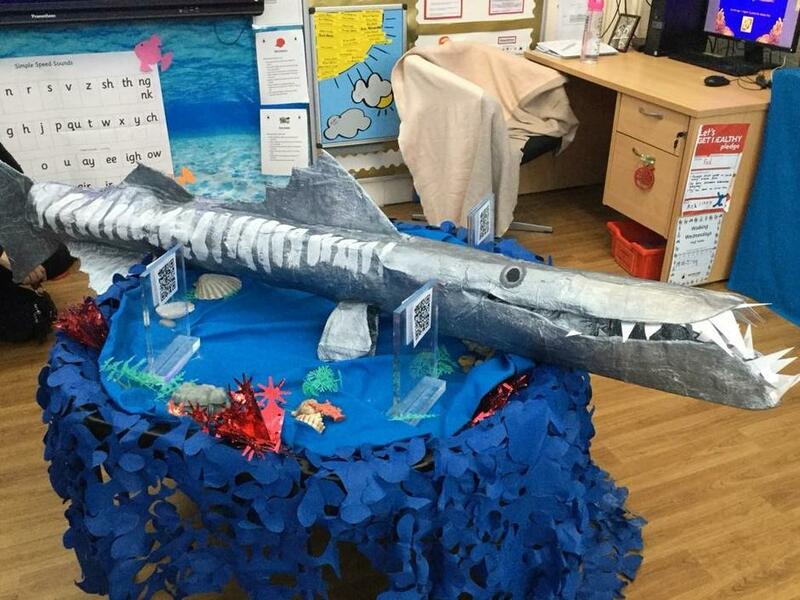 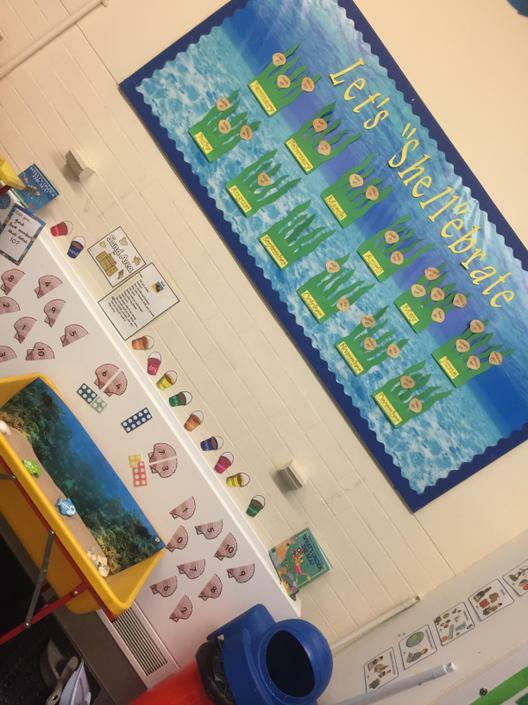 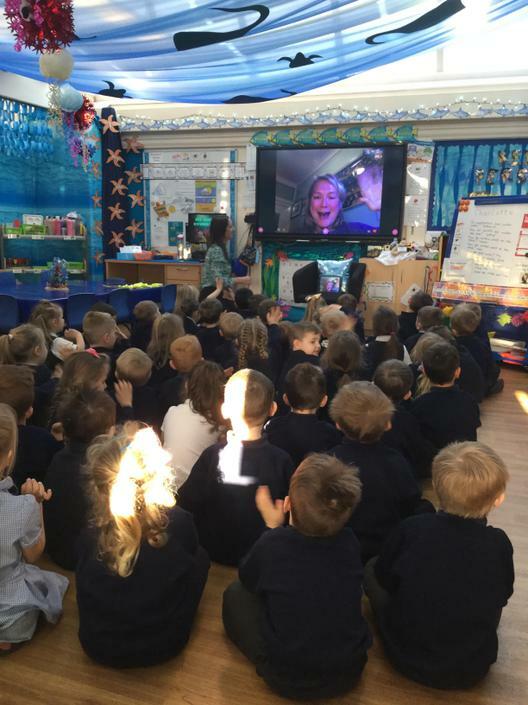 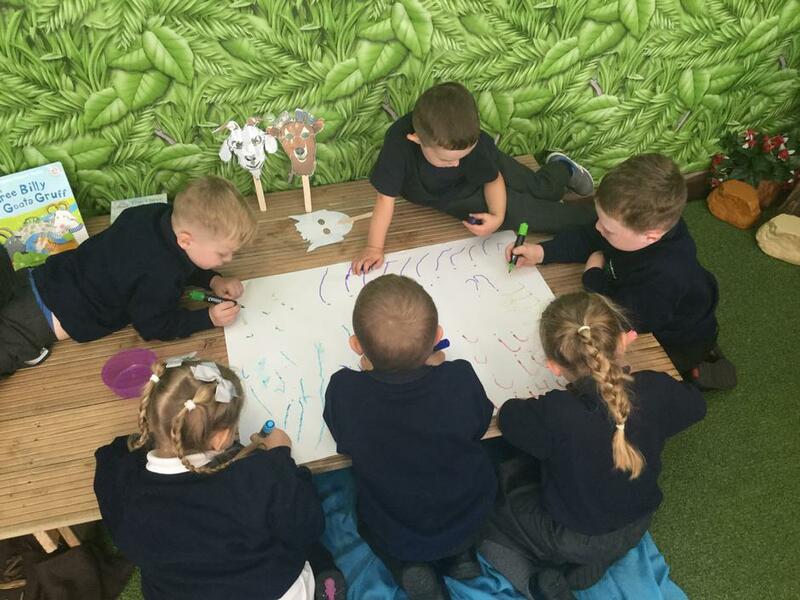 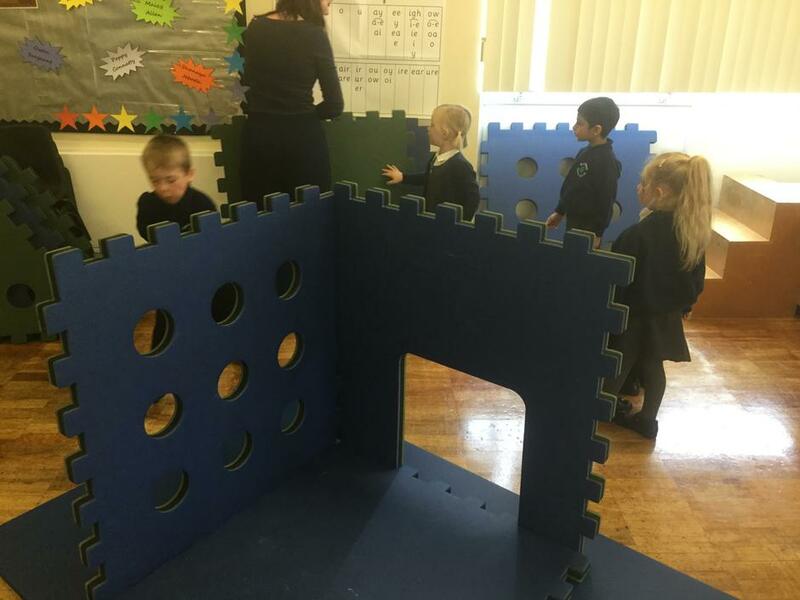 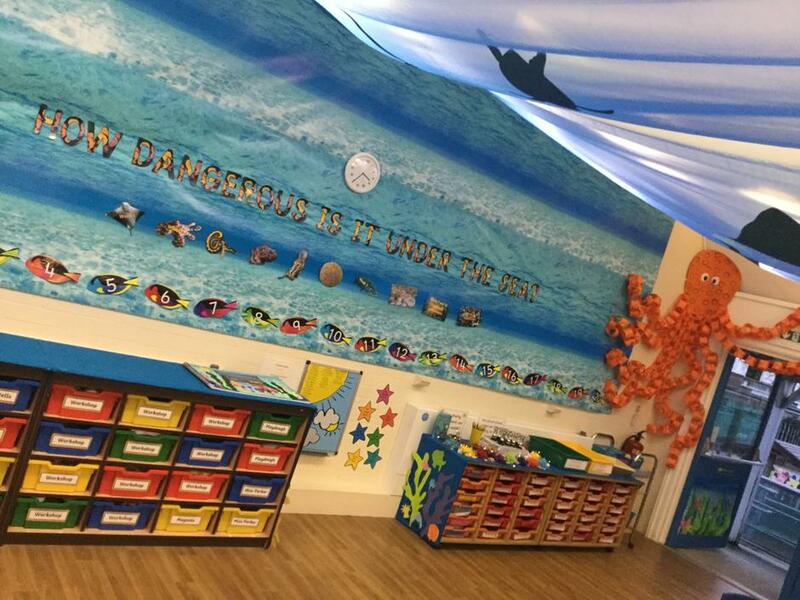 Our immersive classroom has been transformed into an ocean complete with an under the sea cave, the sandy sea bed, a diving platform and a special member of our class- Ivor the Diver! 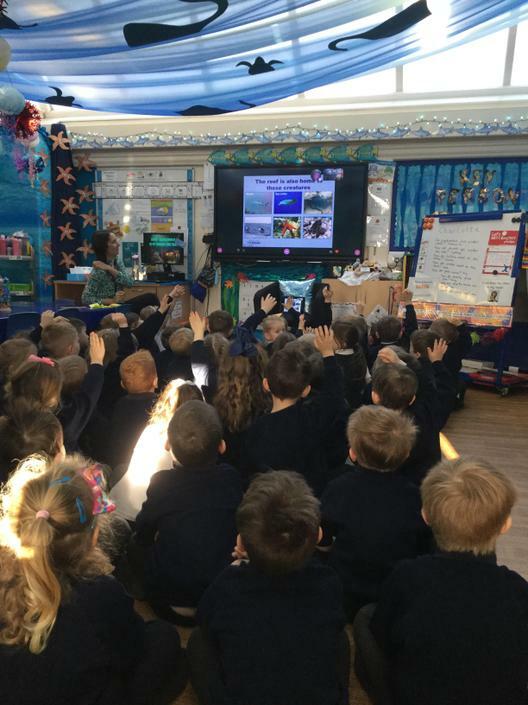 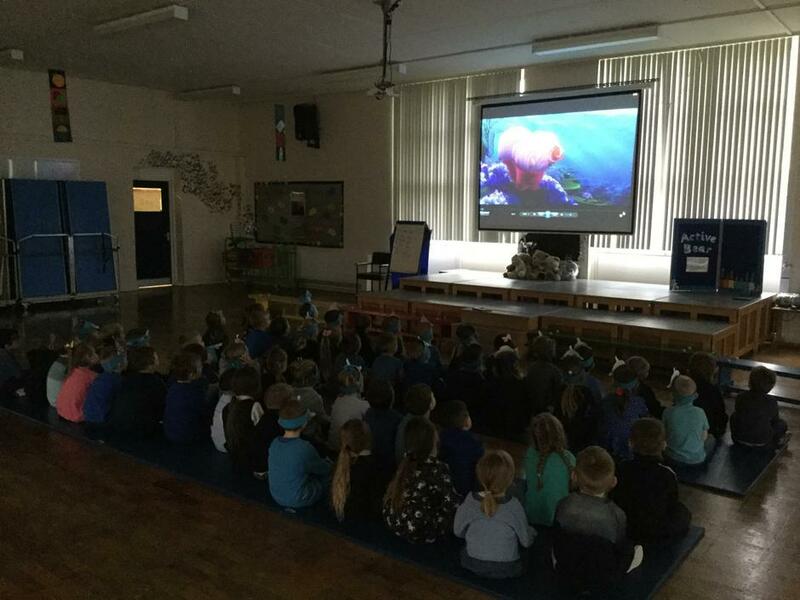 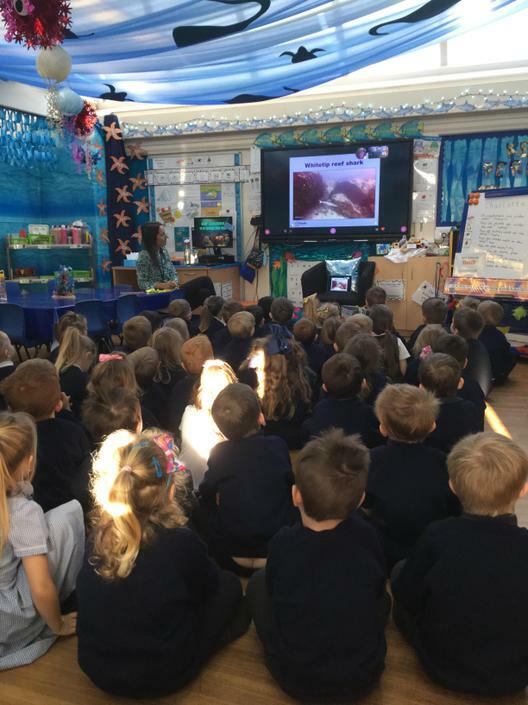 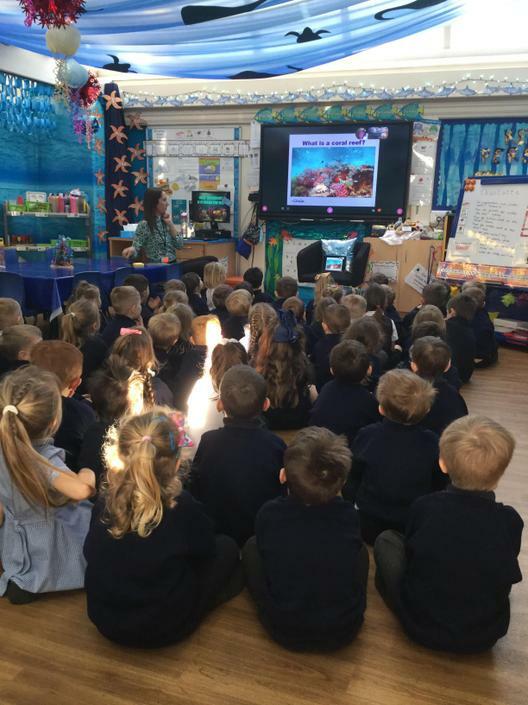 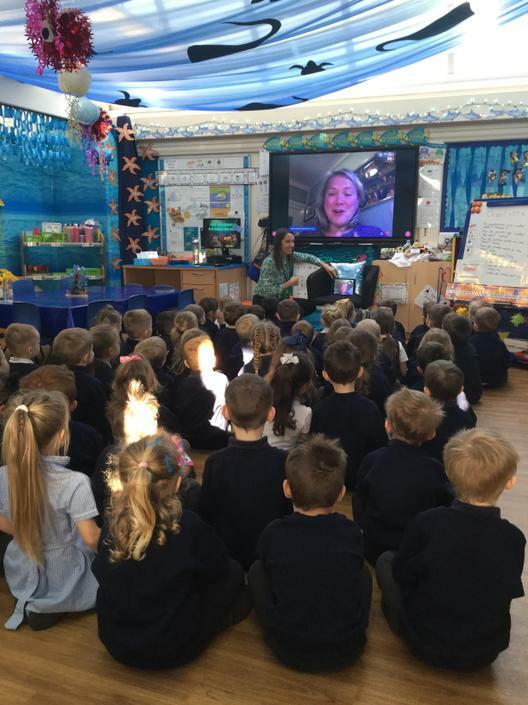 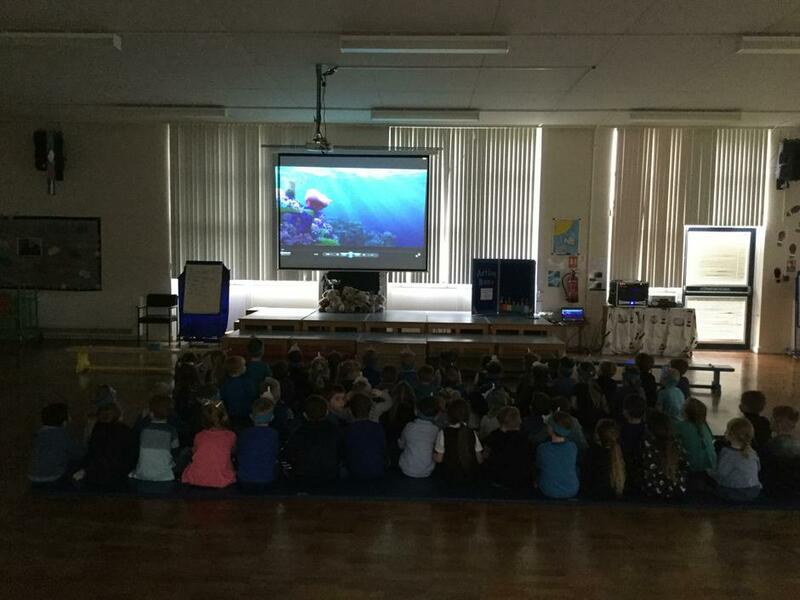 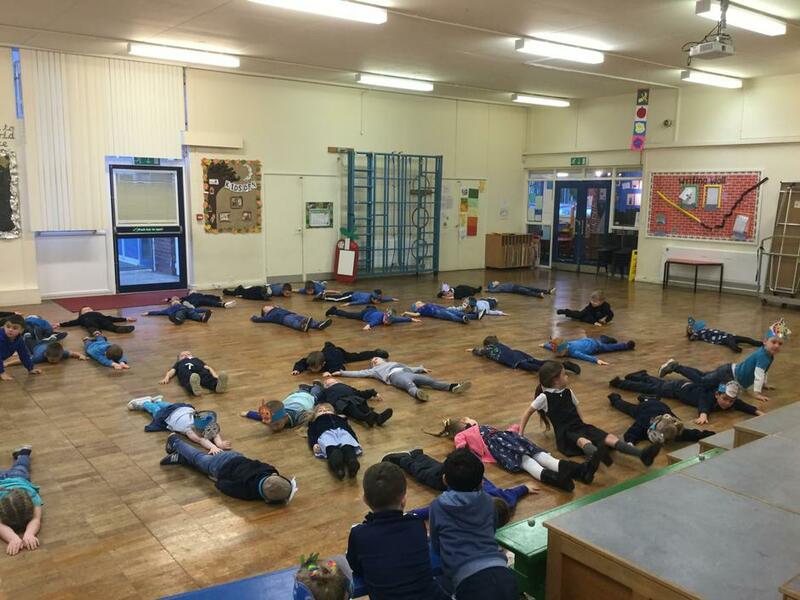 We will be learning about how dangerous it is under the sea from two perspectives: dangerous sea creatures and the effects of plastic dumped in the sea. 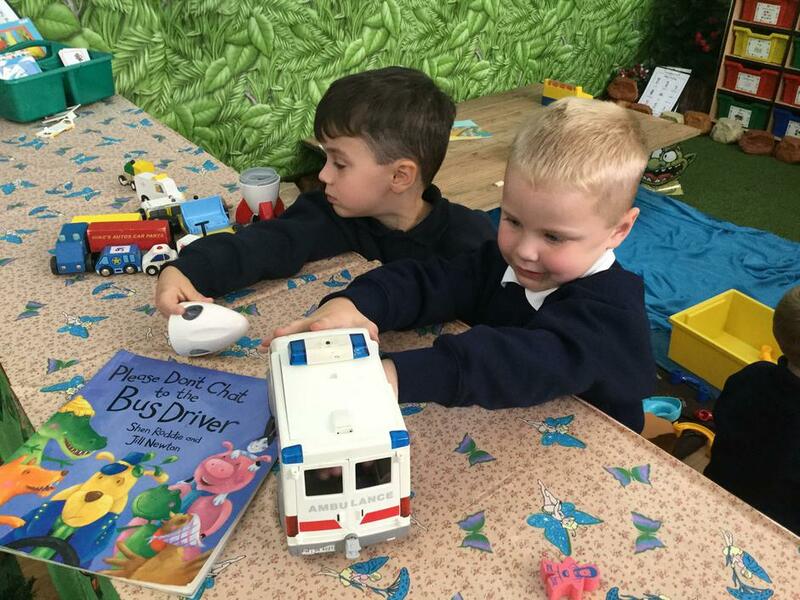 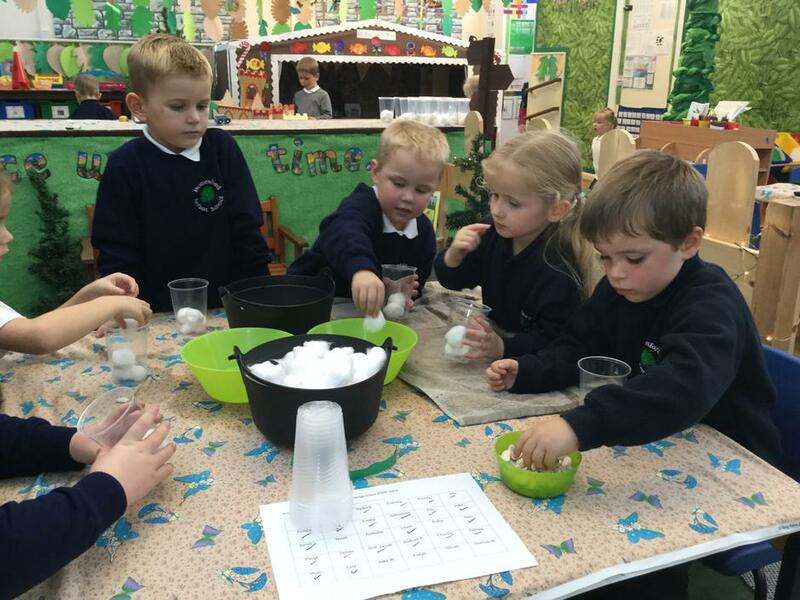 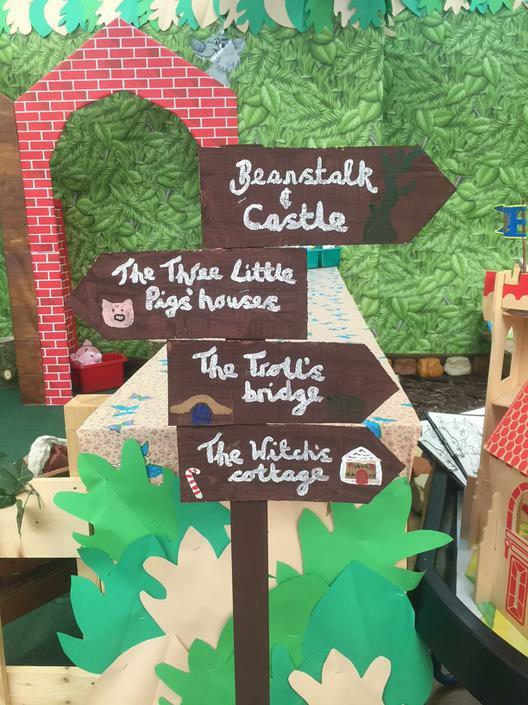 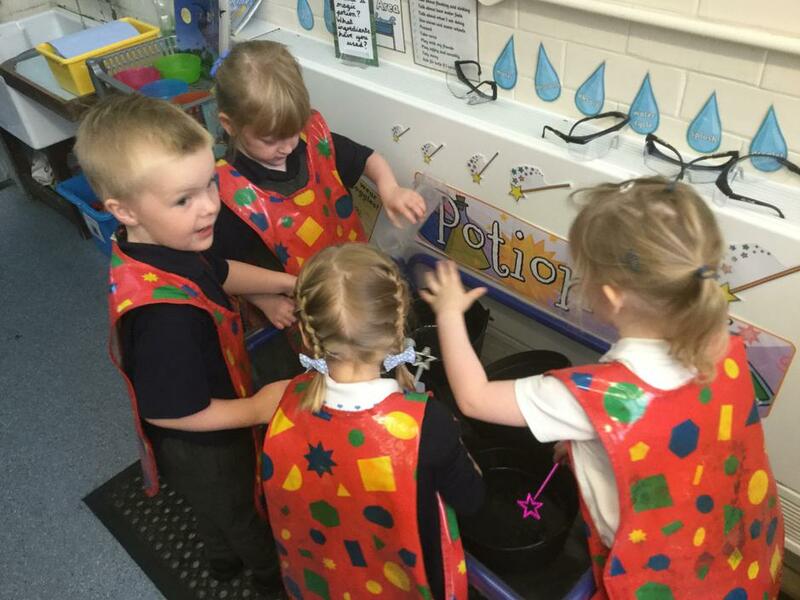 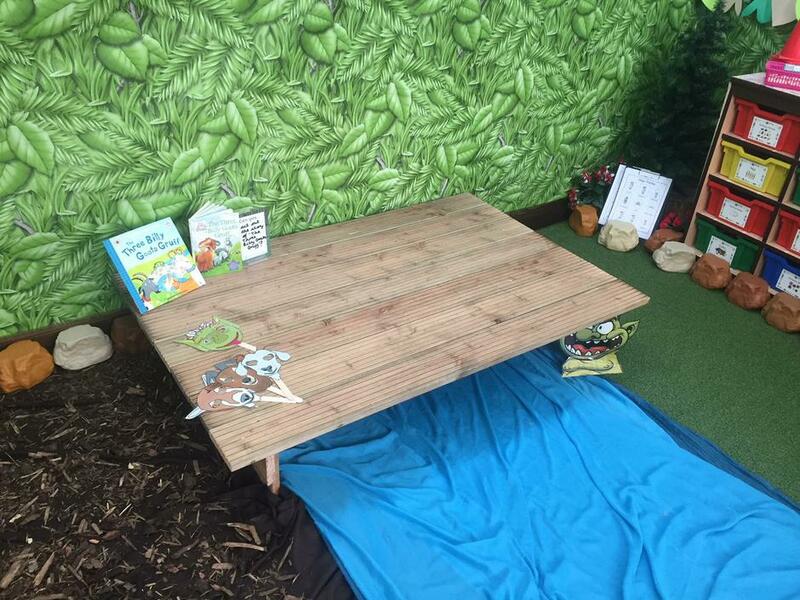 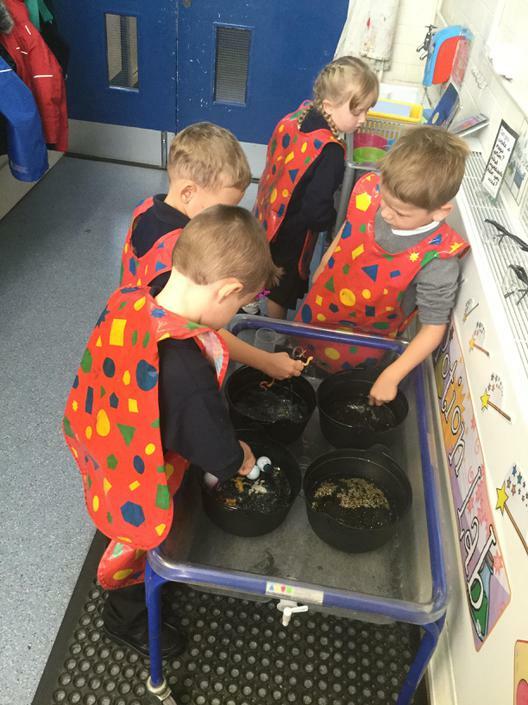 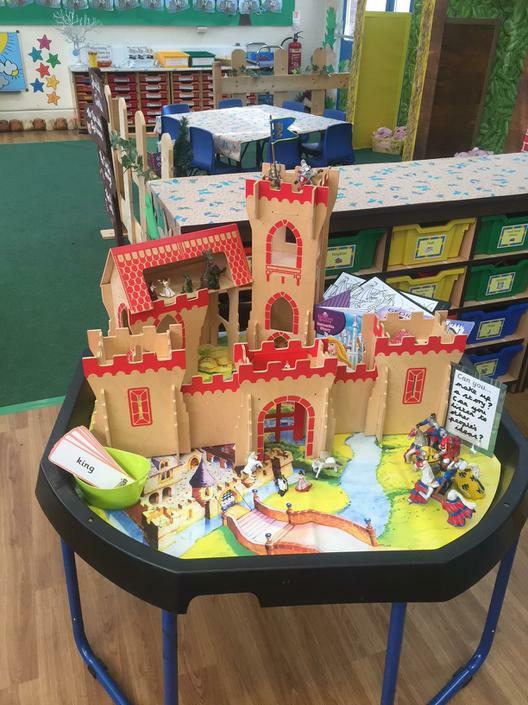 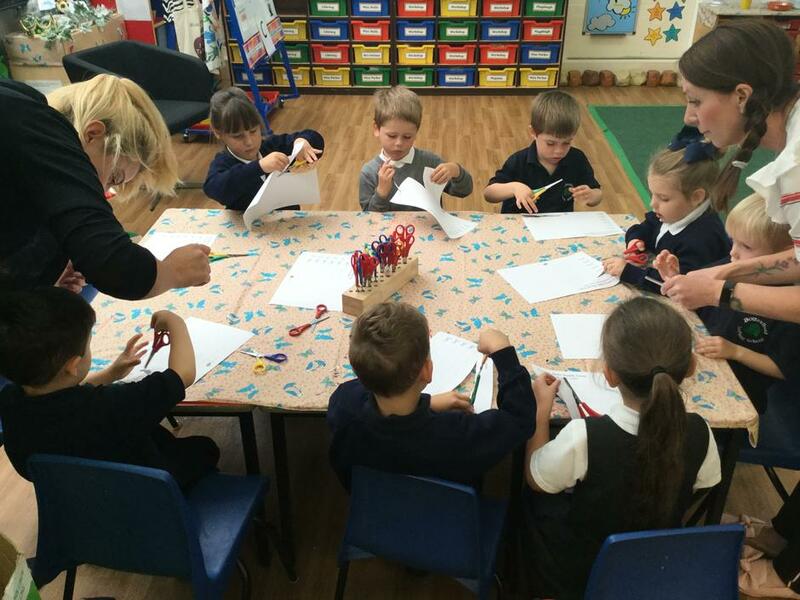 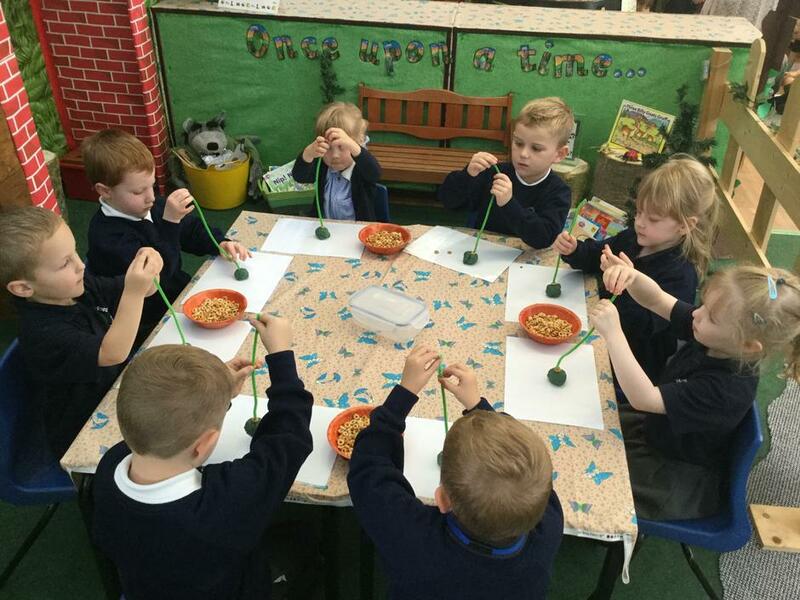 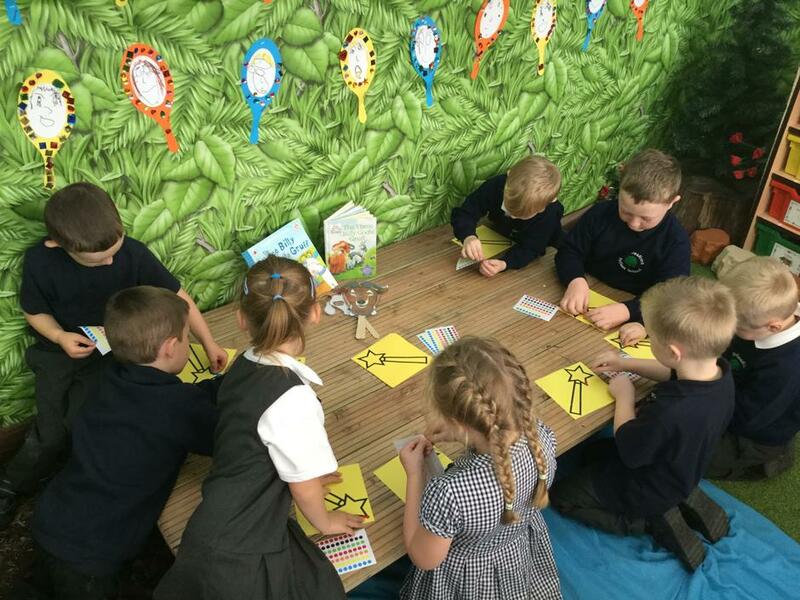 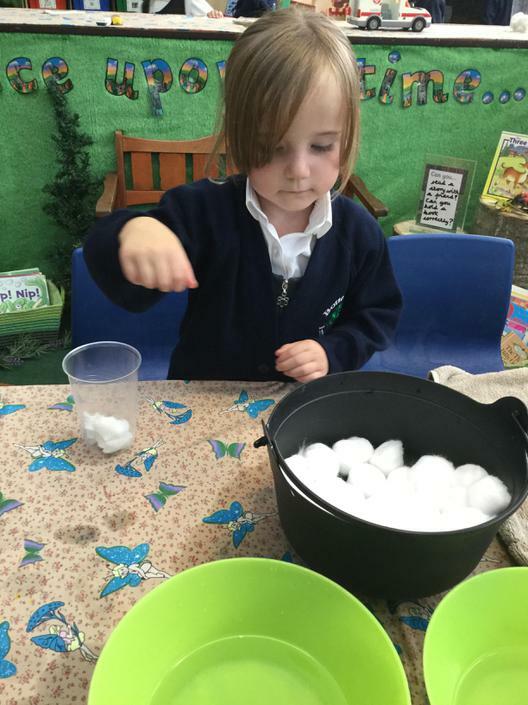 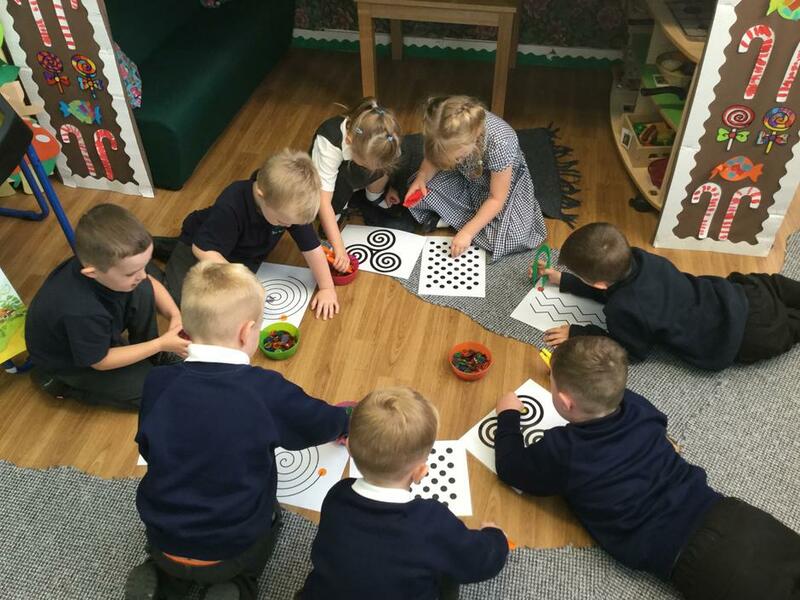 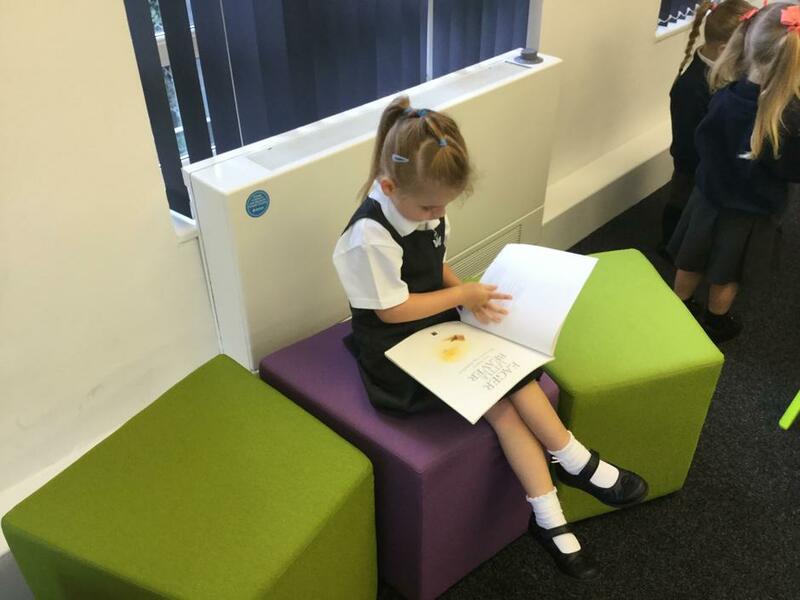 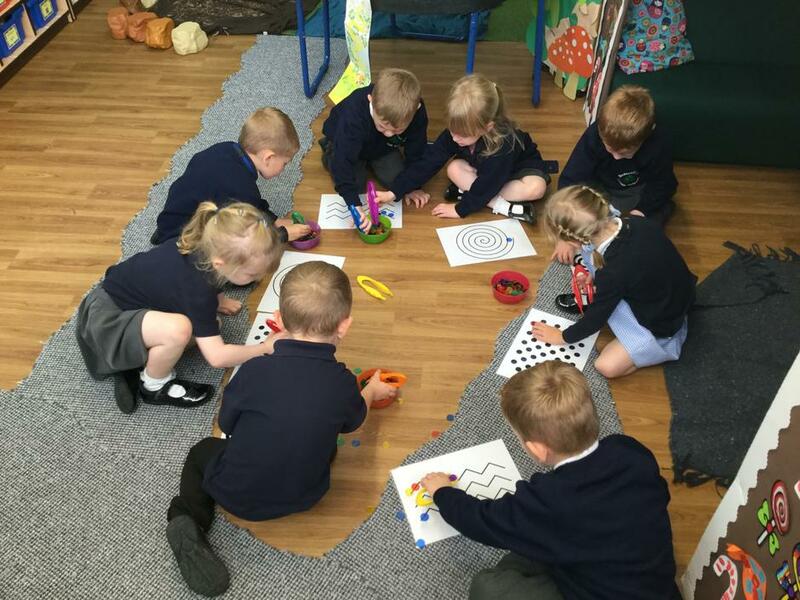 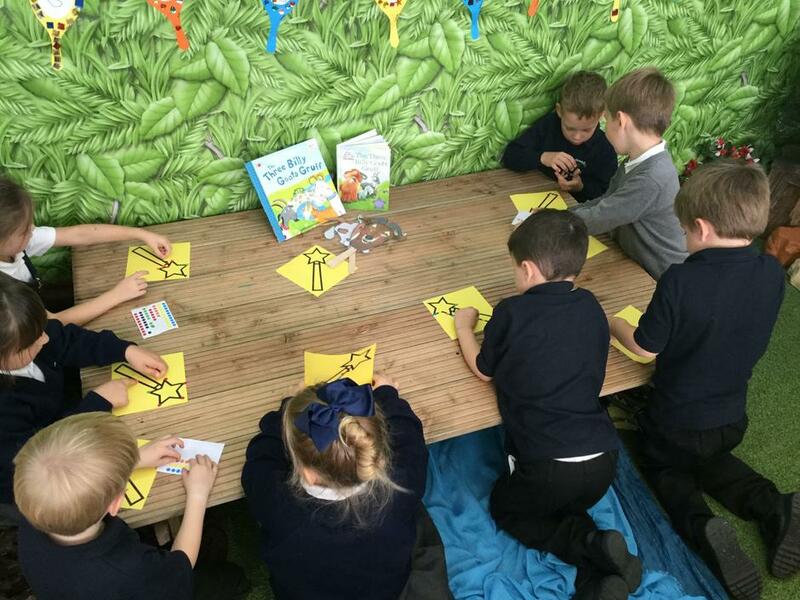 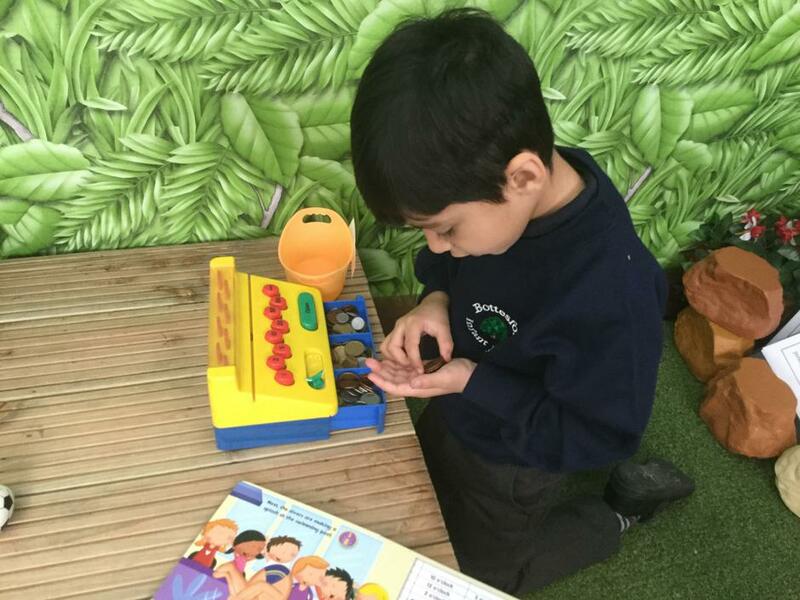 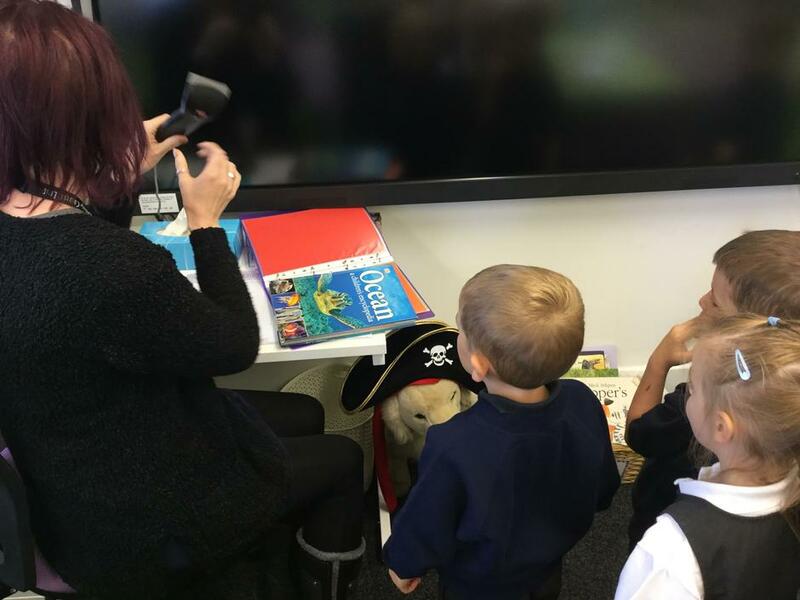 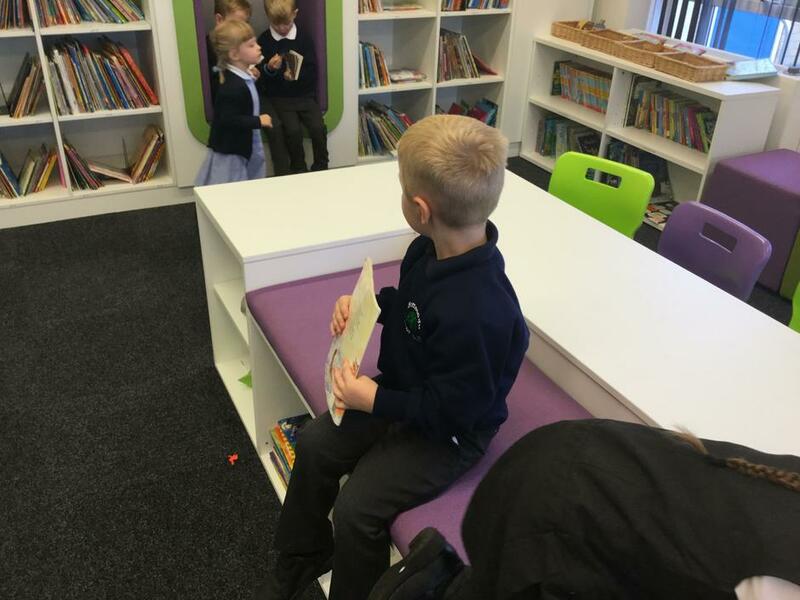 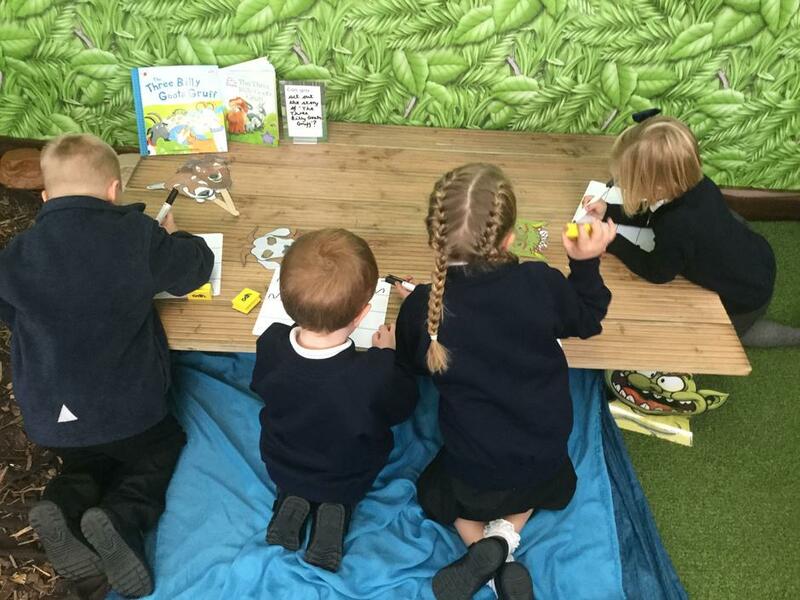 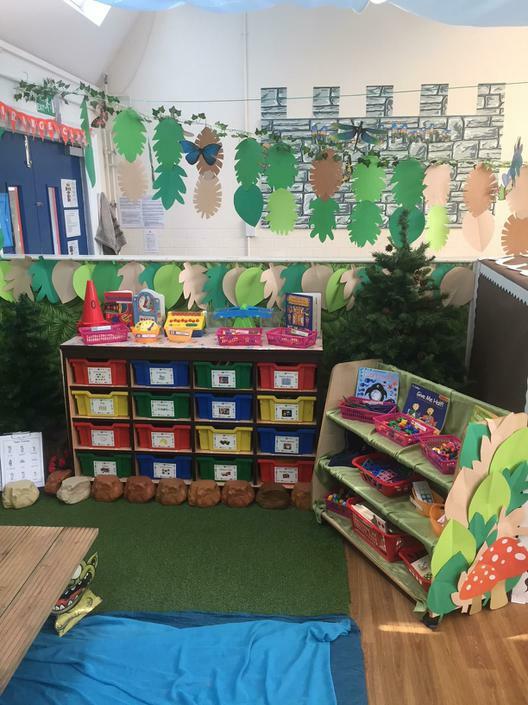 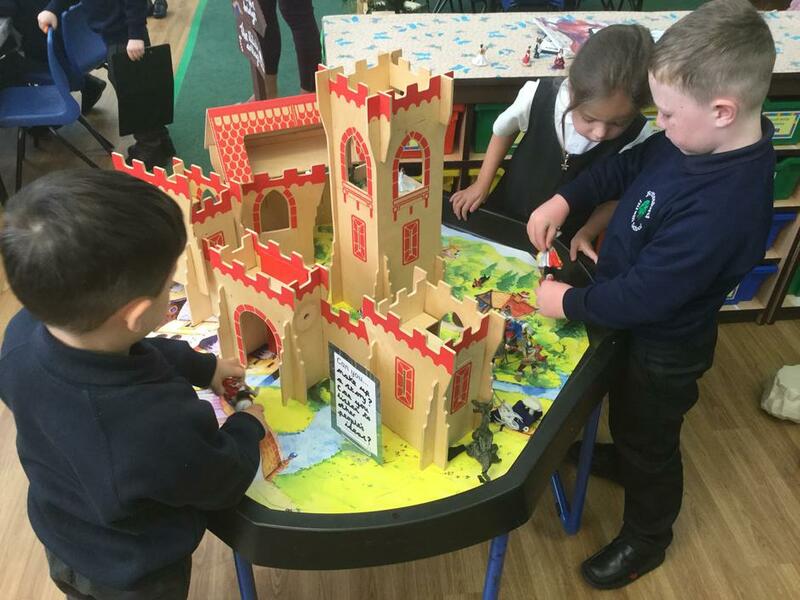 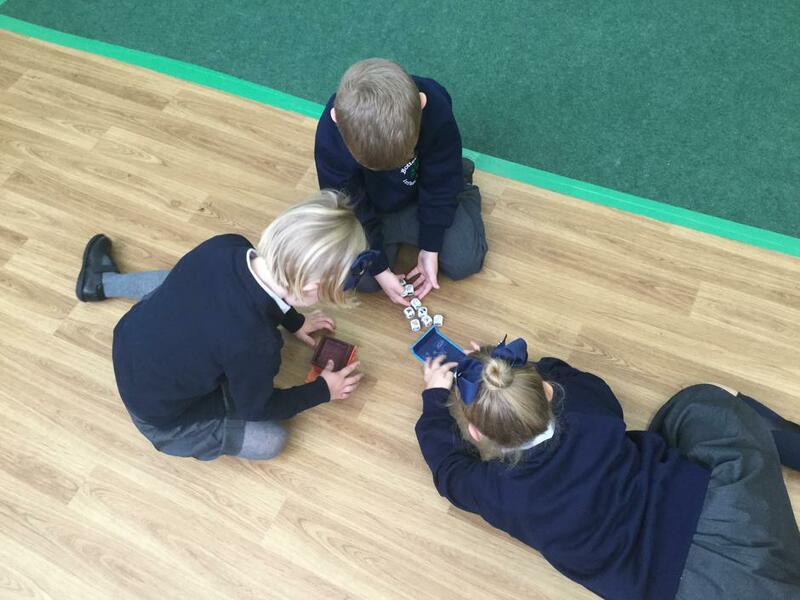 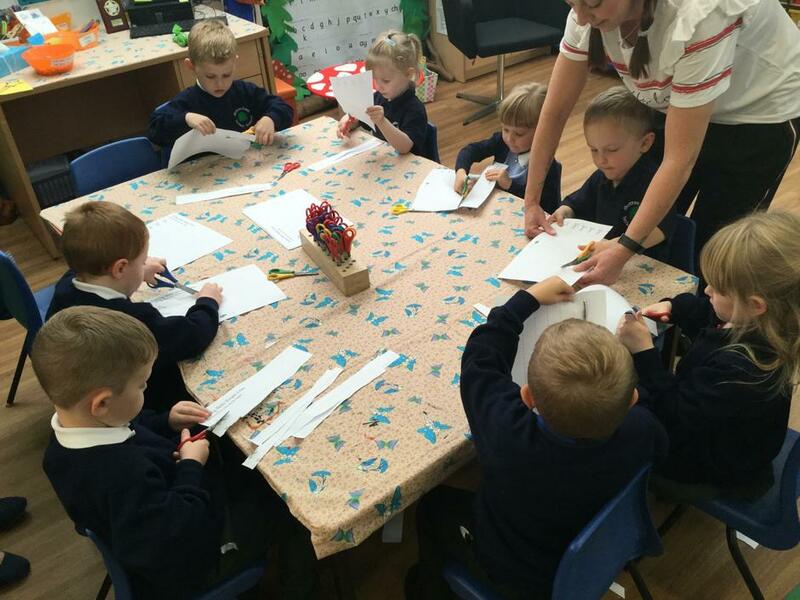 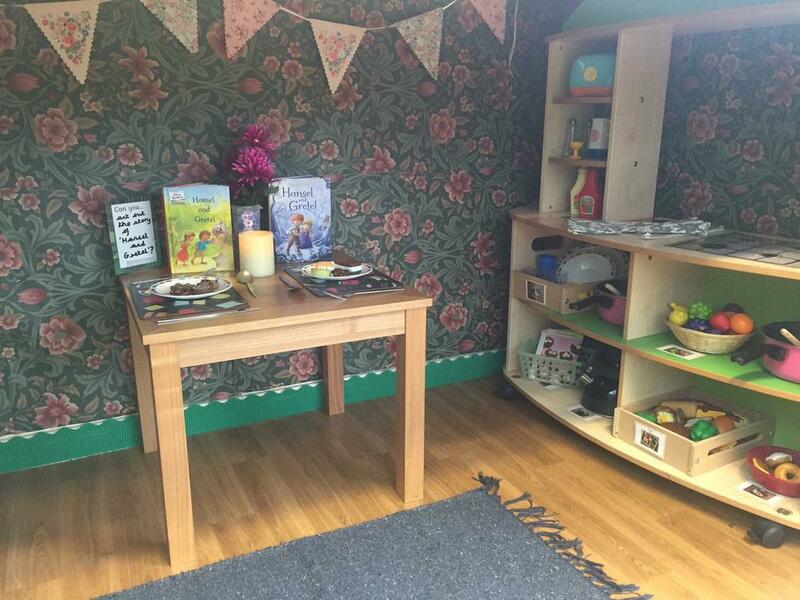 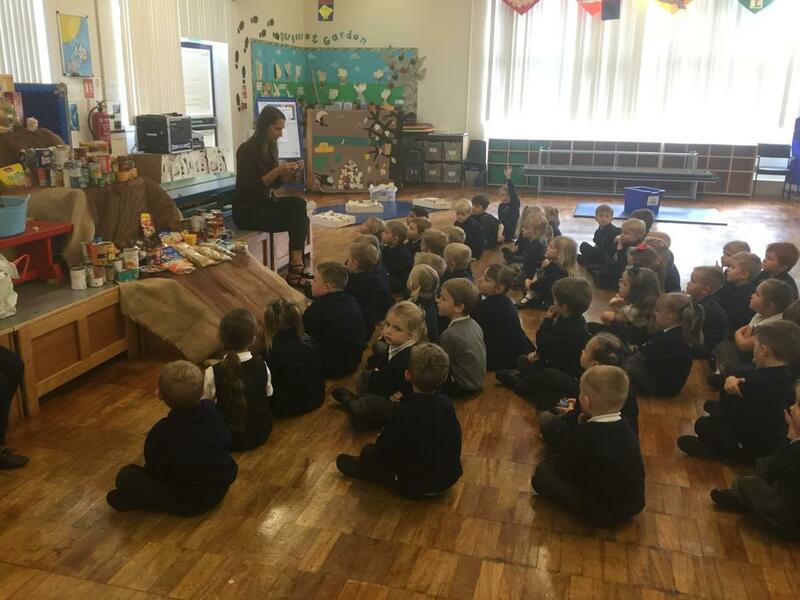 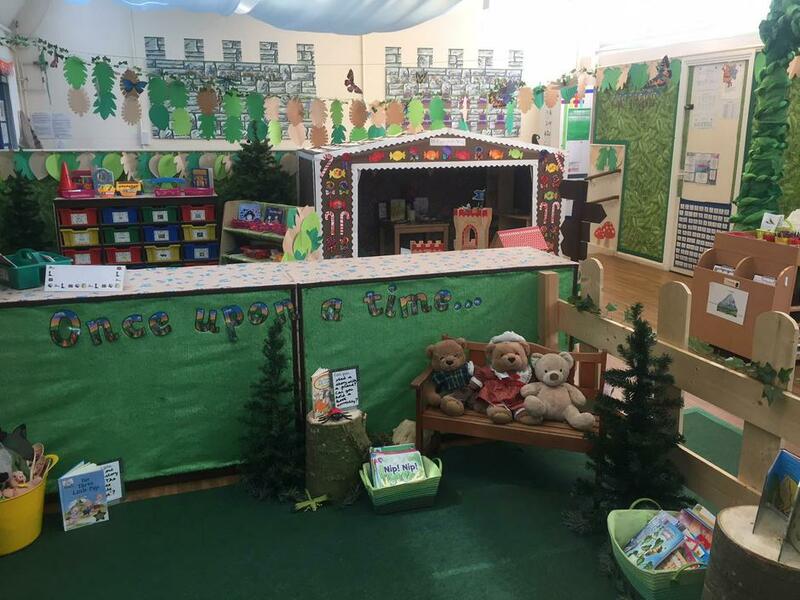 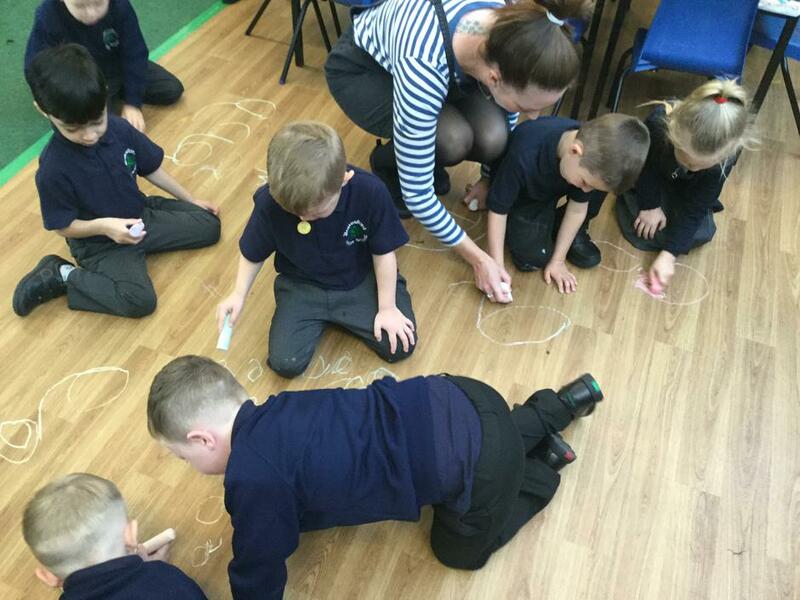 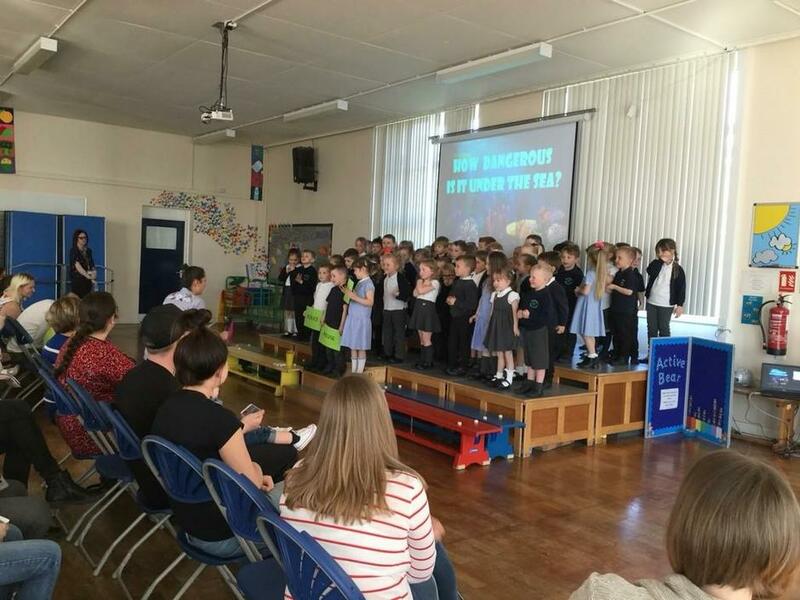 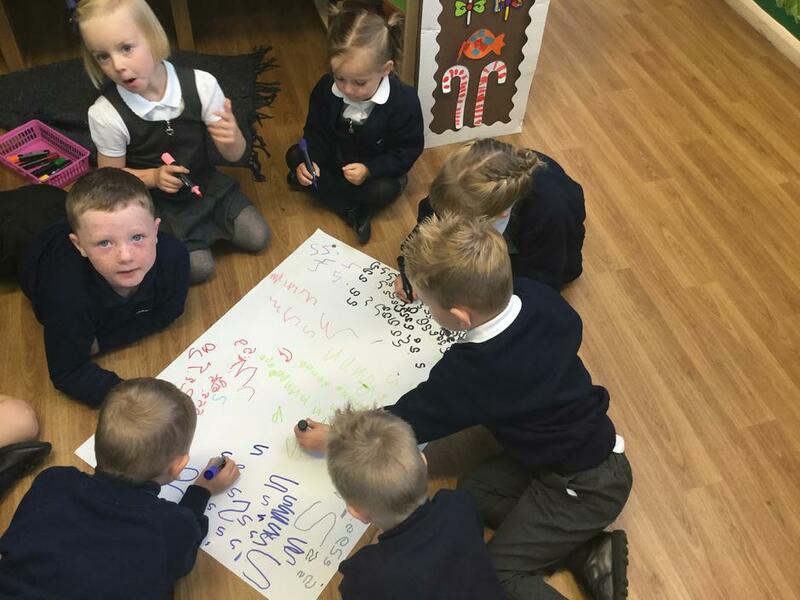 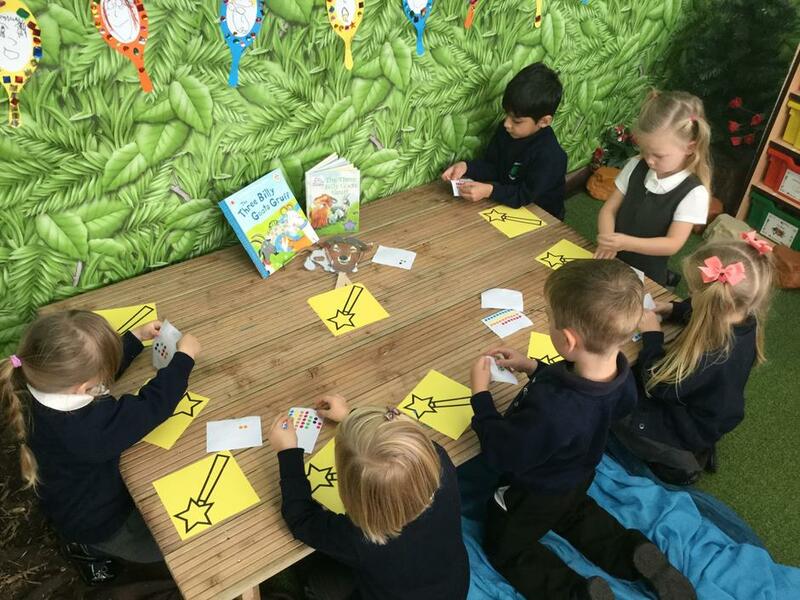 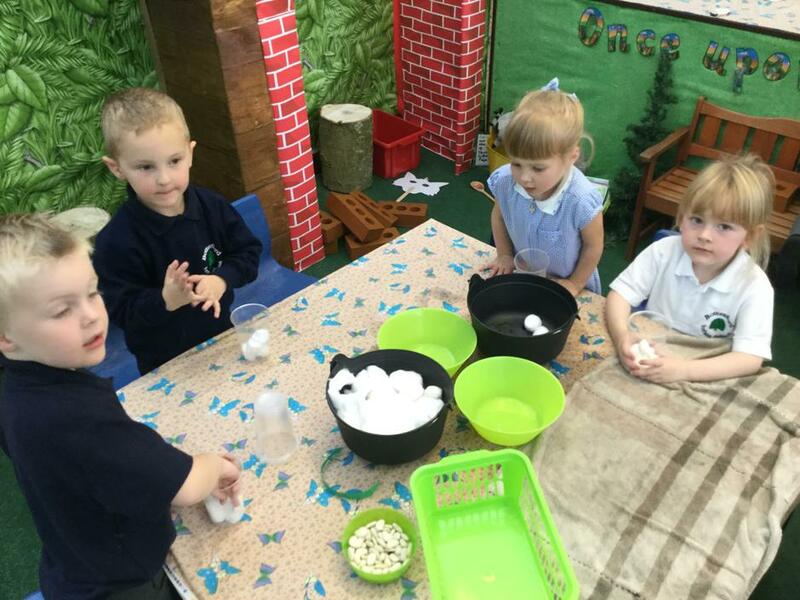 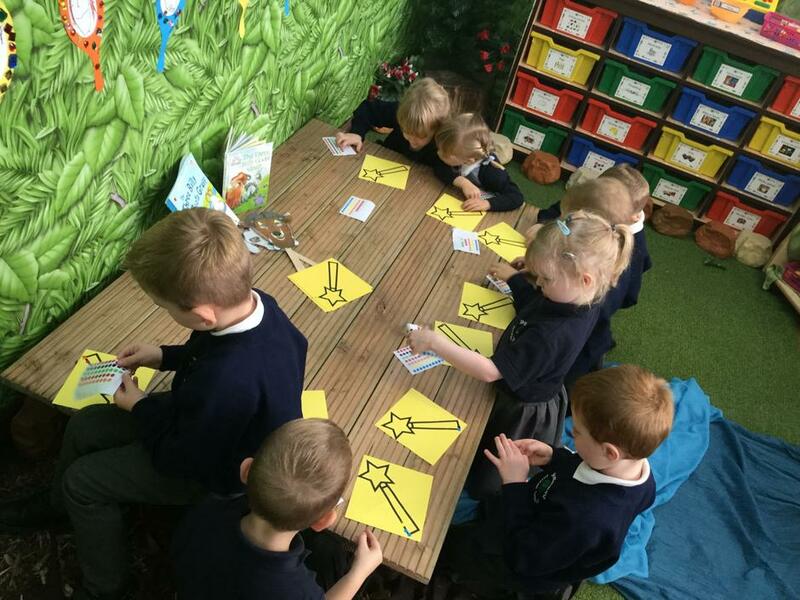 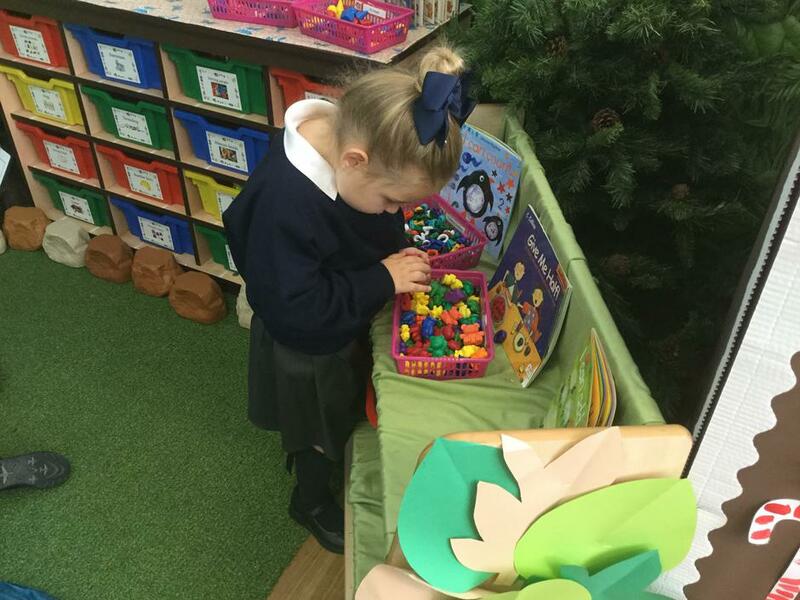 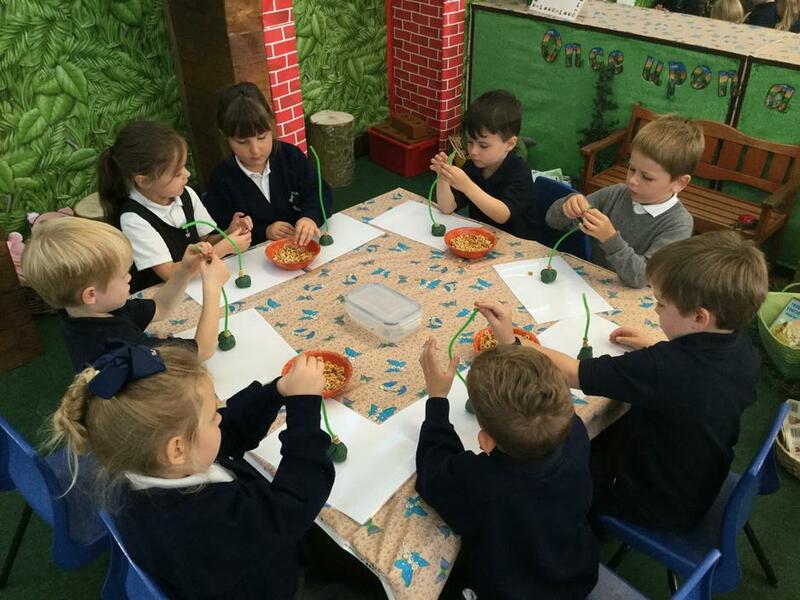 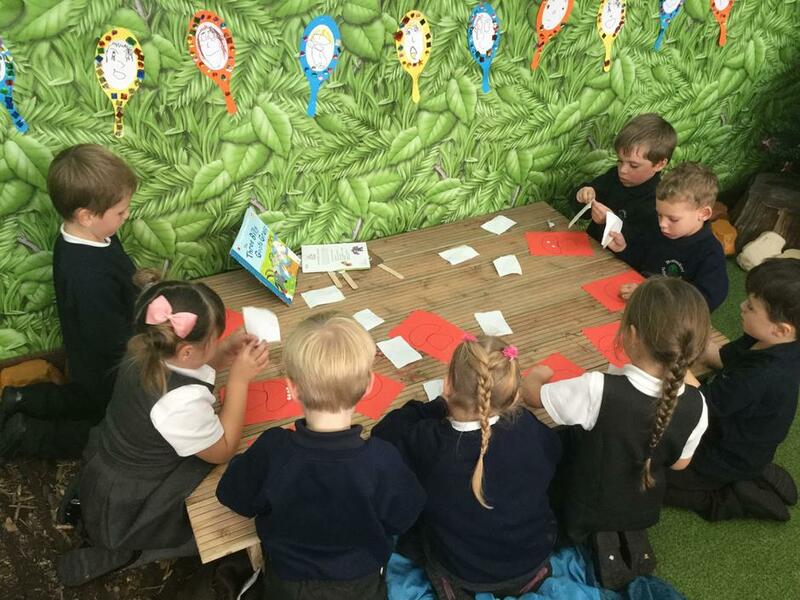 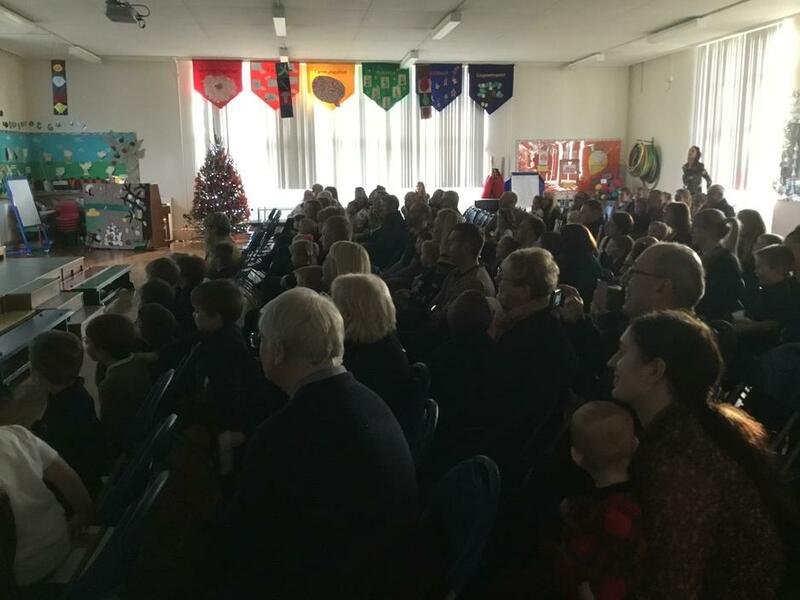 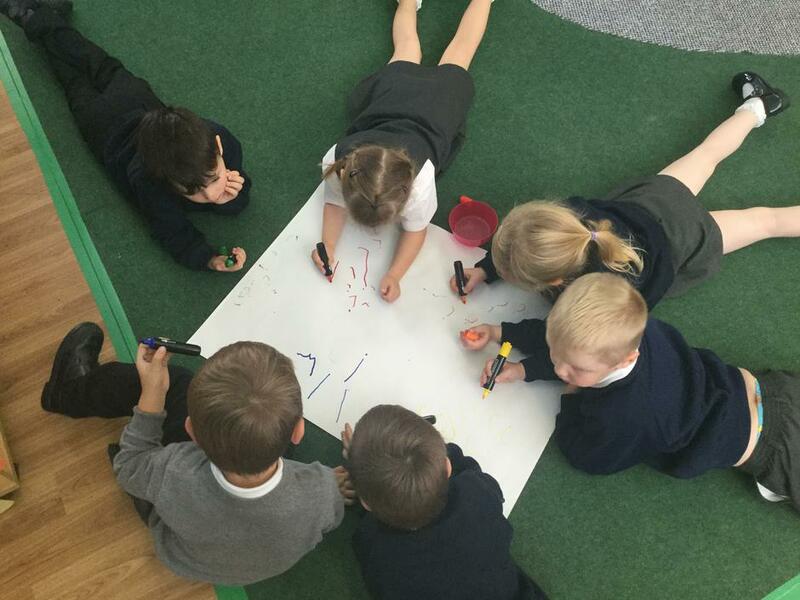 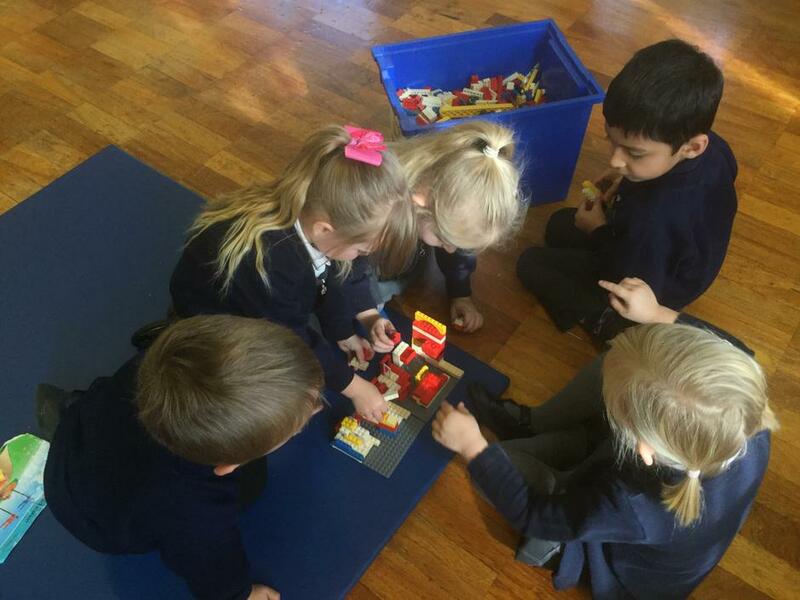 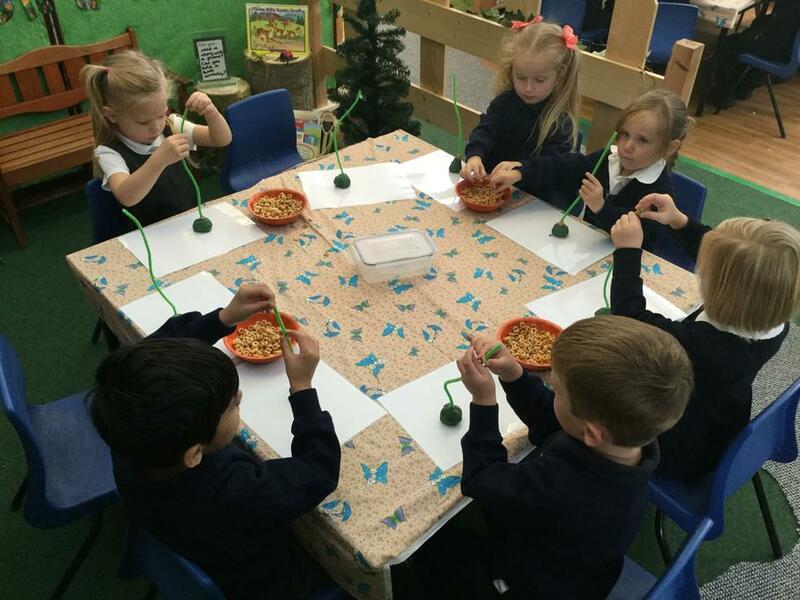 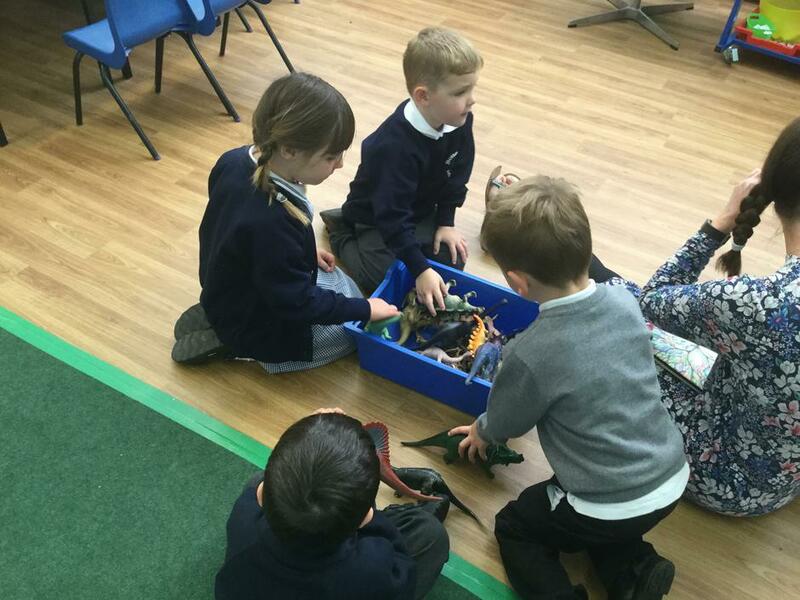 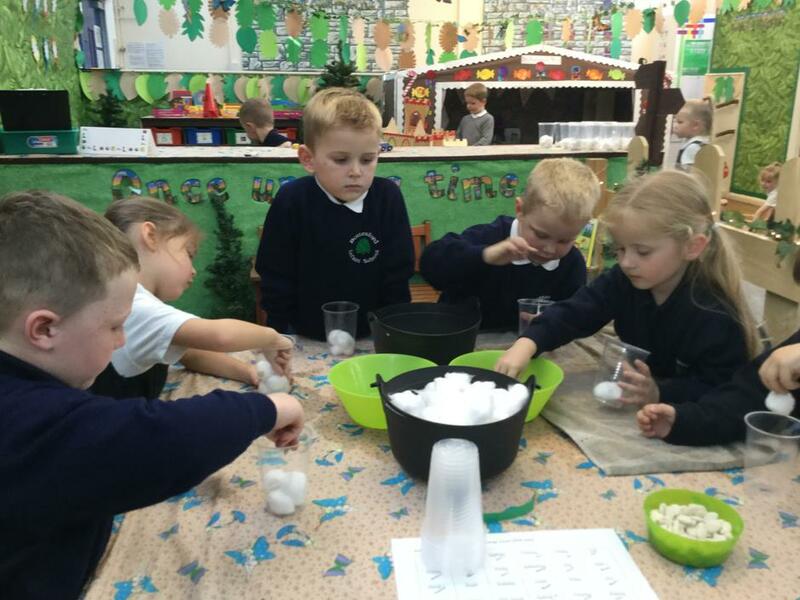 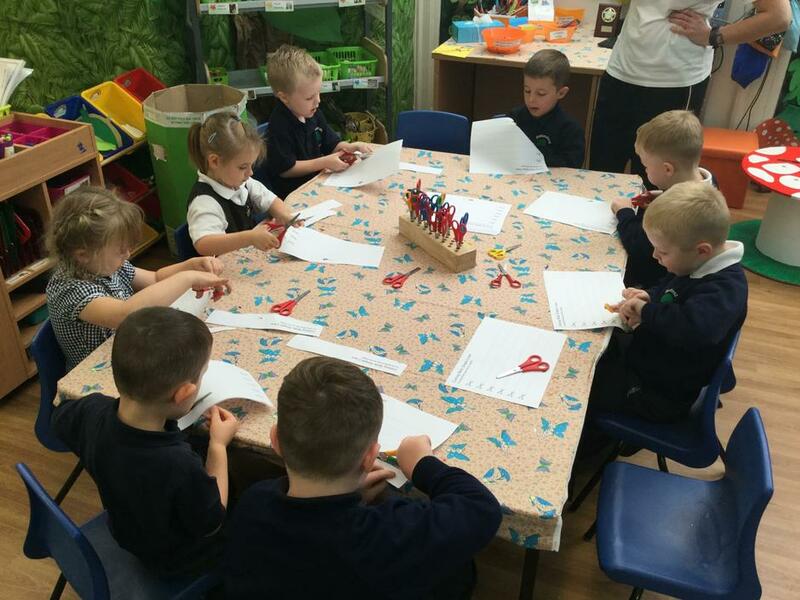 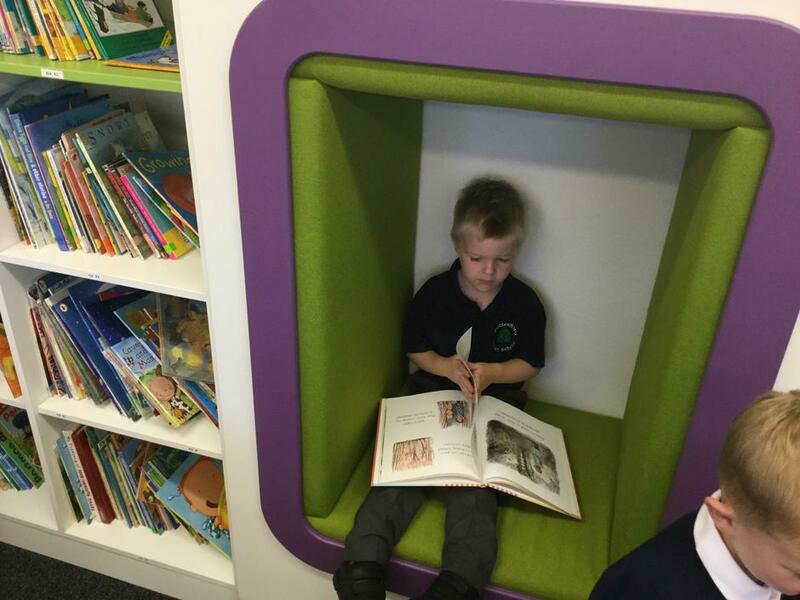 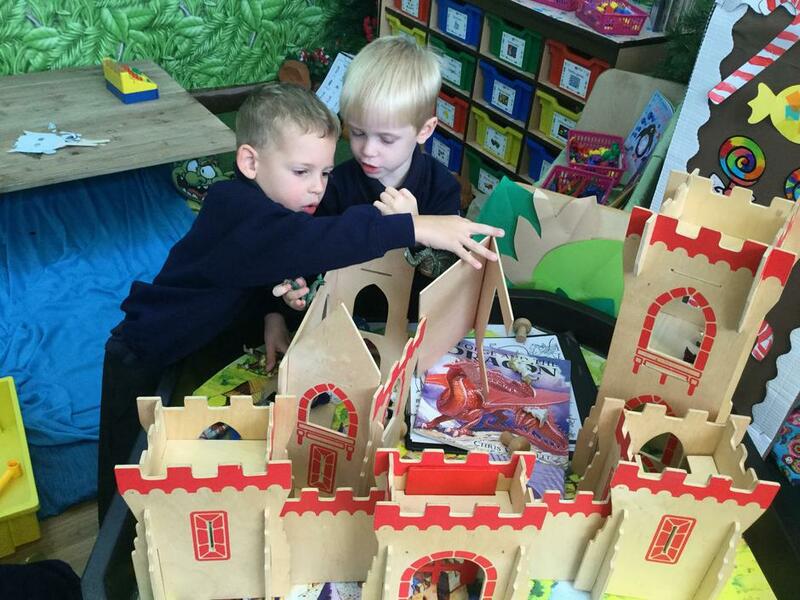 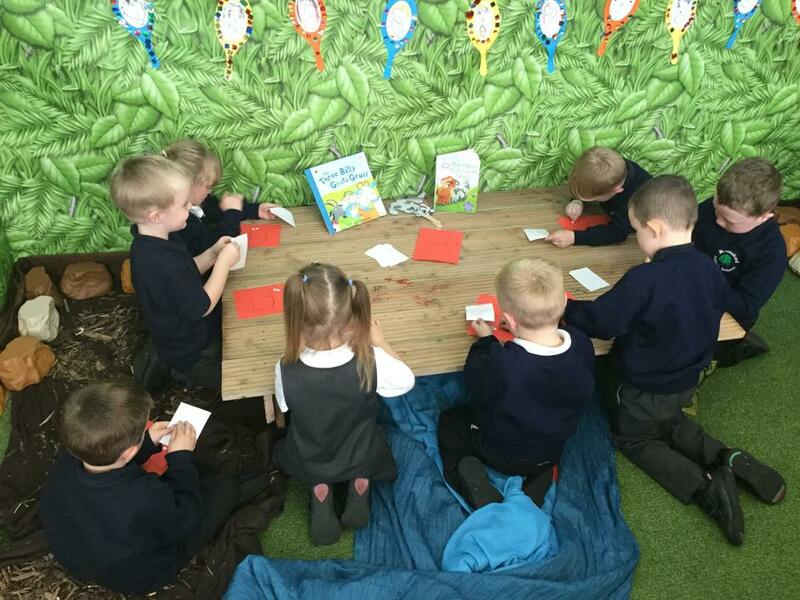 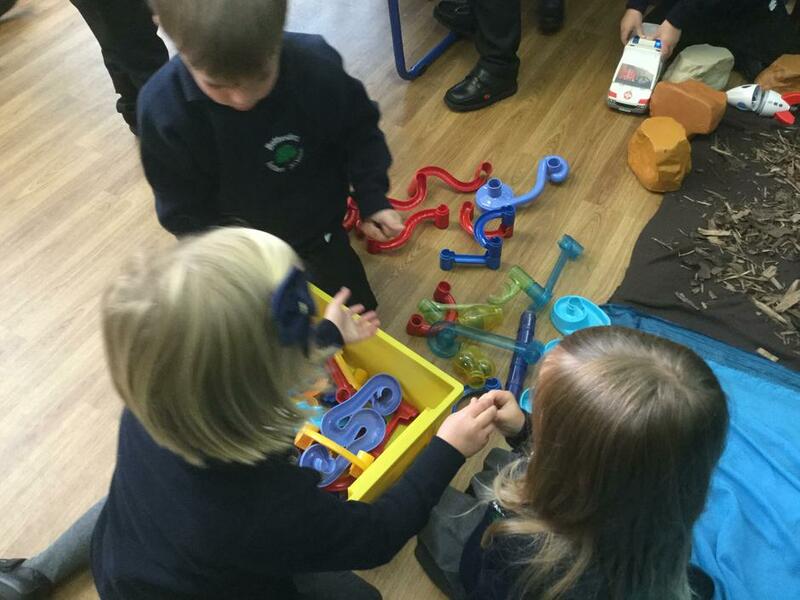 The Early Years Foundation Stage has 7 areas of learning. 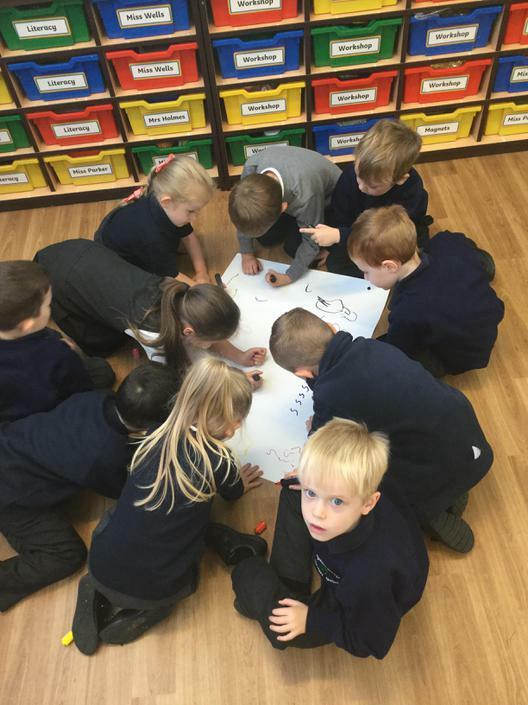 We will be working with partners and in small groups, as well as continuing to follow our school rules and values. 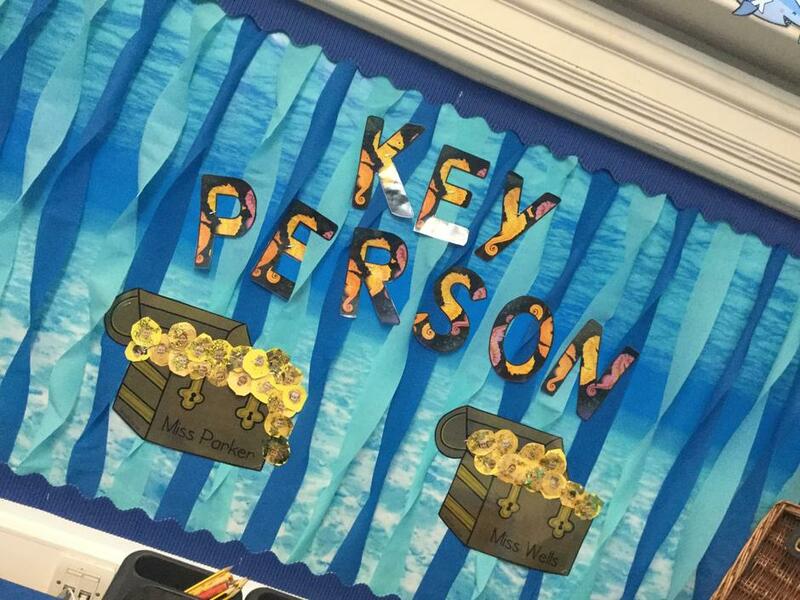 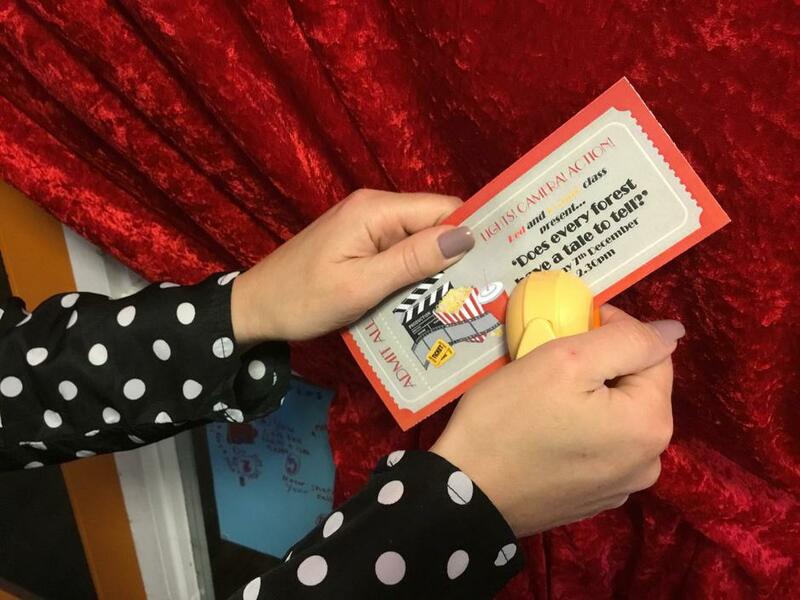 We will choose a key person, as well as learn about the importance of taking turns and sharing. 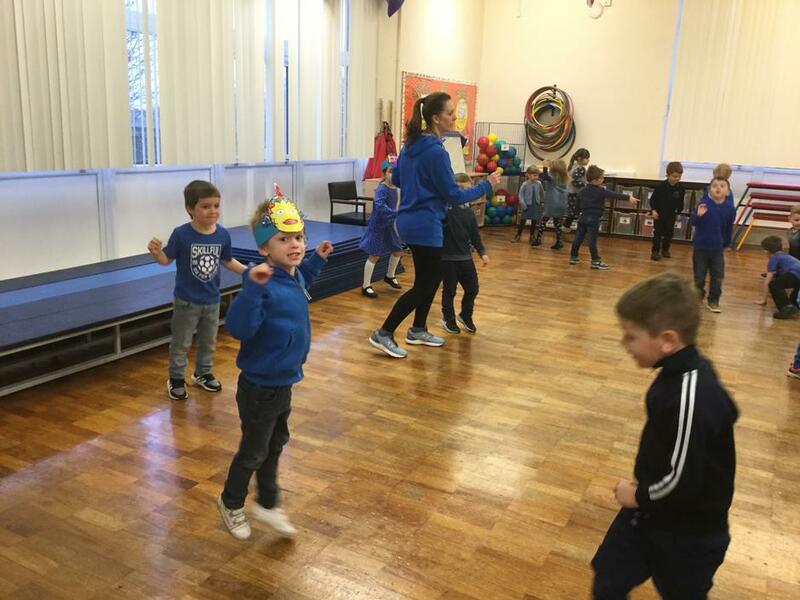 We will continue to develop our independence when choosing activities and also during adult-led work. 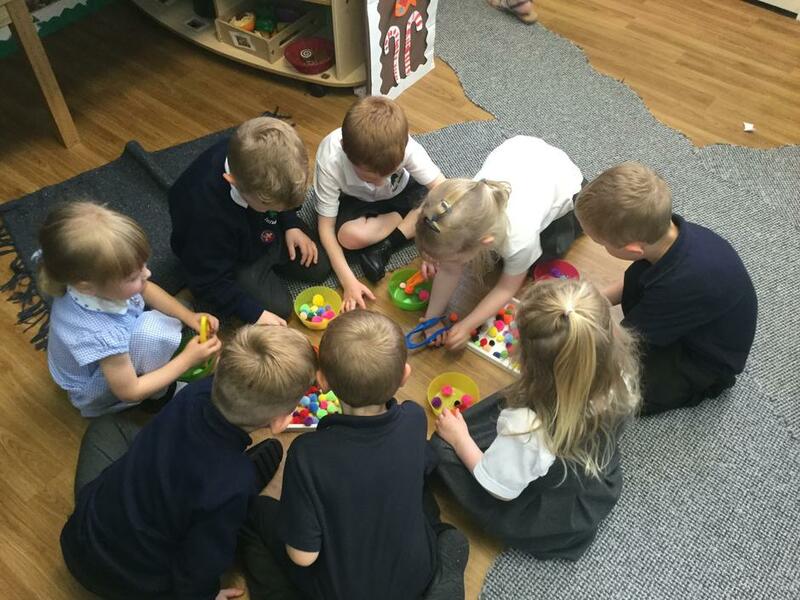 We will begin to negotiate and solve problems without the need for an adult. 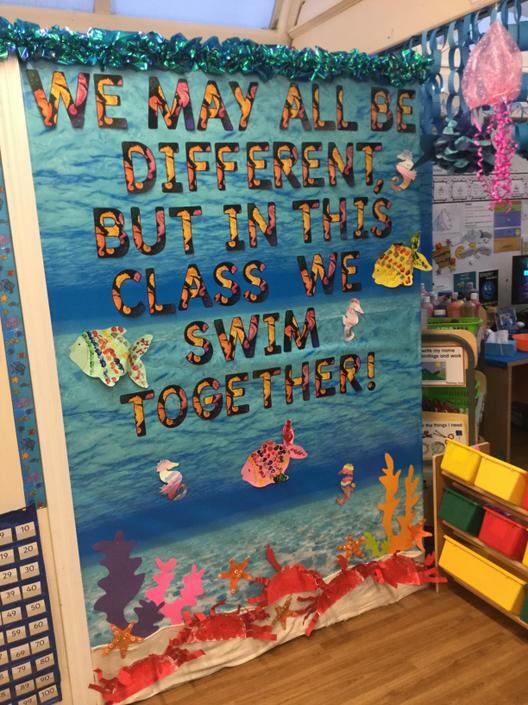 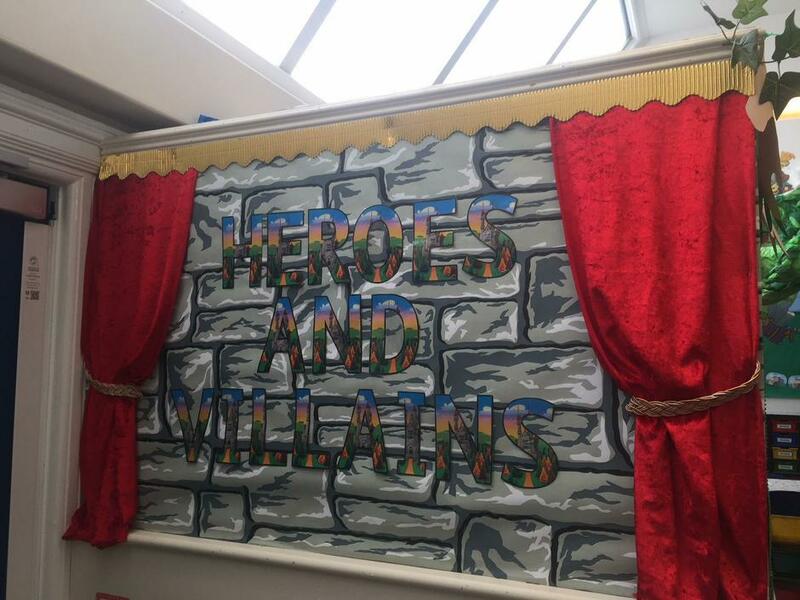 We will continue to embed our school values into the classroom. 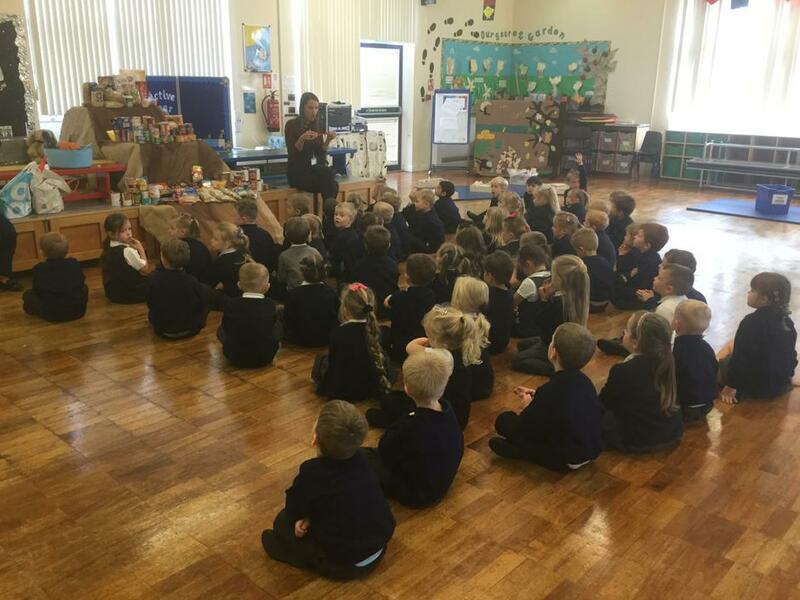 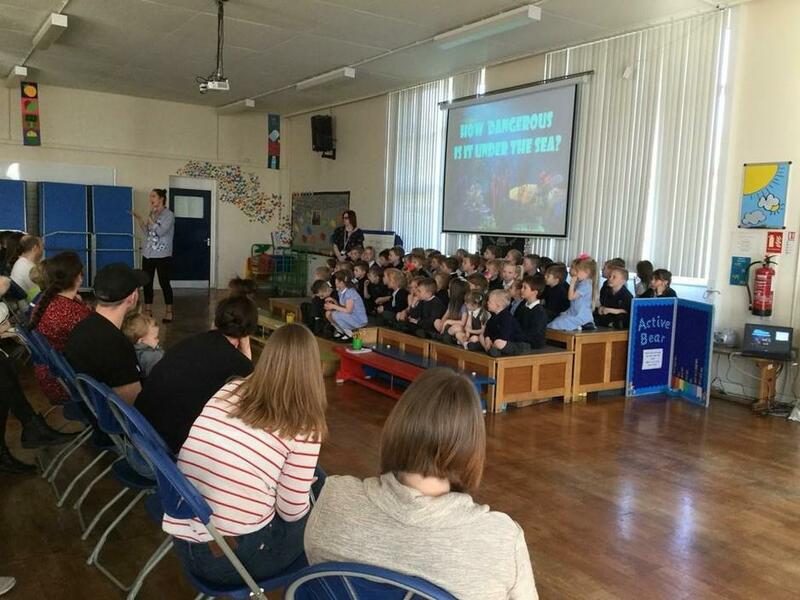 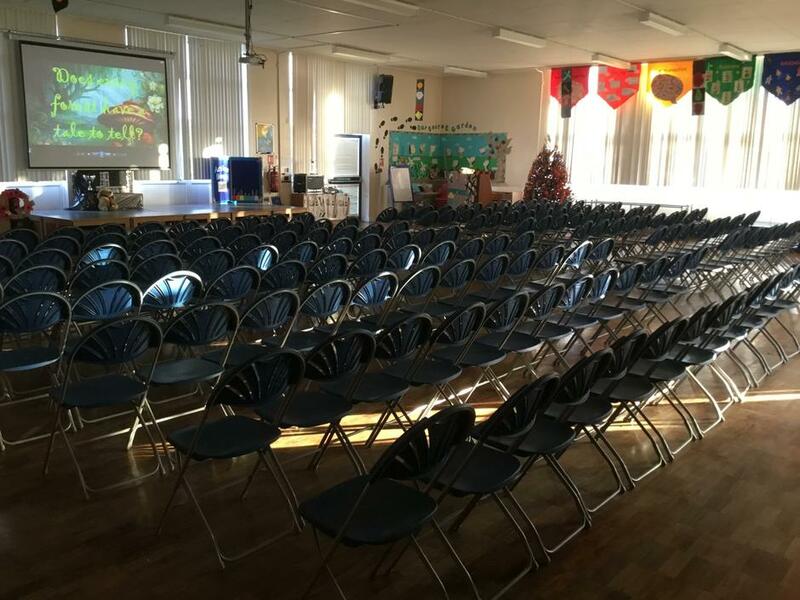 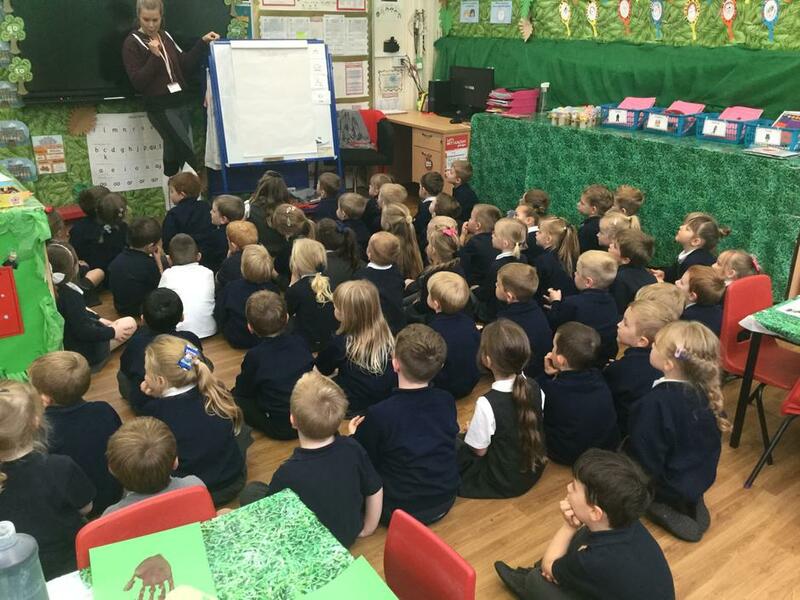 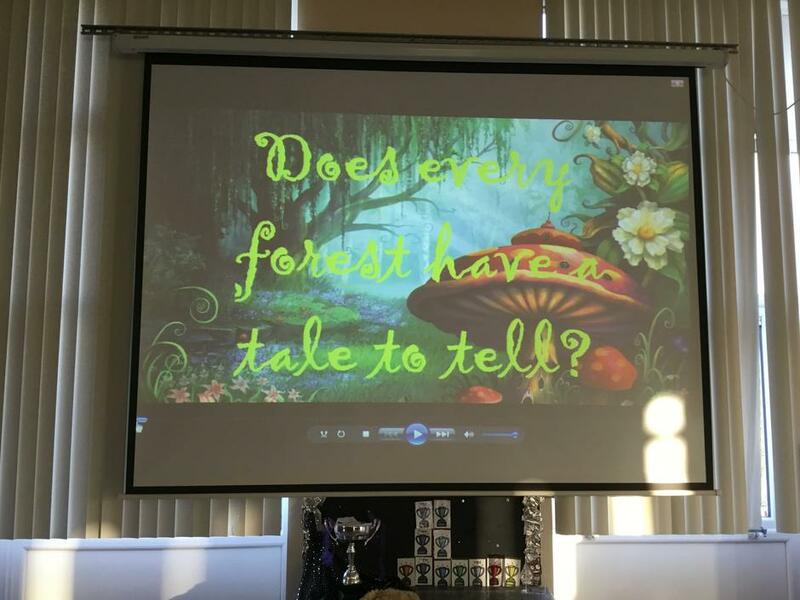 We will follow instructions and listen carefully during stories, teaching time and assemblies. 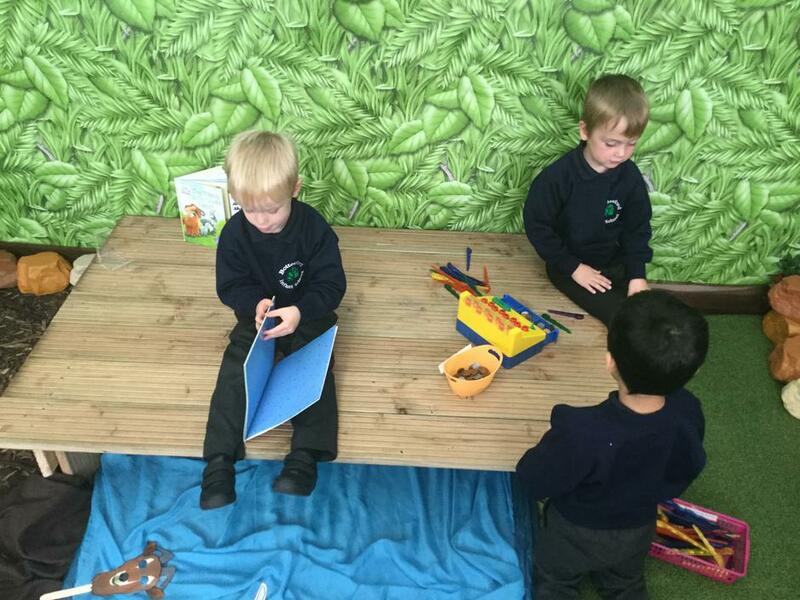 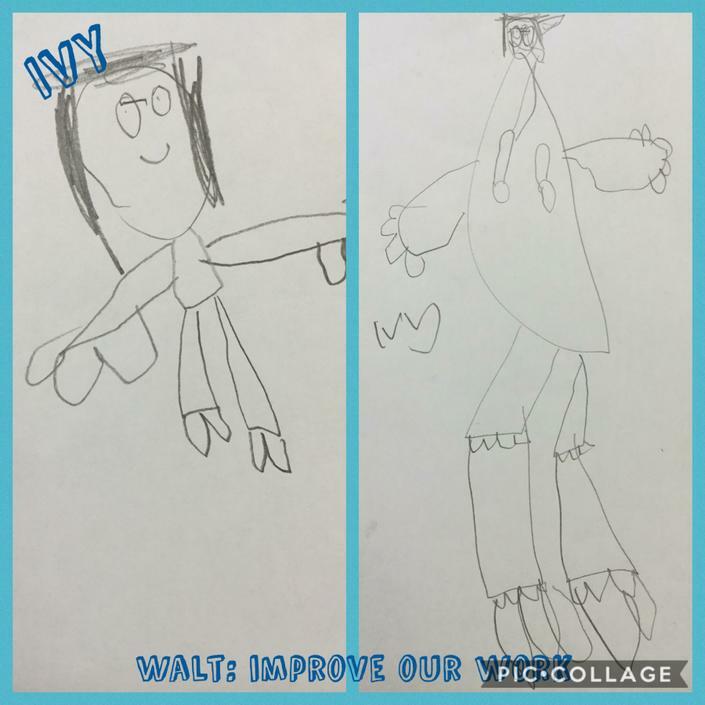 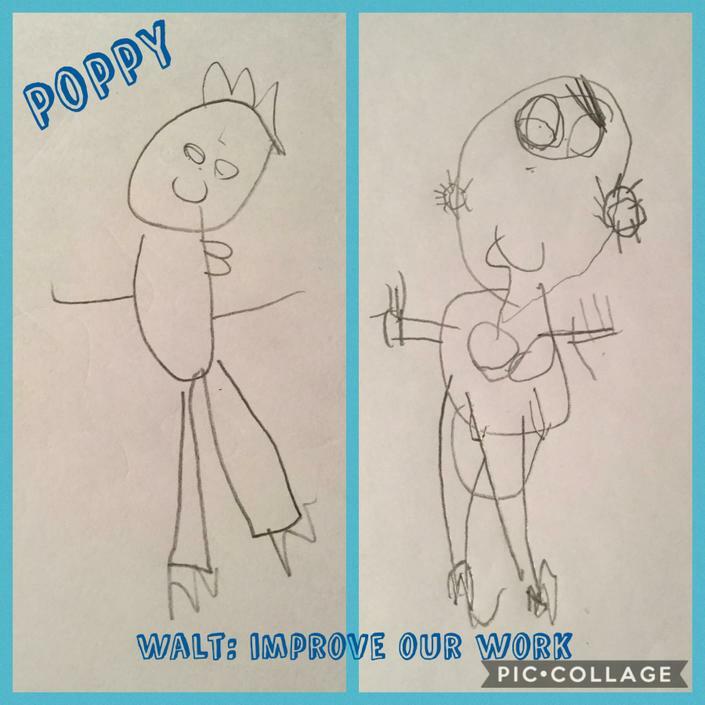 We will develop our confidence when talking to our partners and in small groups, sharing our experiences, discussions in Tapestry time and our favourite things. 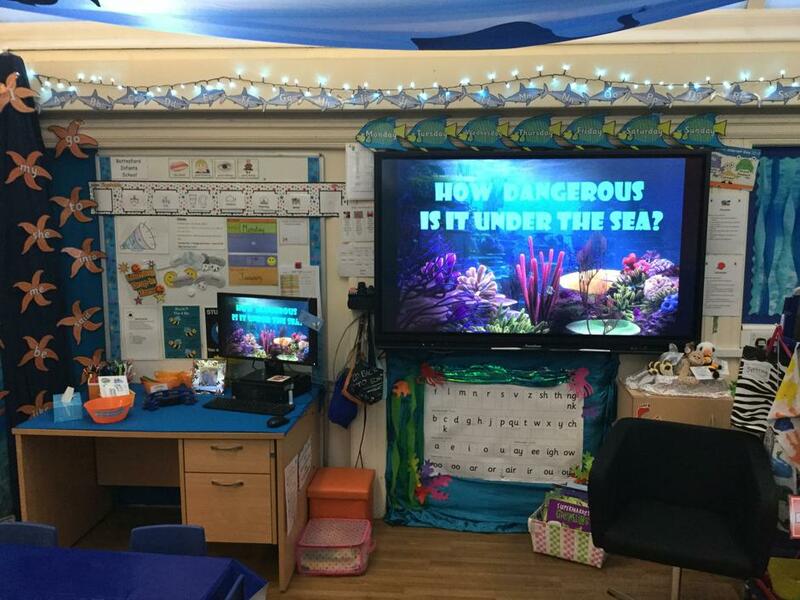 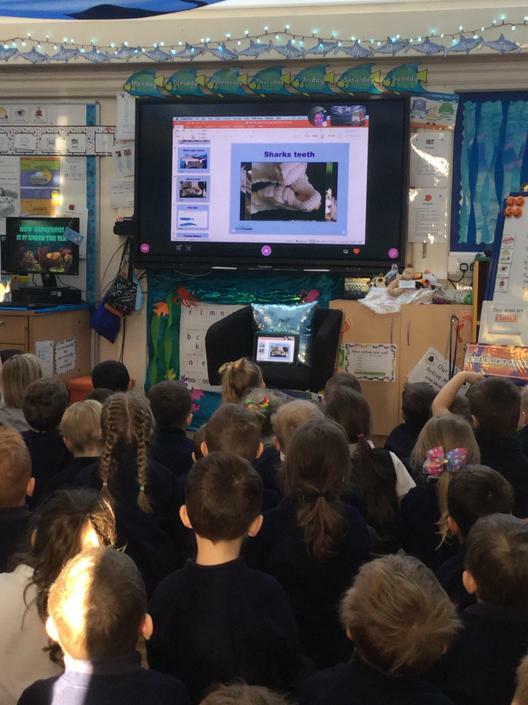 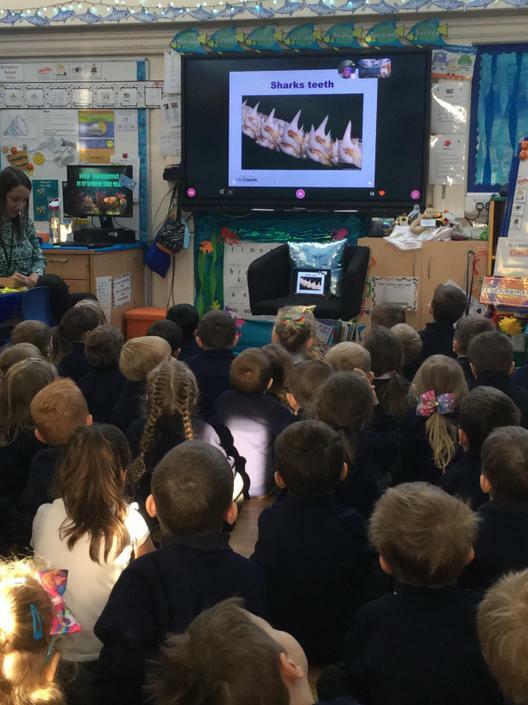 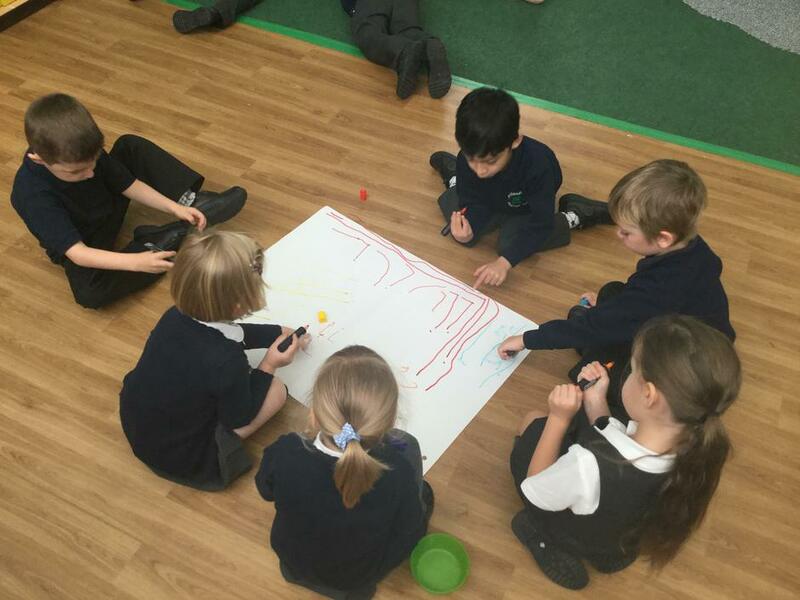 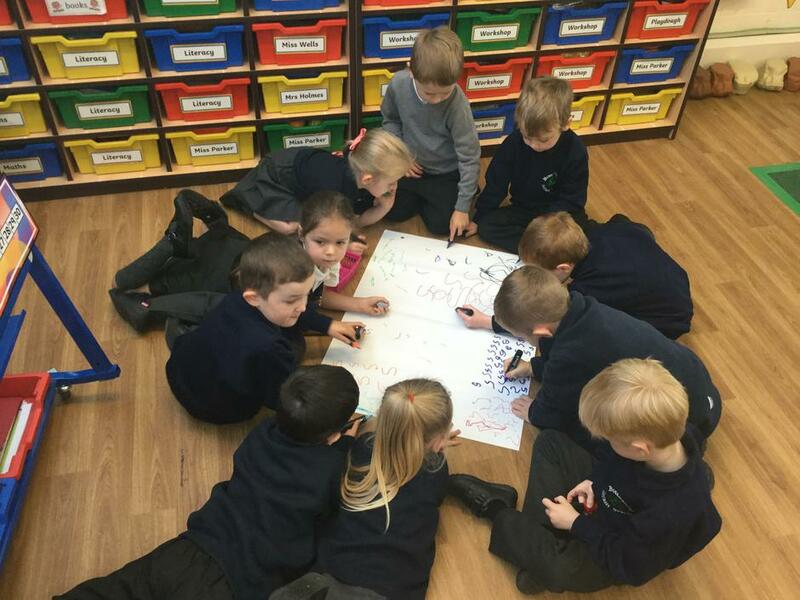 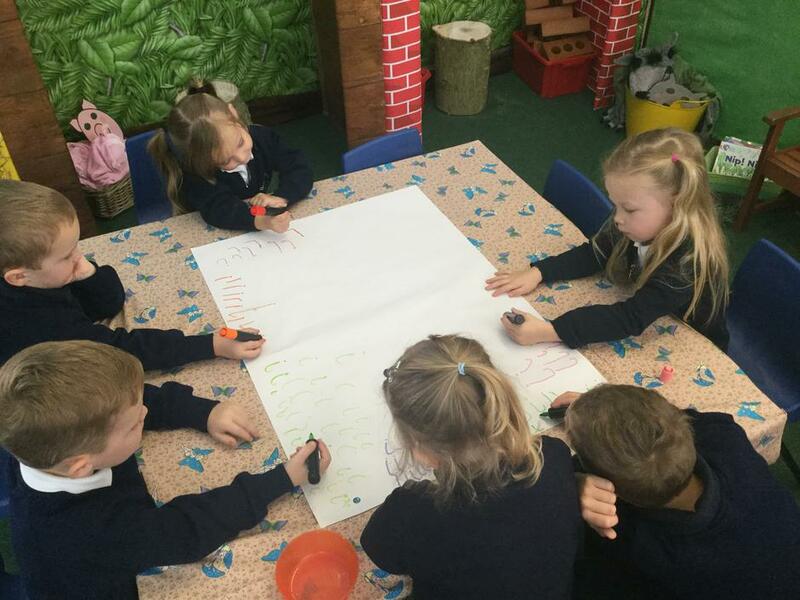 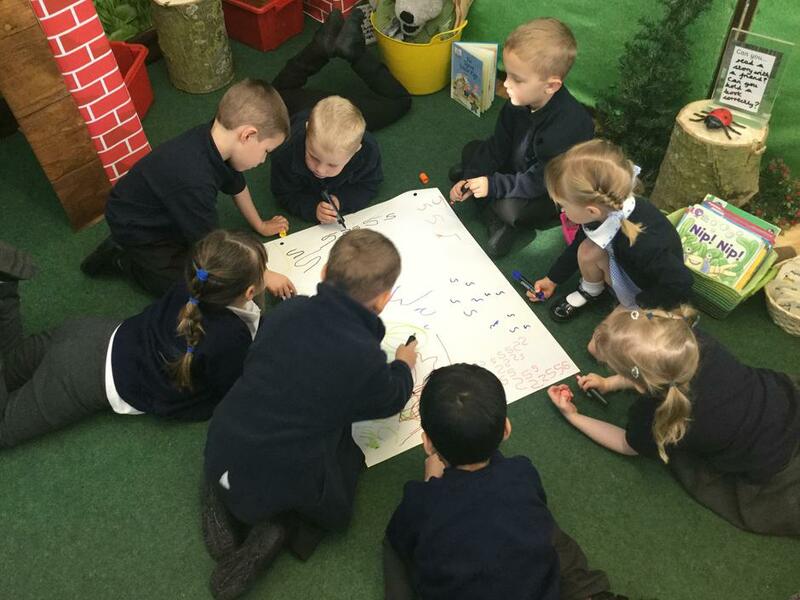 We will use information maps and actions to retell information about sea creatures.We will listen carefully to stories and information linked to our topic. 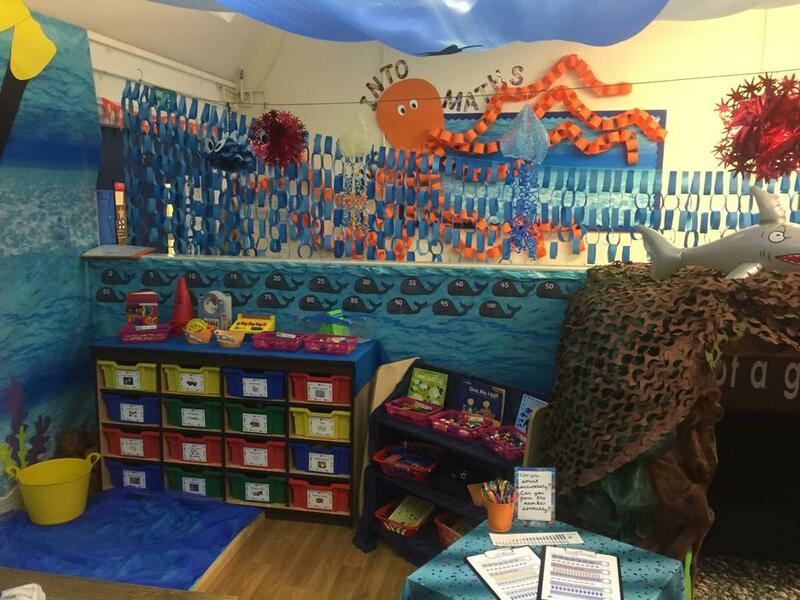 We will also develop a range of vocabulary linked to under the sea. 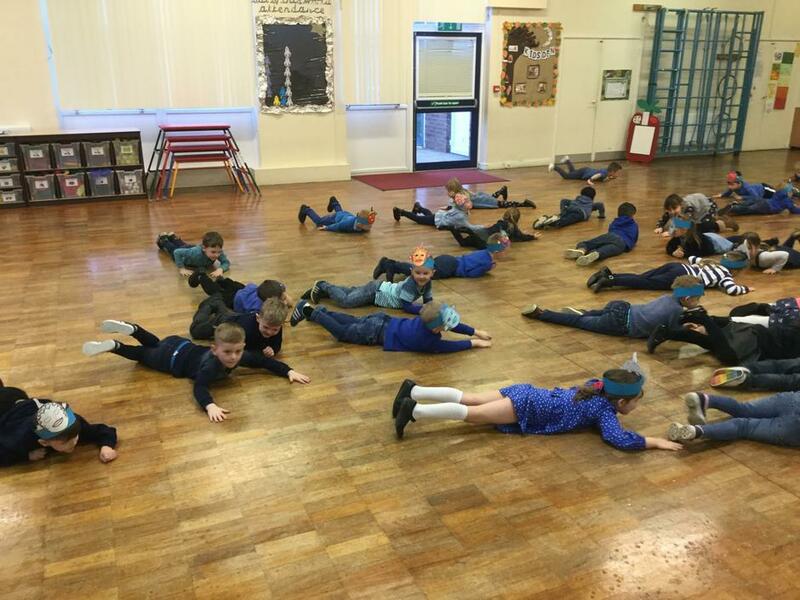 We will move in different ways safely and confidently during PE. 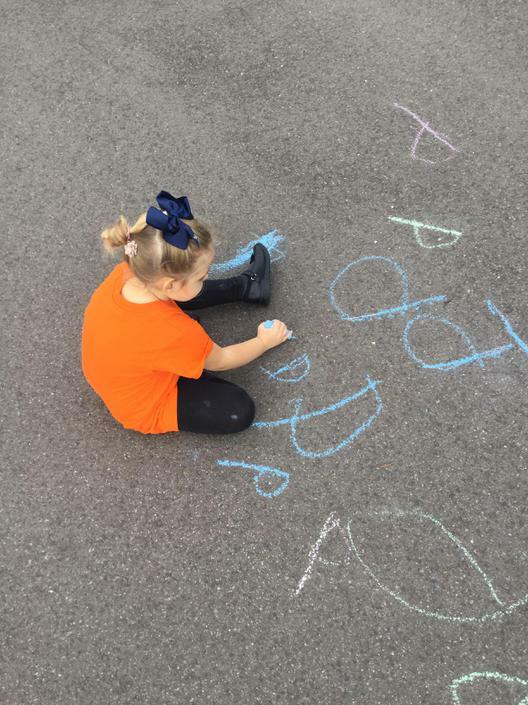 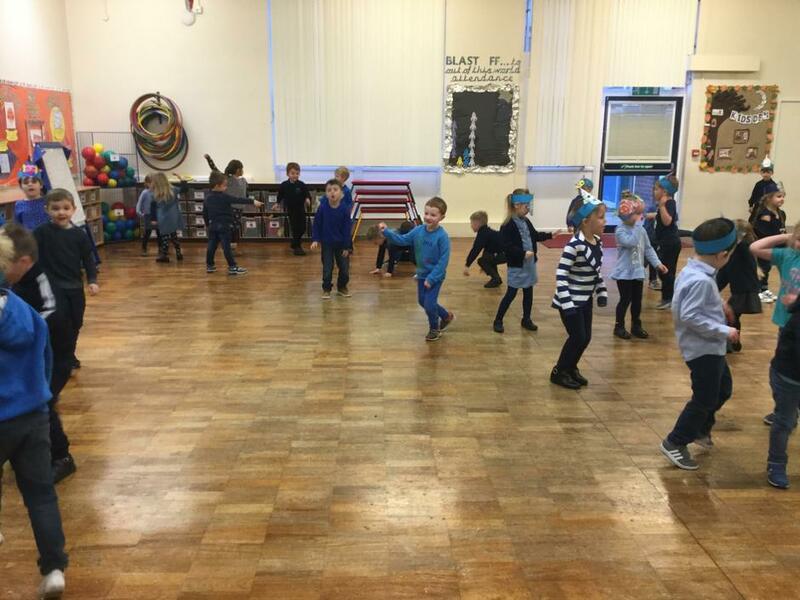 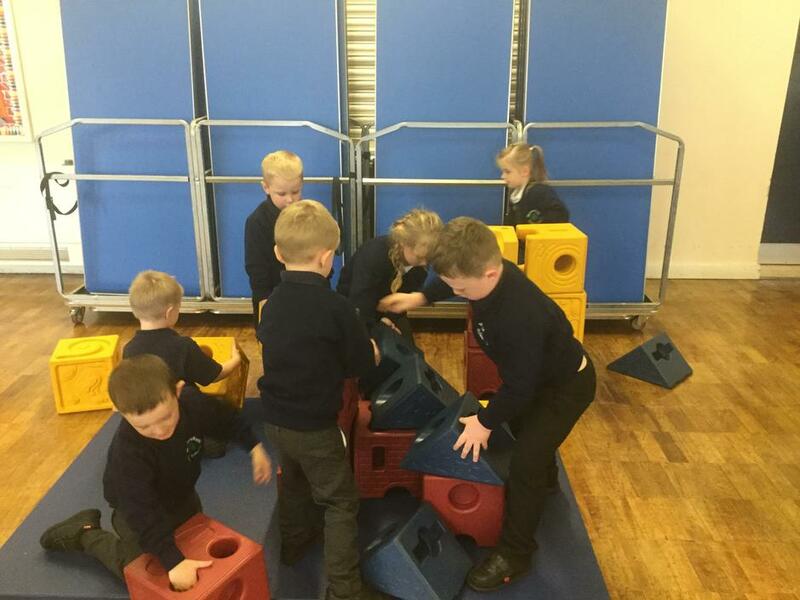 We will develop control and coordination in both fine and gross motor movements. 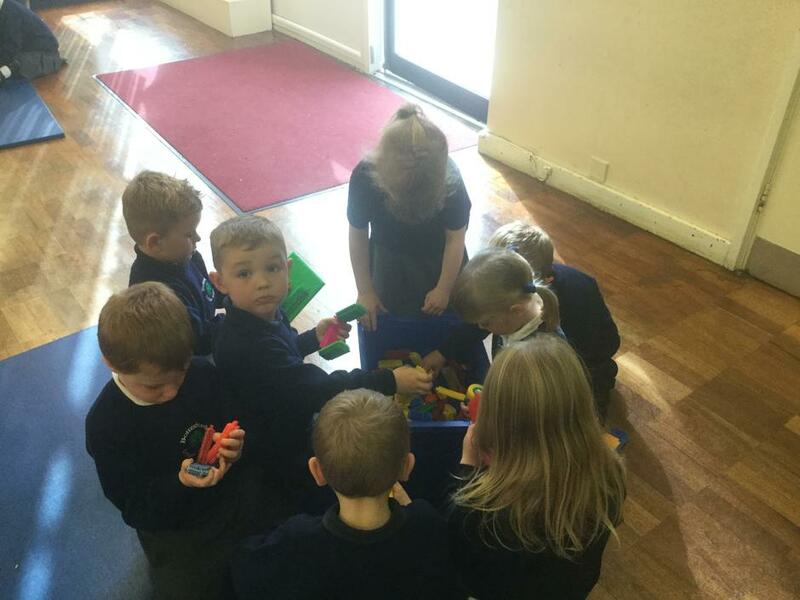 We will handle tools safely and effectively. 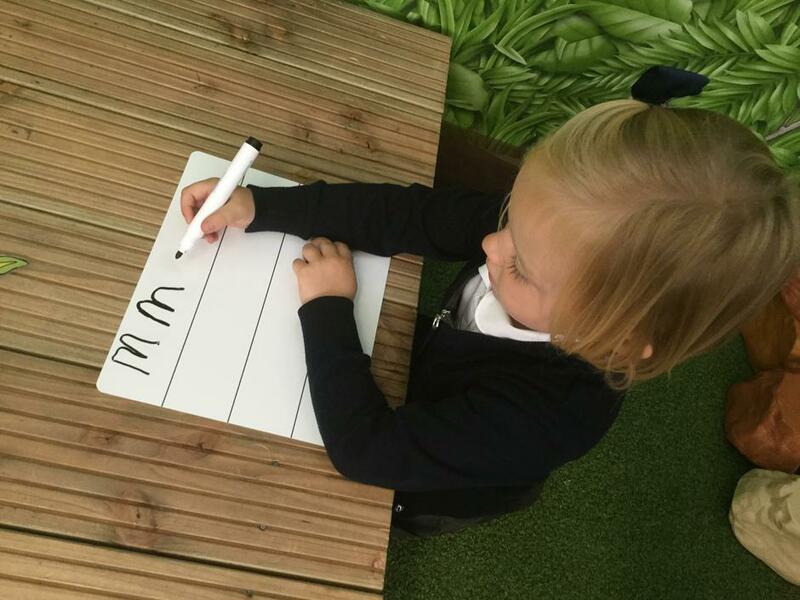 We will learn to form letters and record our ideas using a cusrive handwriting script. 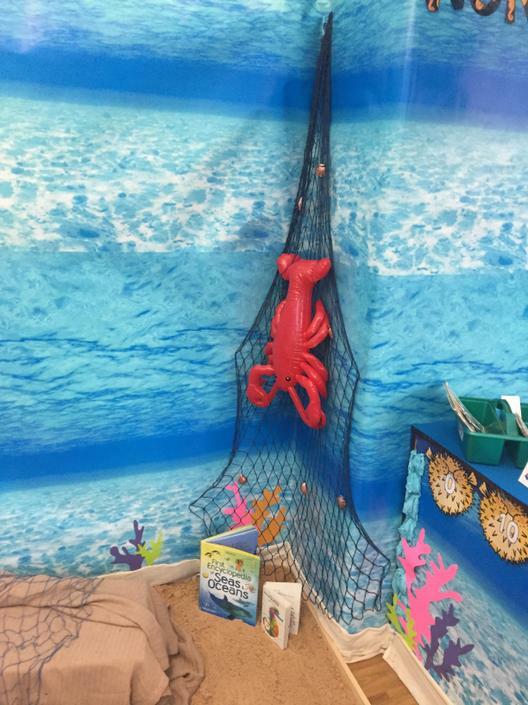 The 'It's catching' team will be coming in to work with us on a range of catching activities and skills. 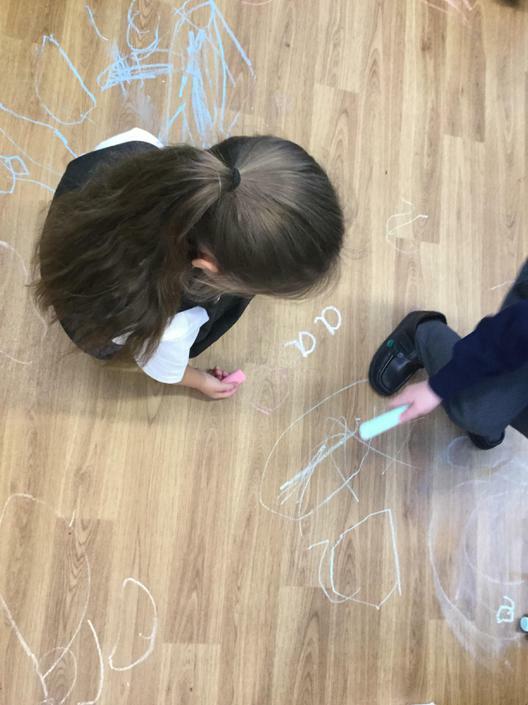 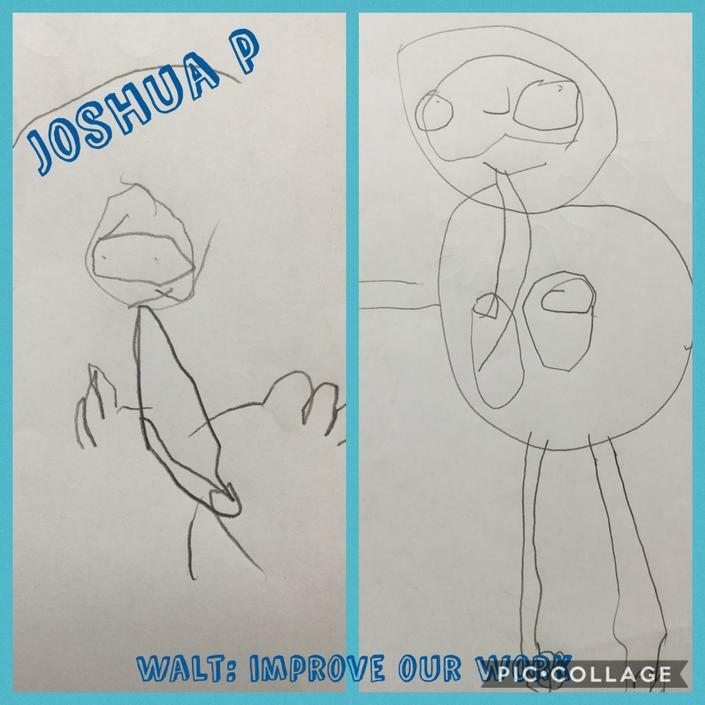 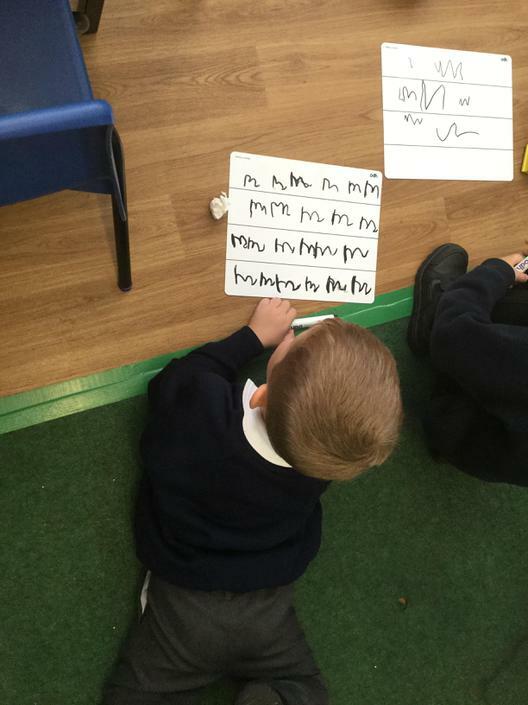 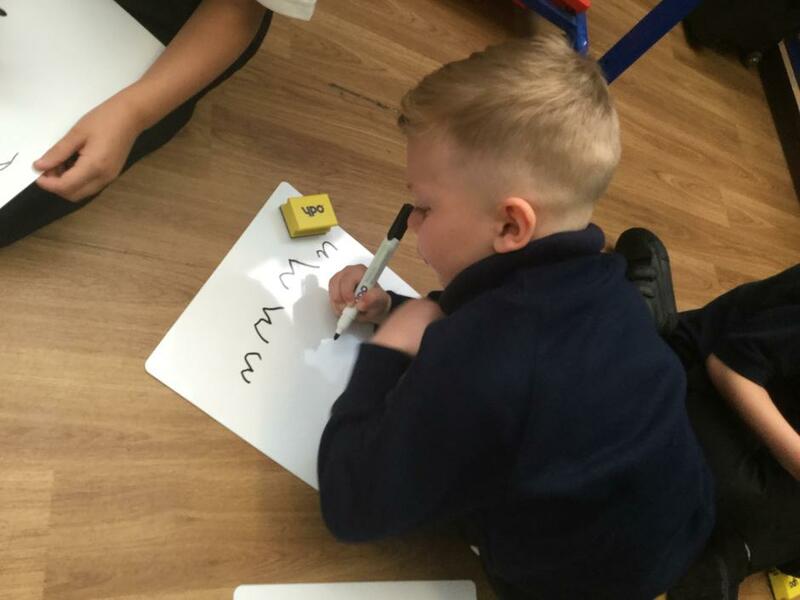 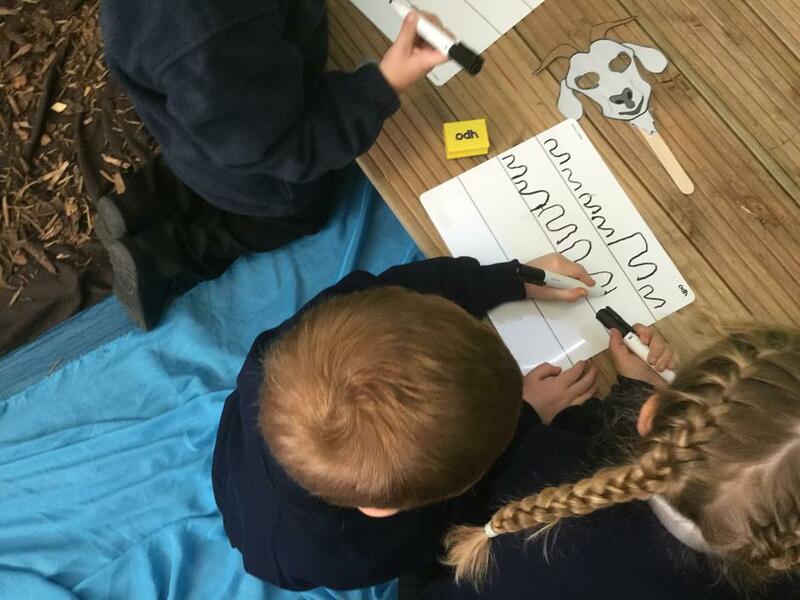 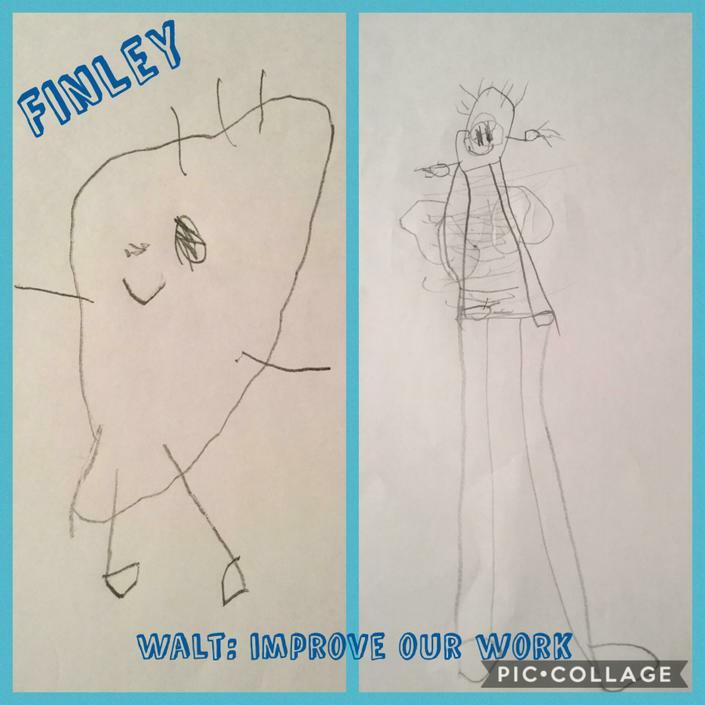 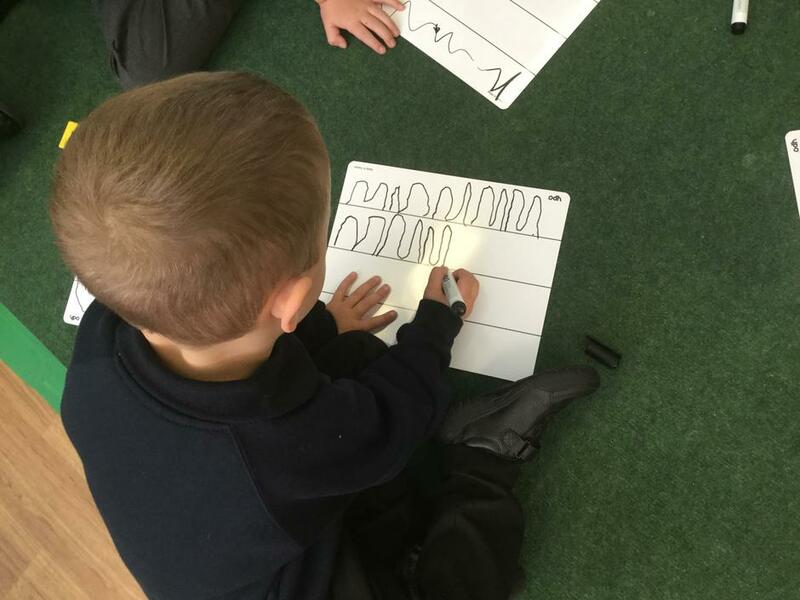 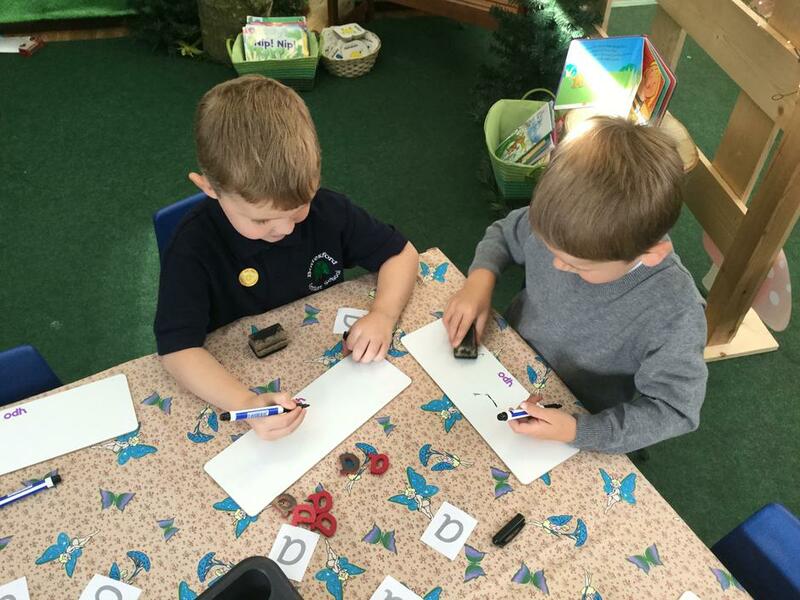 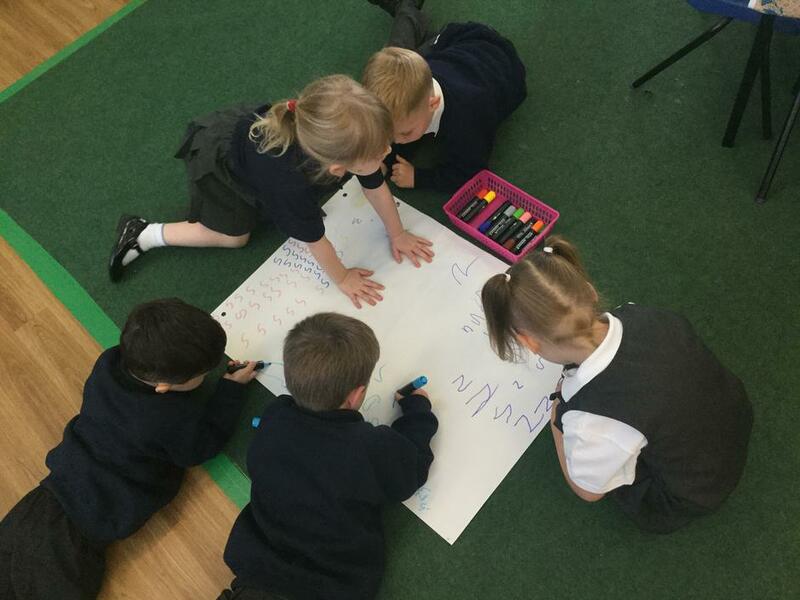 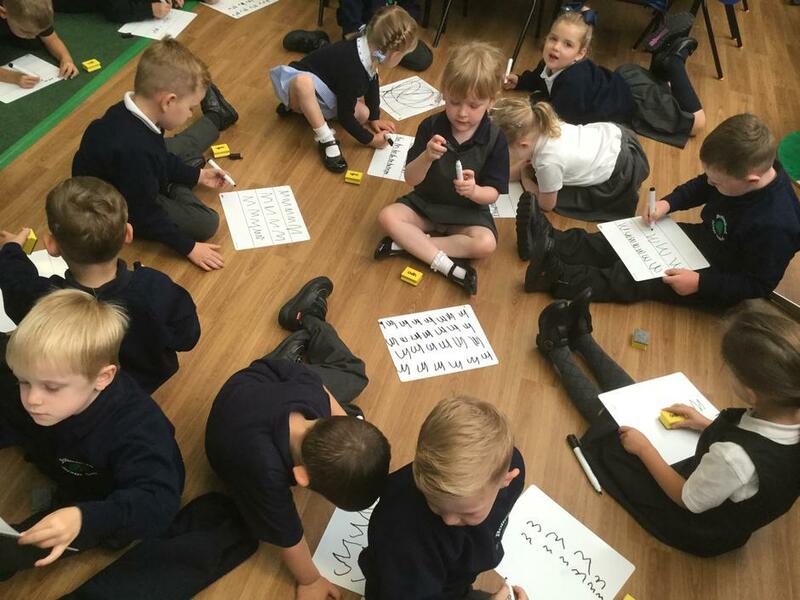 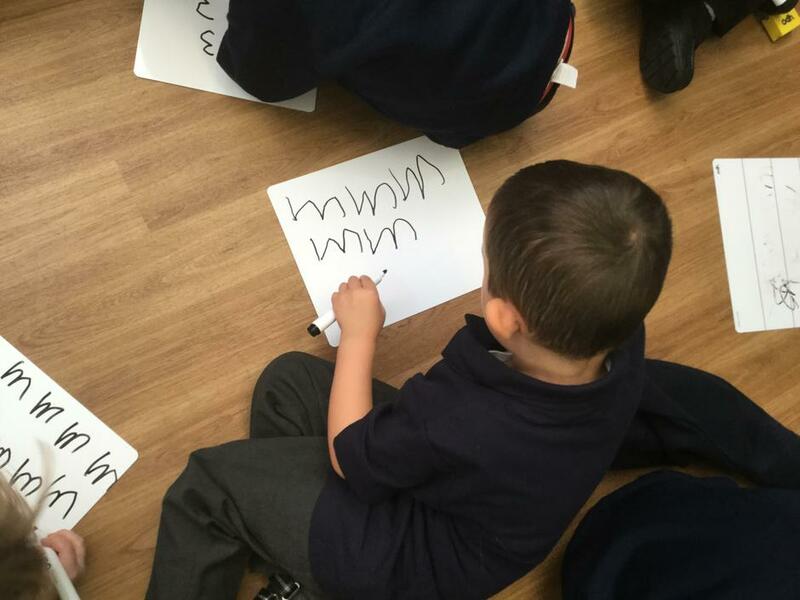 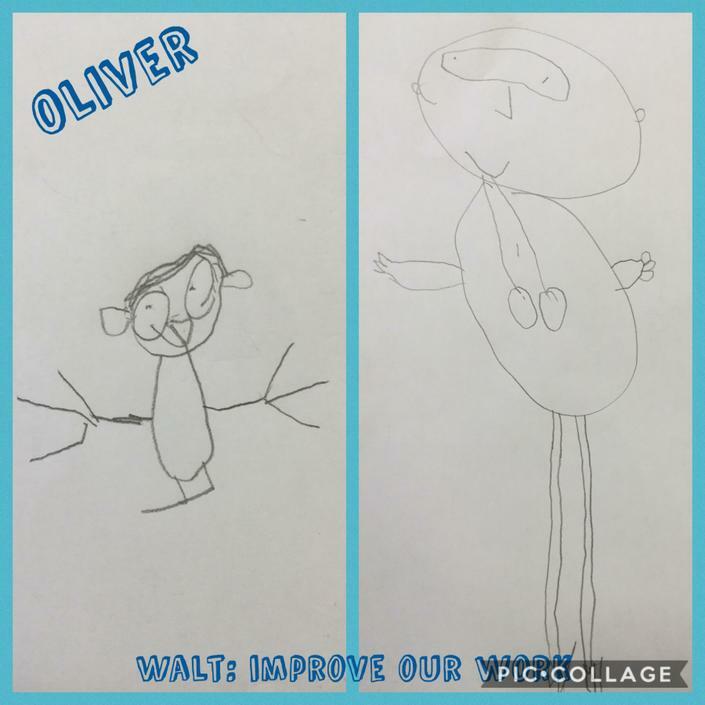 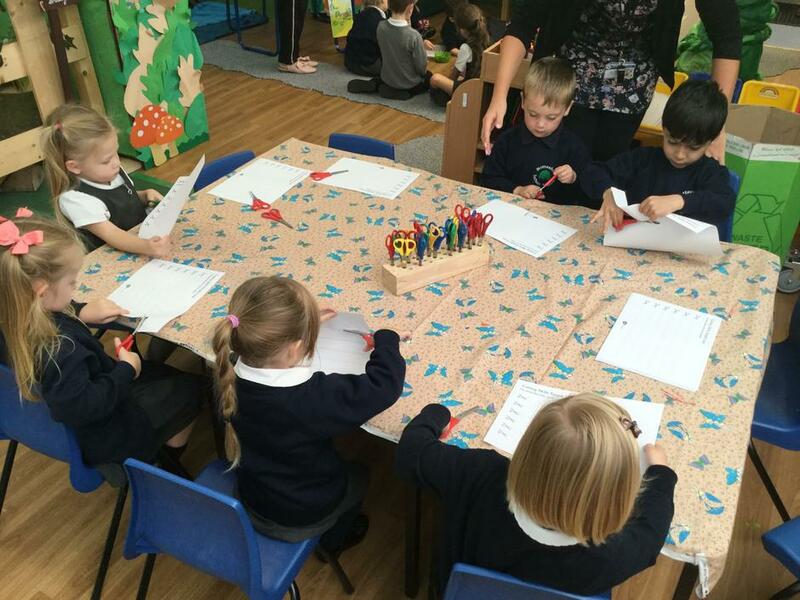 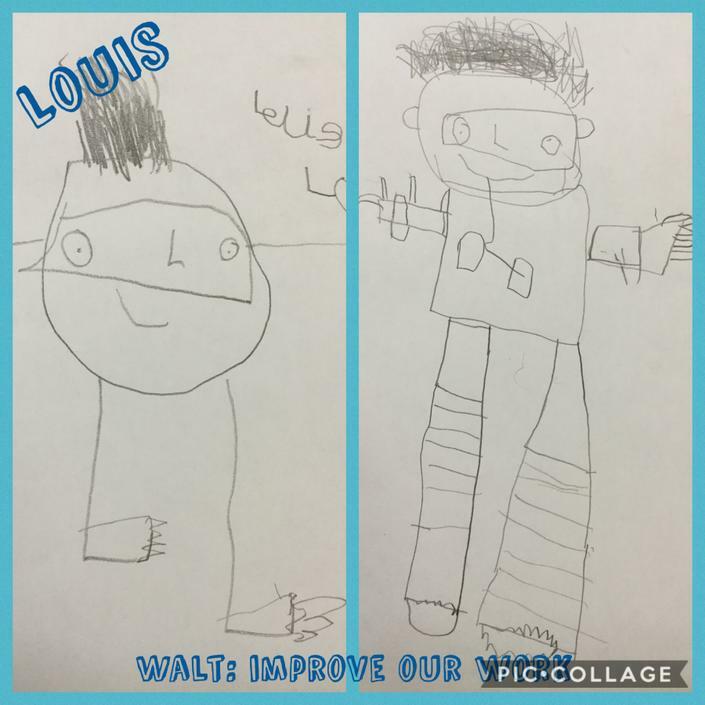 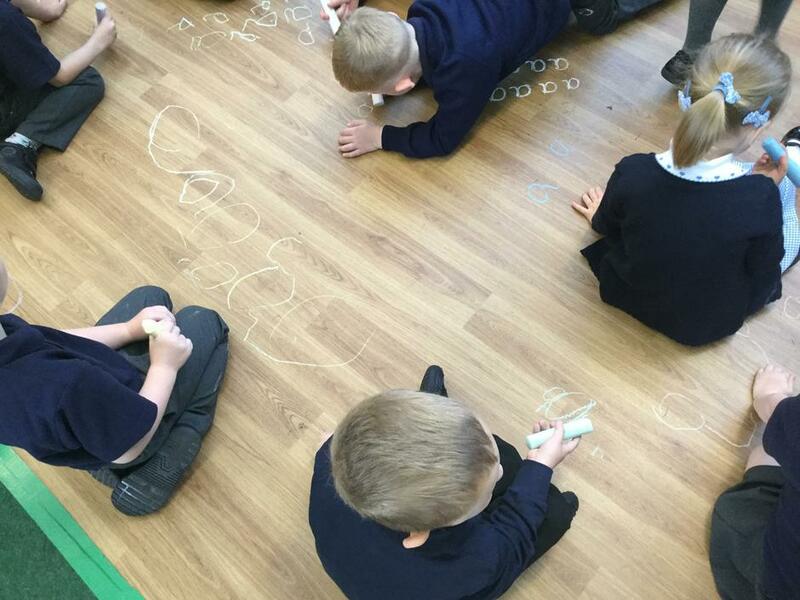 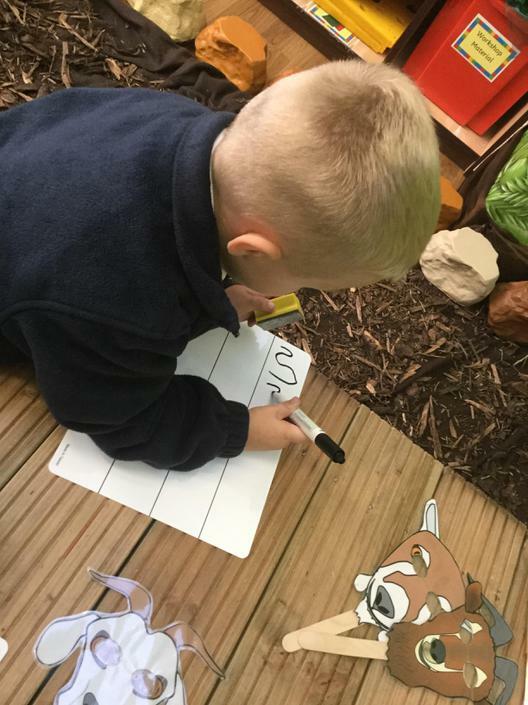 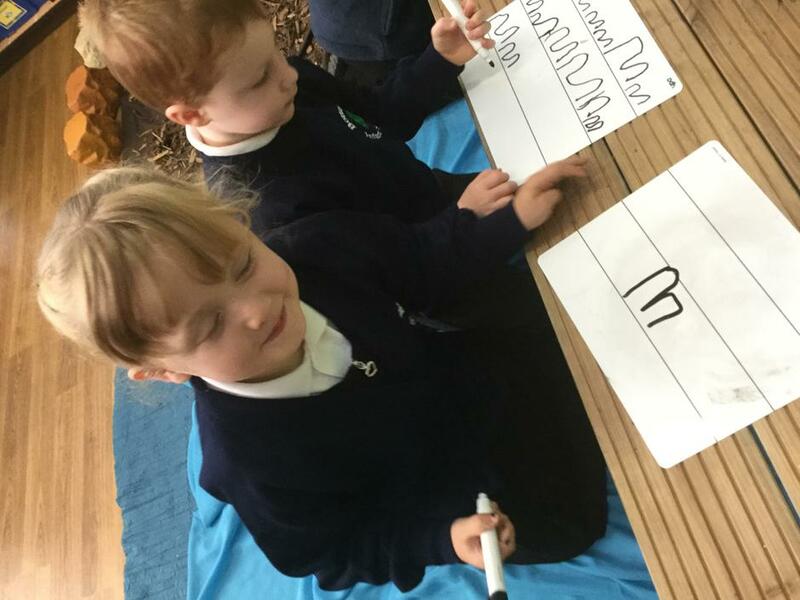 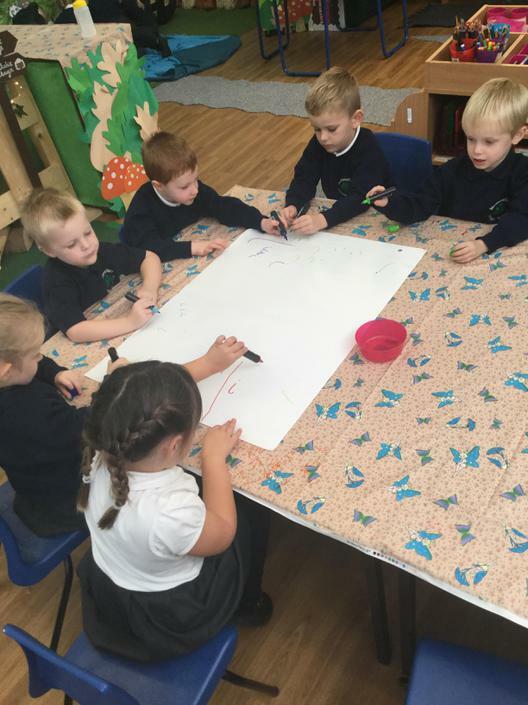 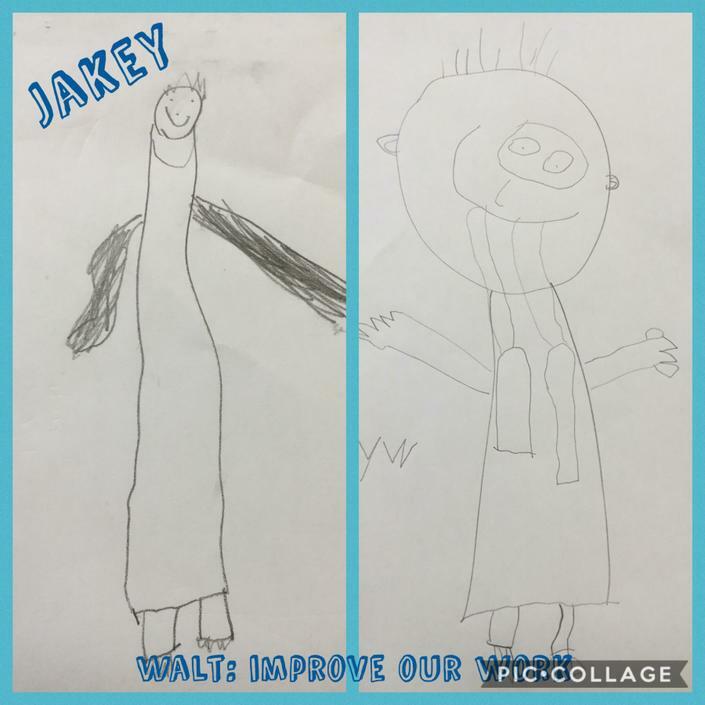 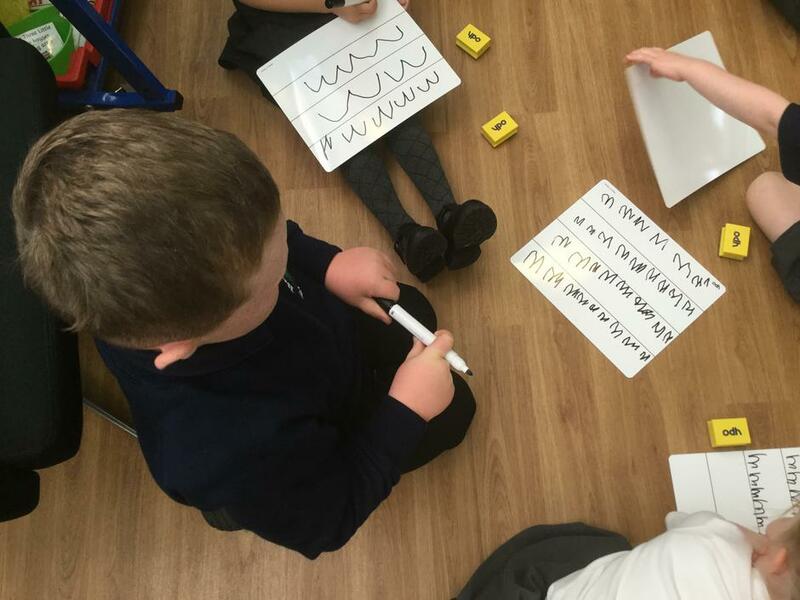 We will ensure daily writing helps further develop our letter formation. 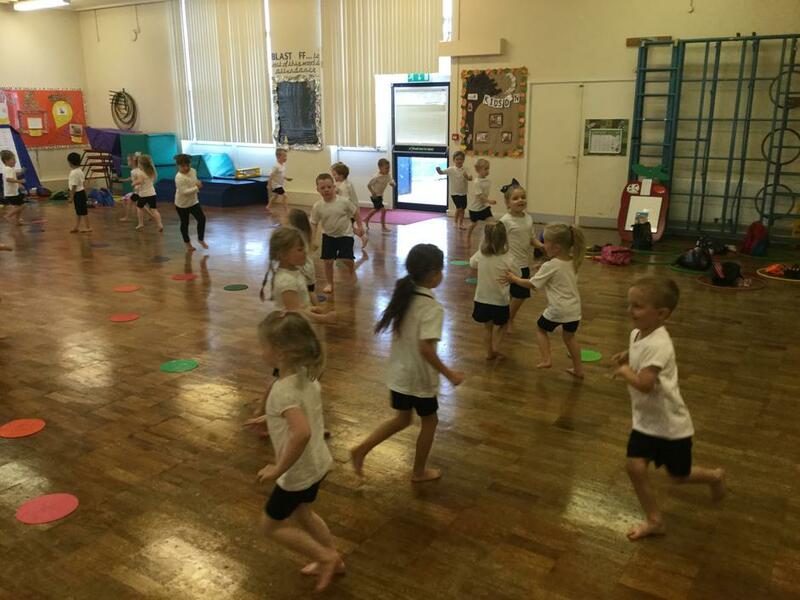 We also have a 'Colour run' planned for this term too! 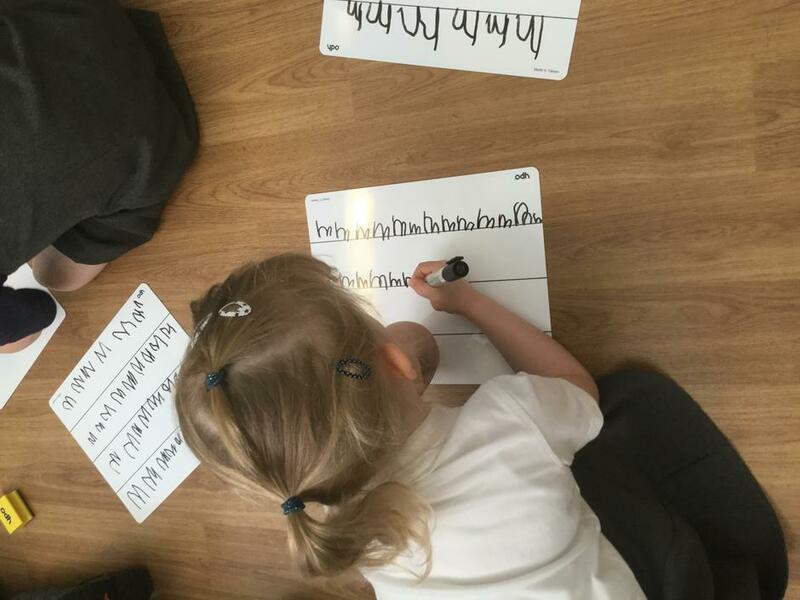 We will develop our phonic knowledge using Read, Write, Inc to enable us to become more independent writers. 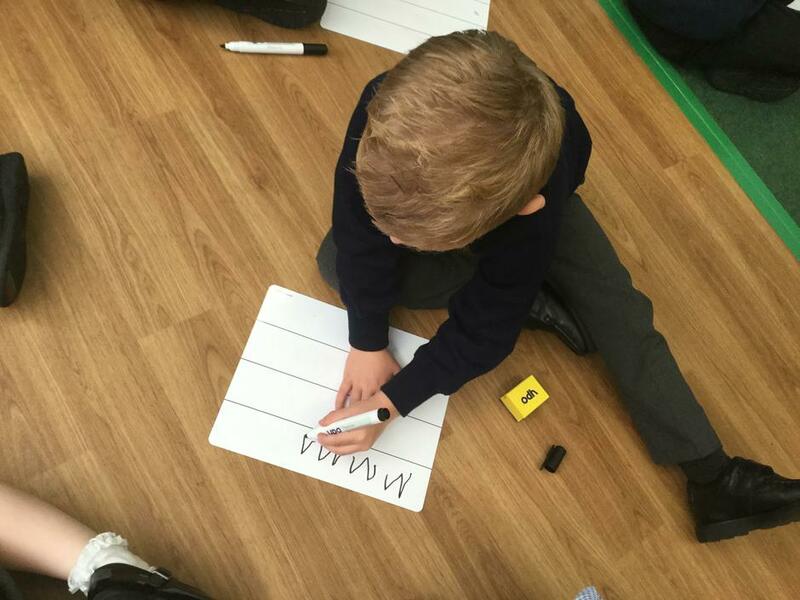 We will do 'Guided Writing' 4 times a week to develop our segmenting skills and sentence building. 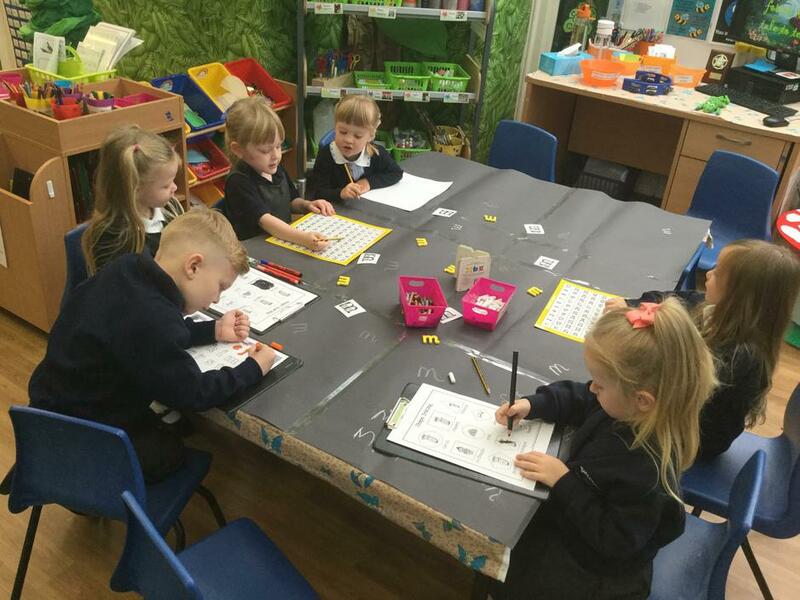 We will begin weekly 'Guided reading' to develop our fluency, comprehension and decoding skills.We will continue to recognise and write 'tricky words'. 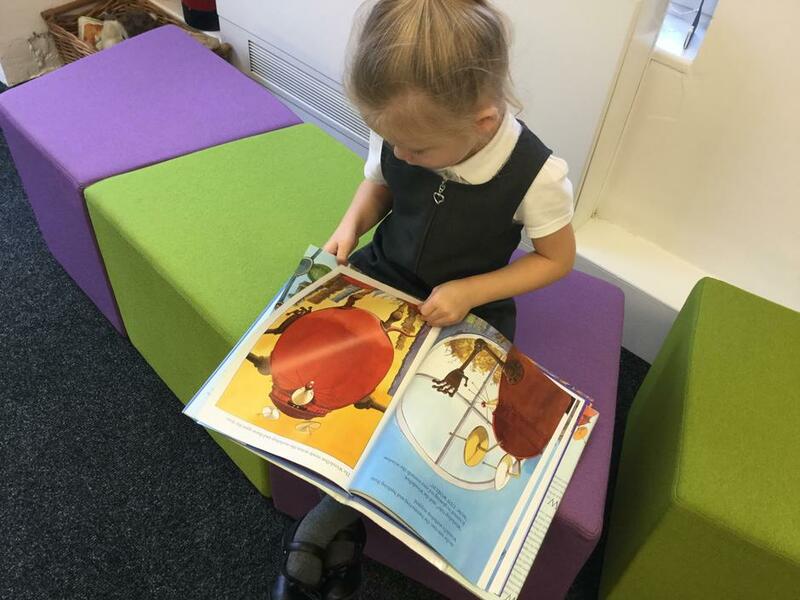 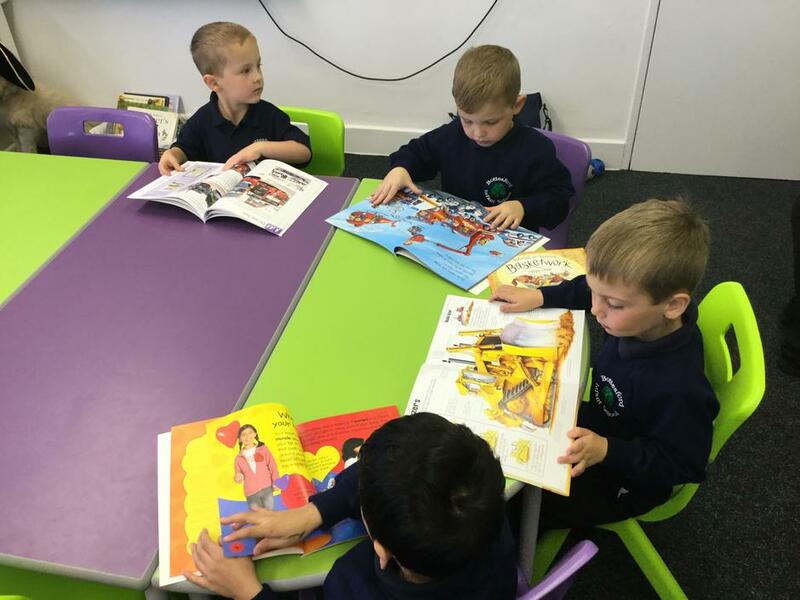 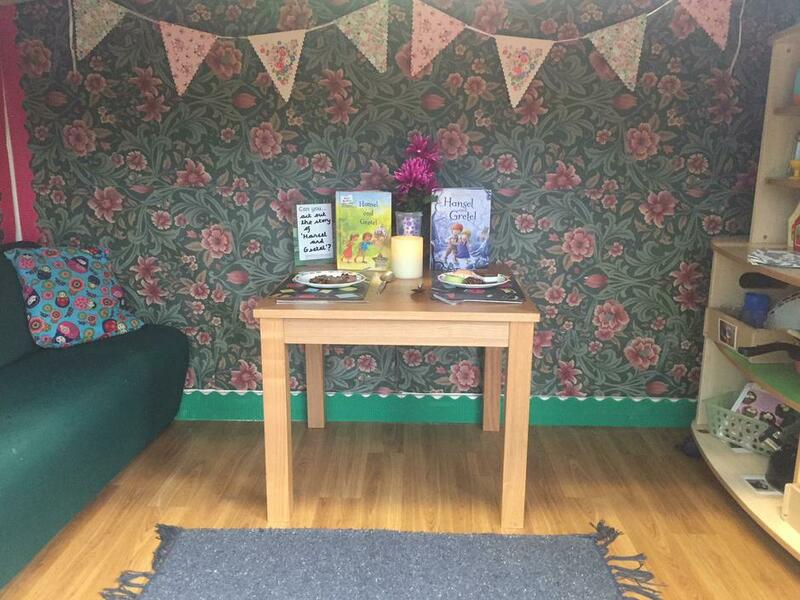 We will be sharing a range of fiction and non-fiction books in the classroom linked to our new topic. 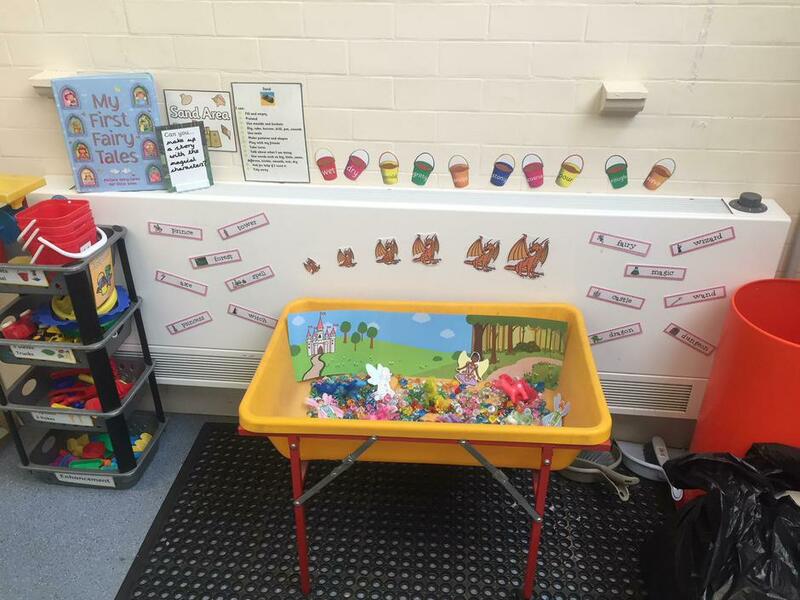 We will develop whole class story and information maps and use actions to retell these. 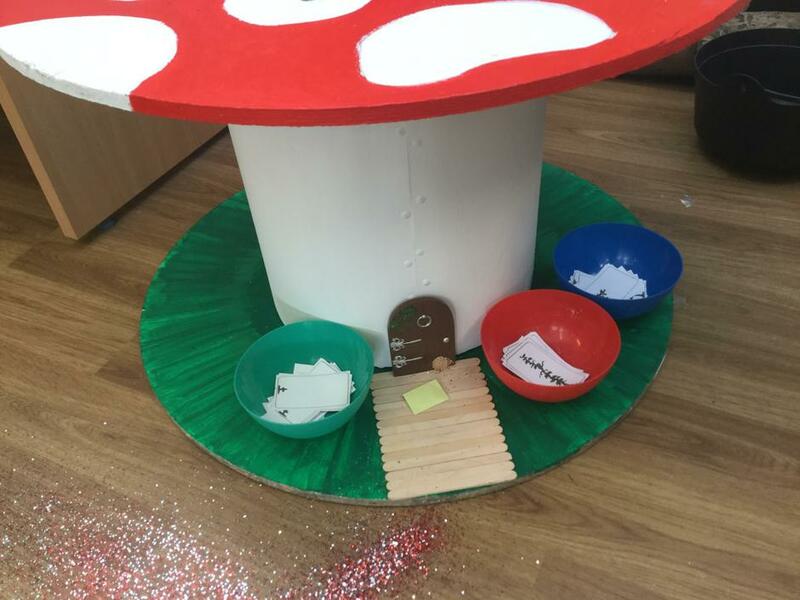 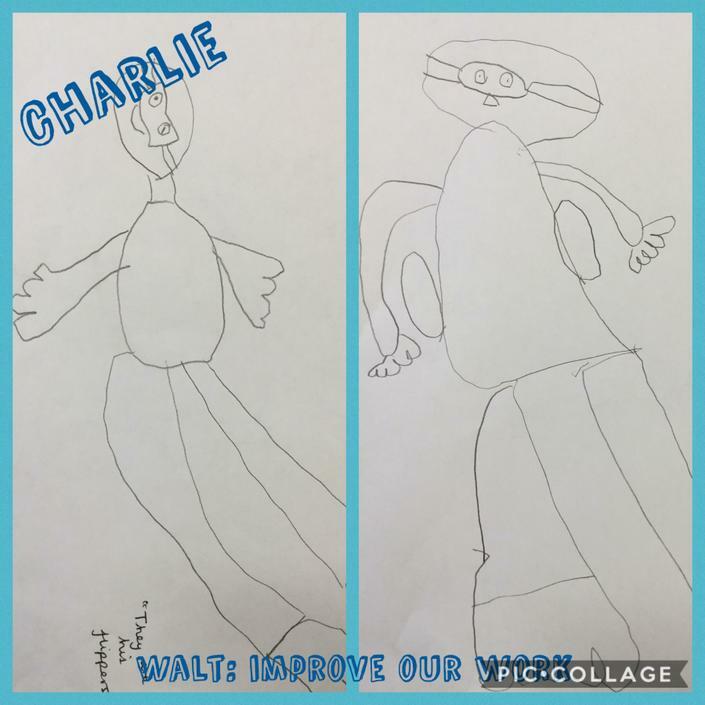 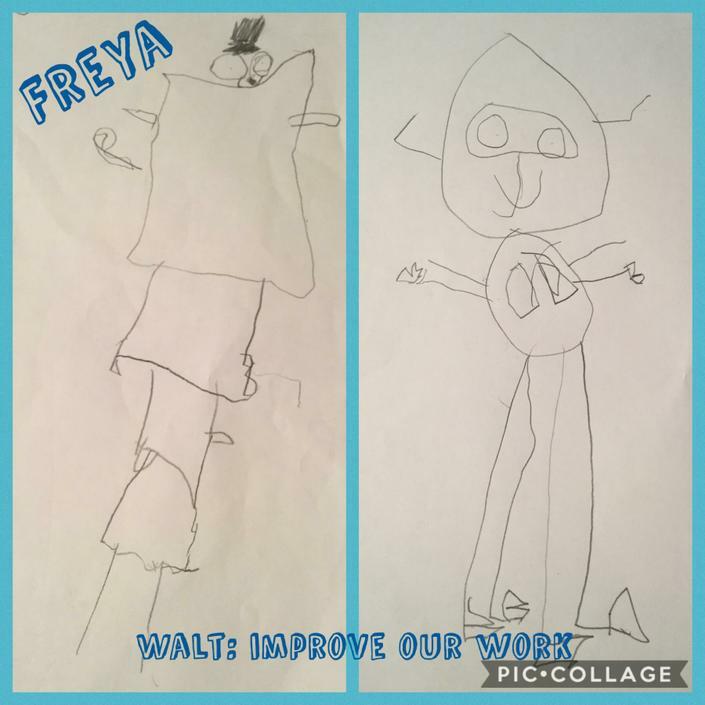 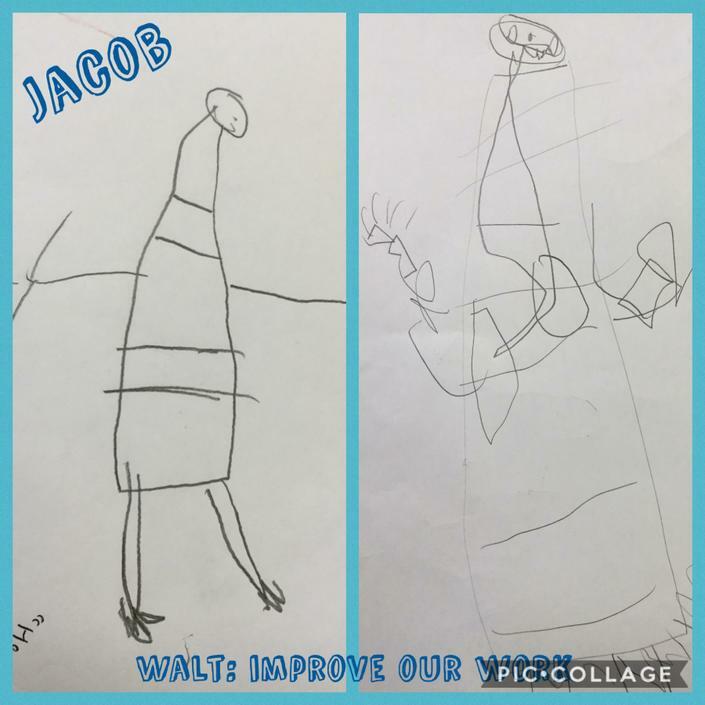 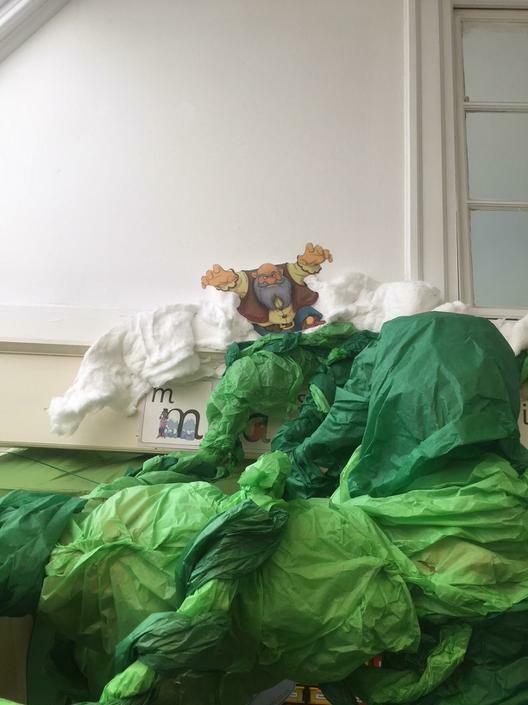 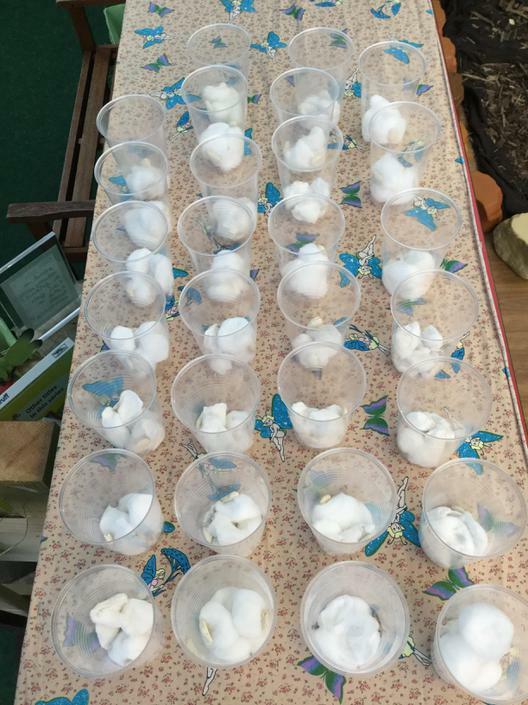 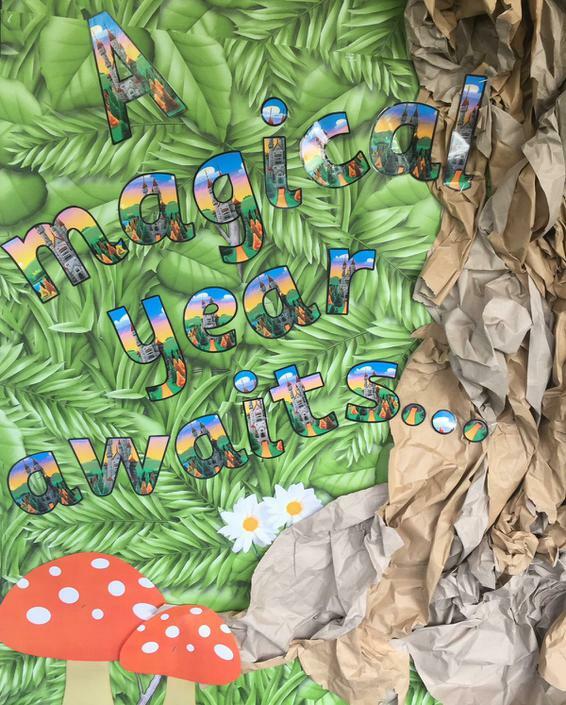 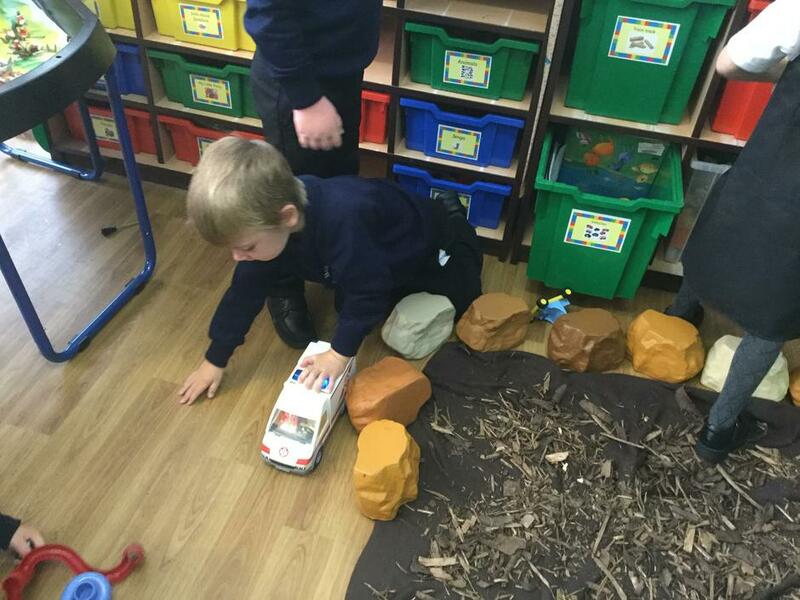 Towards the end of the Spring term we will begin creating our own 'story mountains' to develop our own story writing and storytelling language. 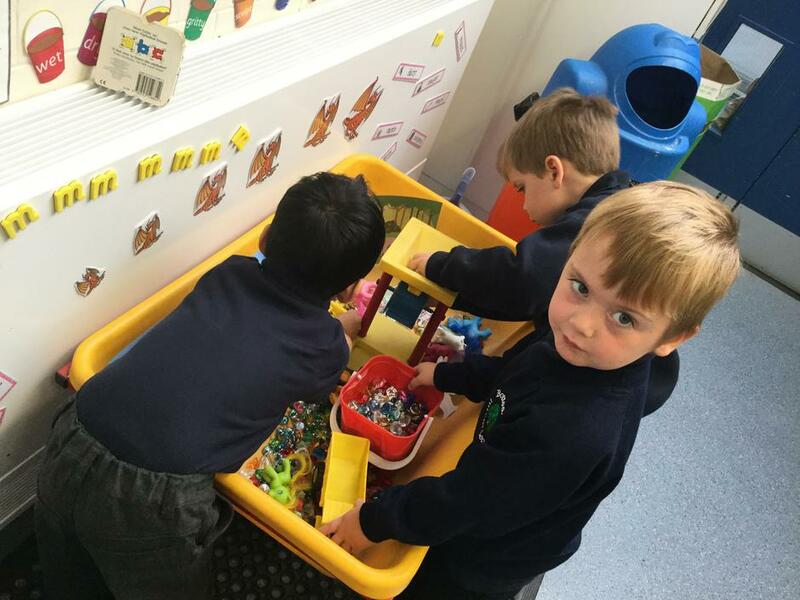 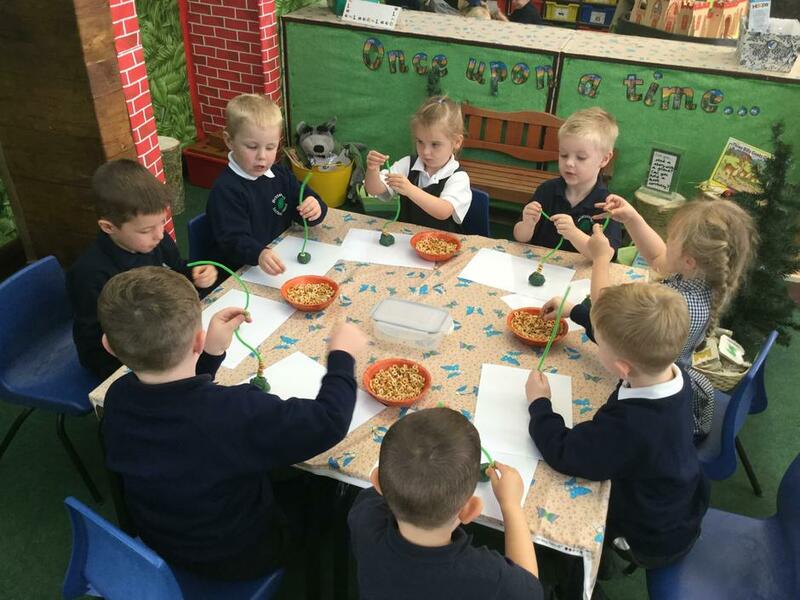 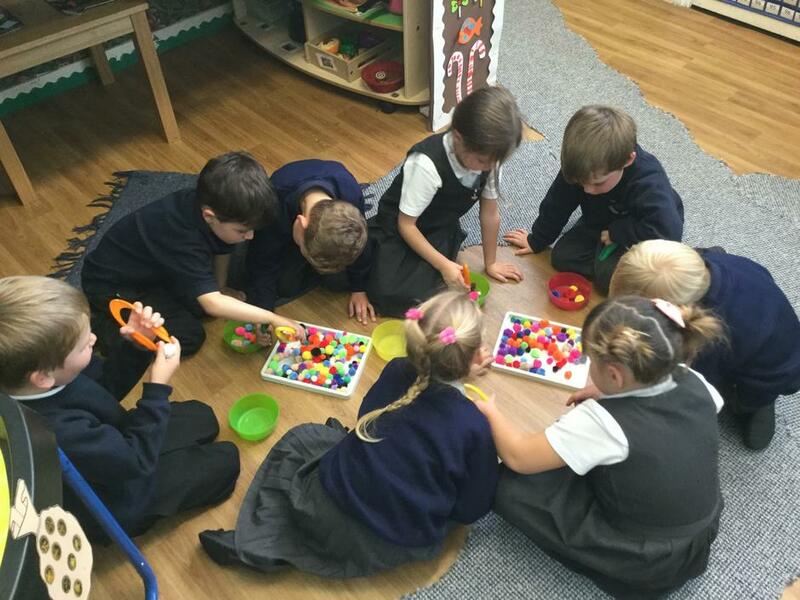 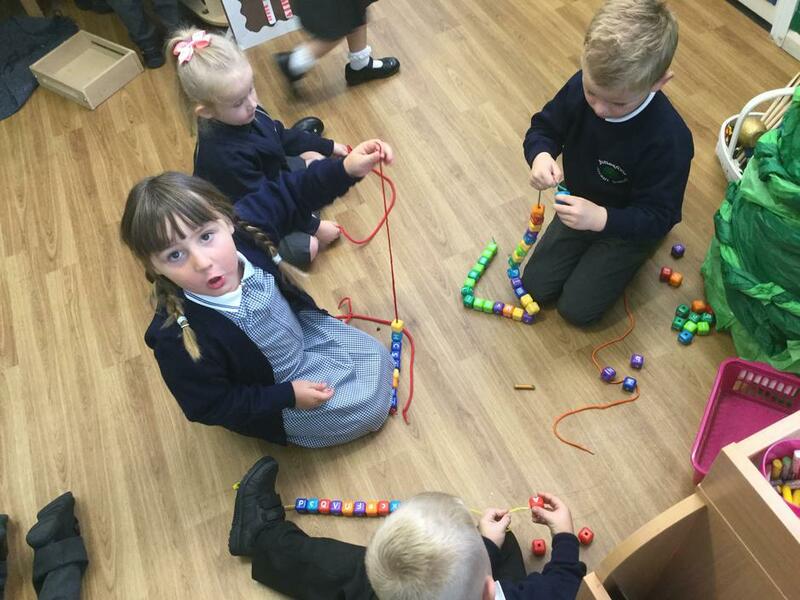 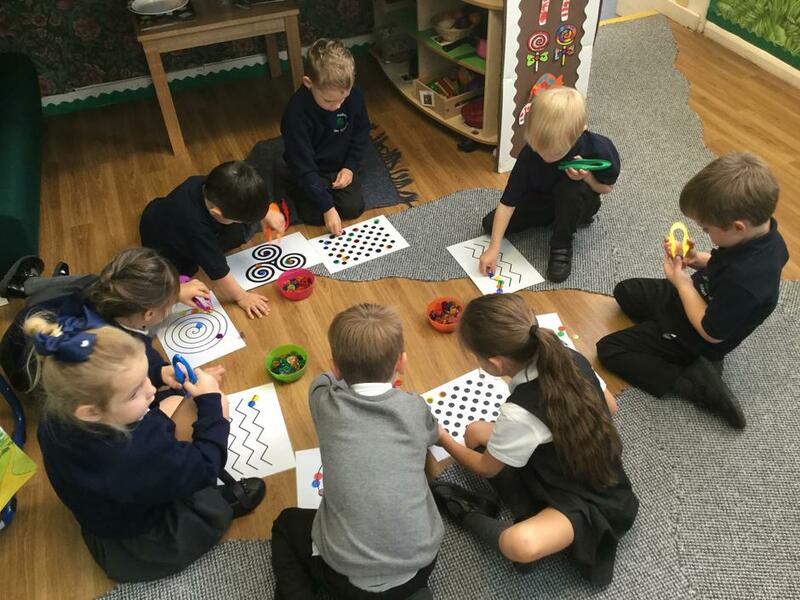 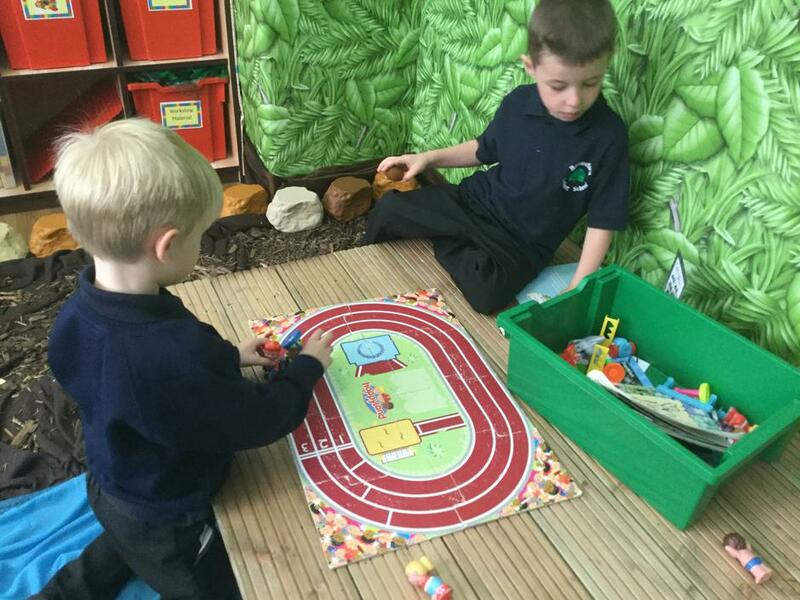 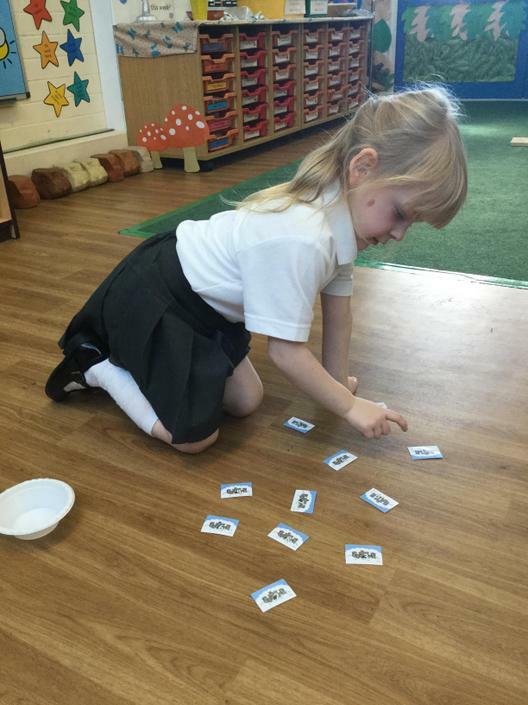 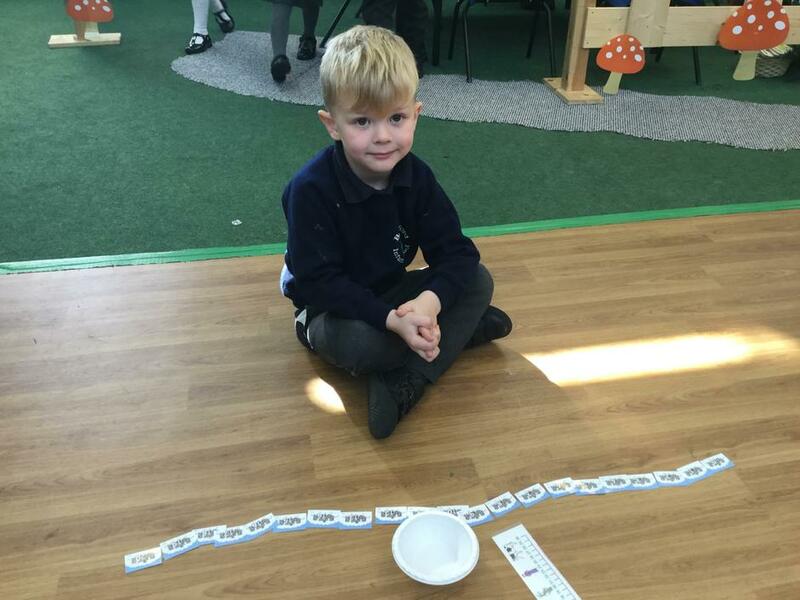 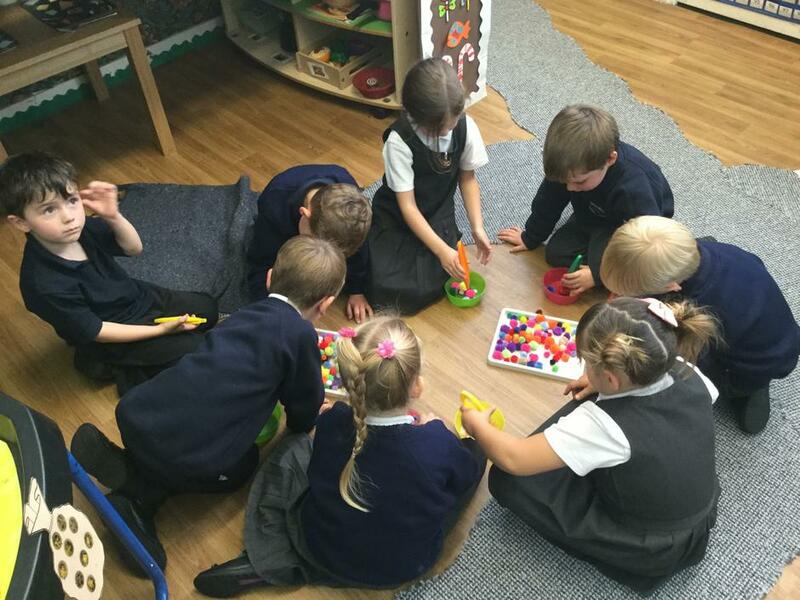 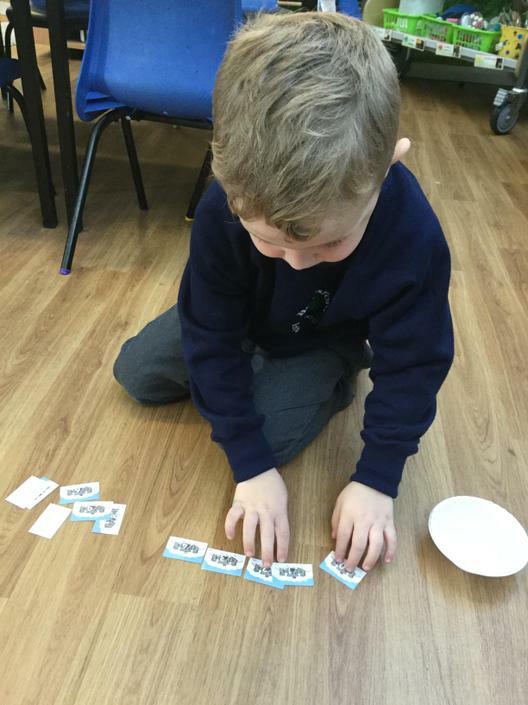 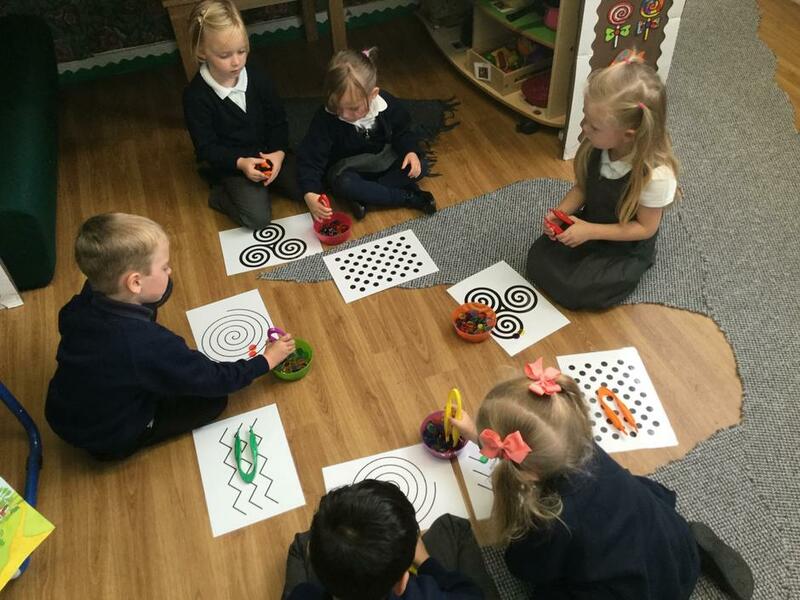 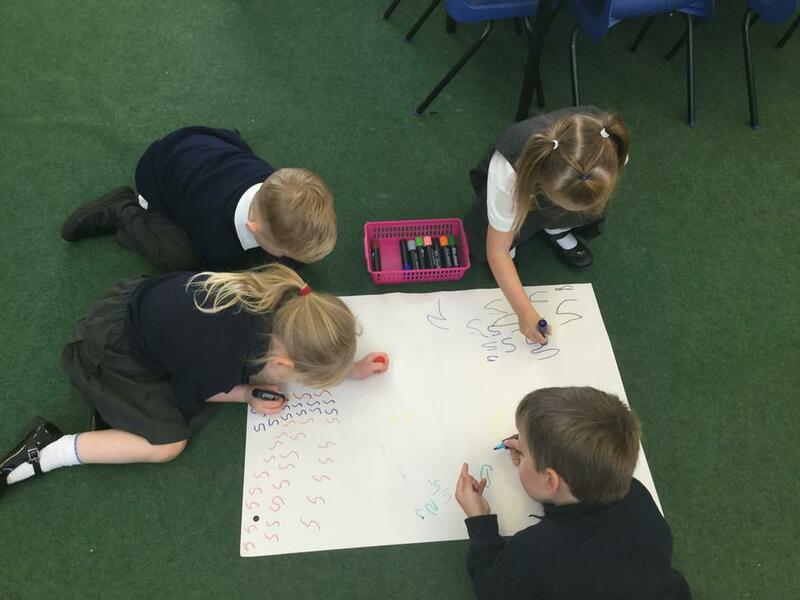 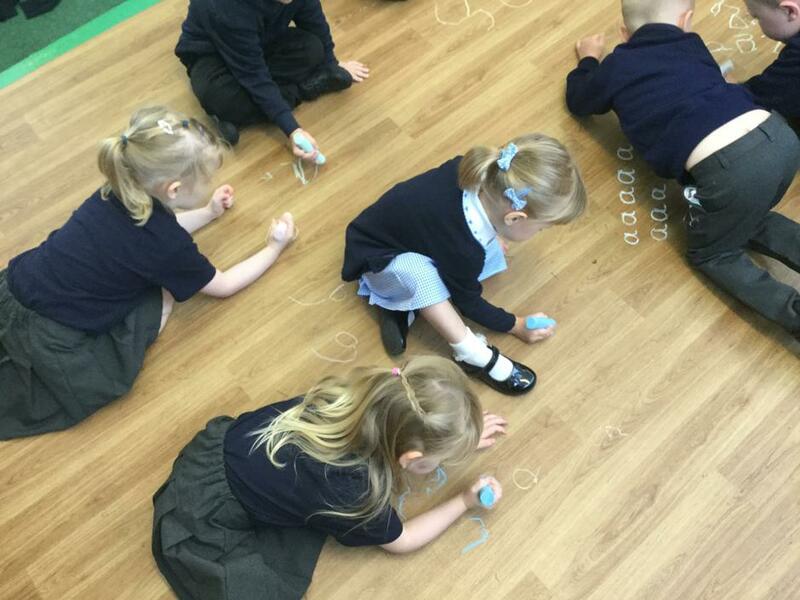 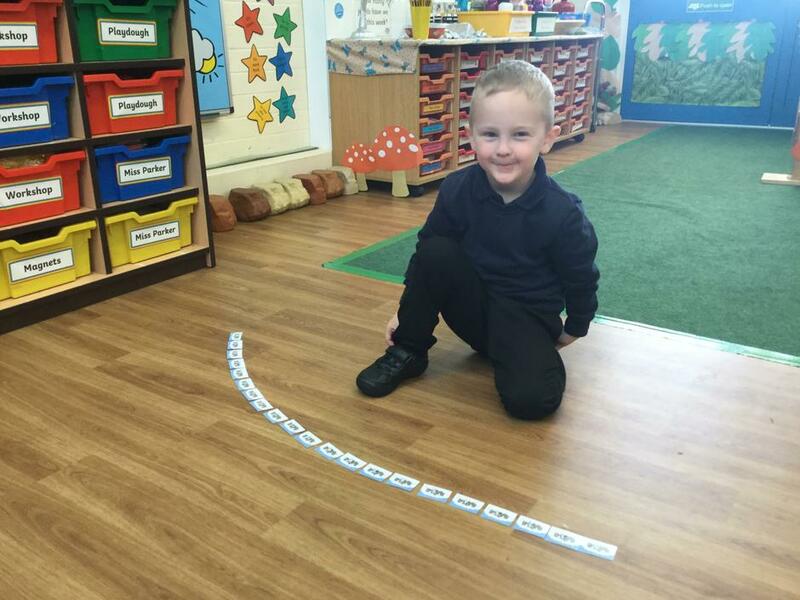 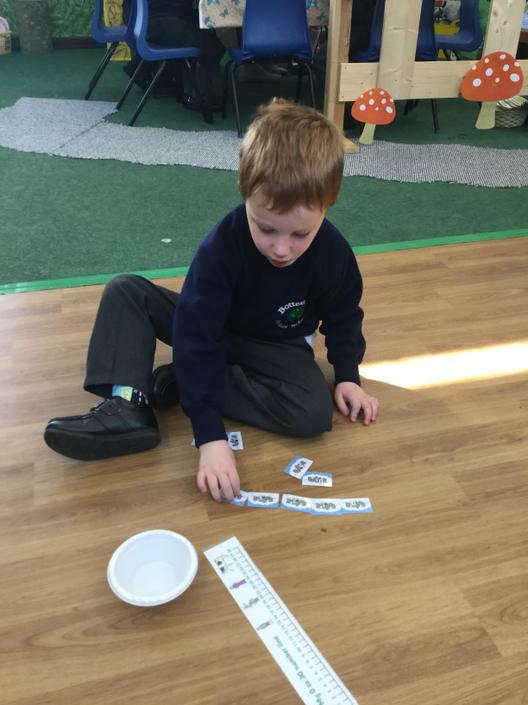 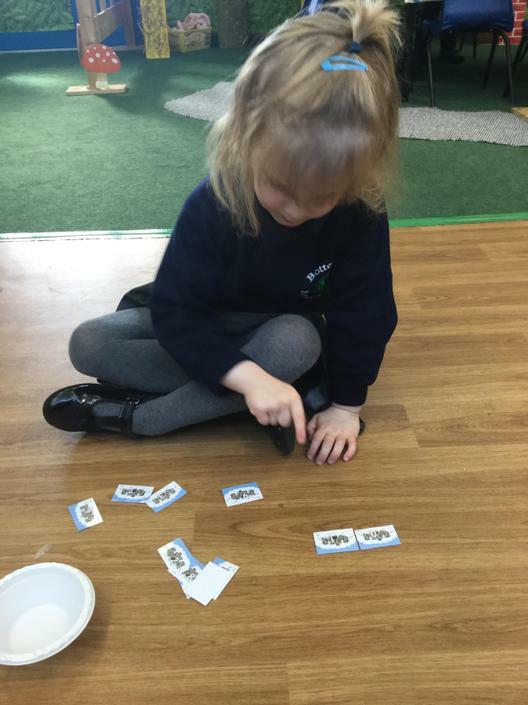 We will recognise and order numbers to 20 and beyond and use our counting skills to count groups of objects accurately. 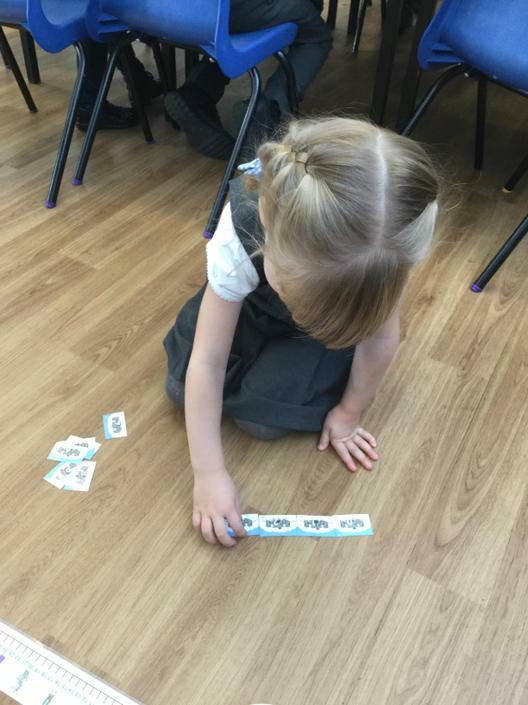 We will learnt to count in 2s, 5s and 10s. 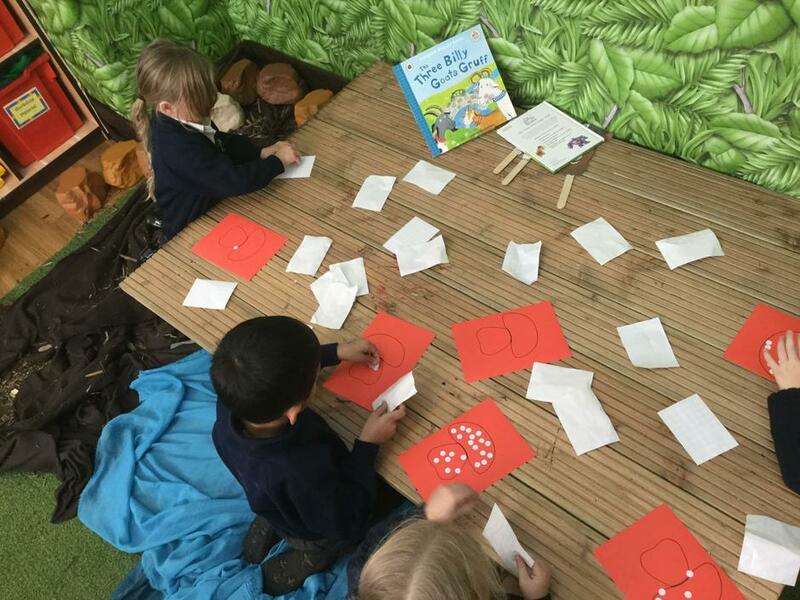 We will learn to say the number that is one/two more and one/two less than a given number. 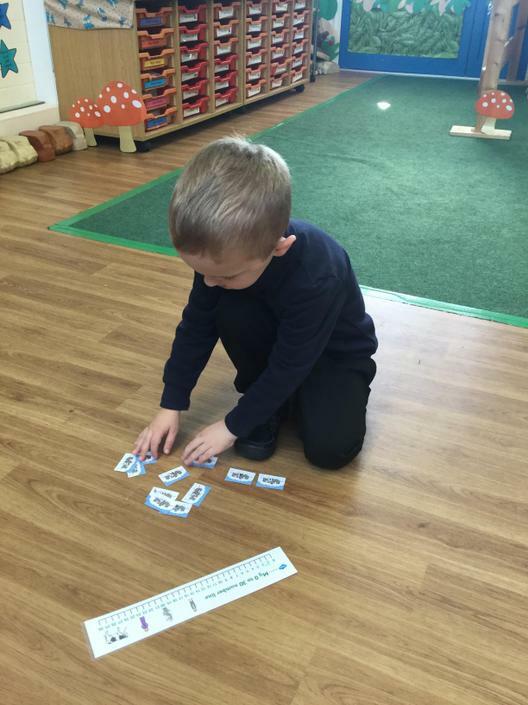 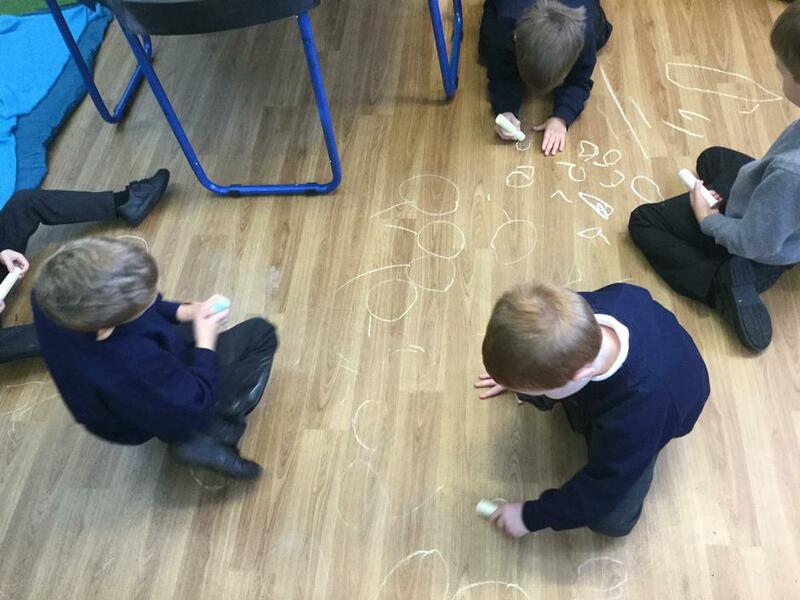 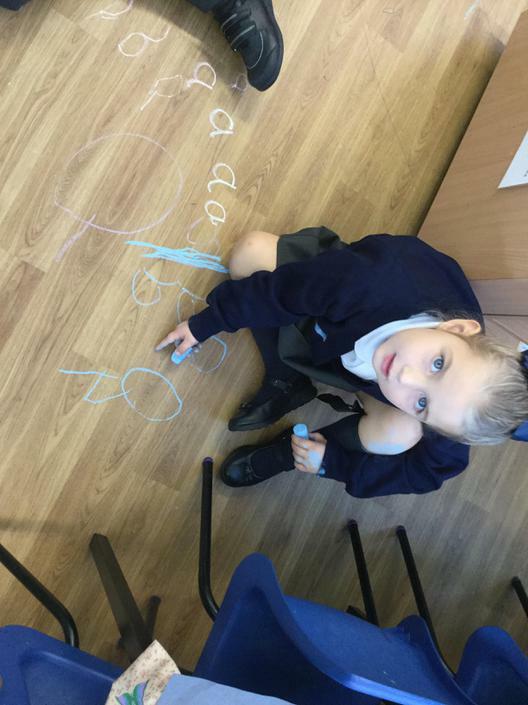 We will also begin simple addition and subtraction work, using practical objects to support our understanding of this. 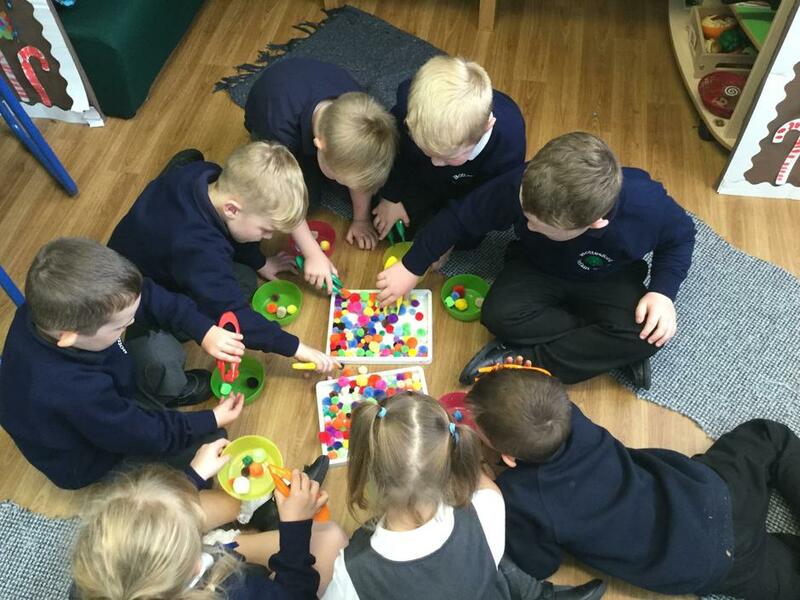 We will also solve problems using doubling, halving and sharing. 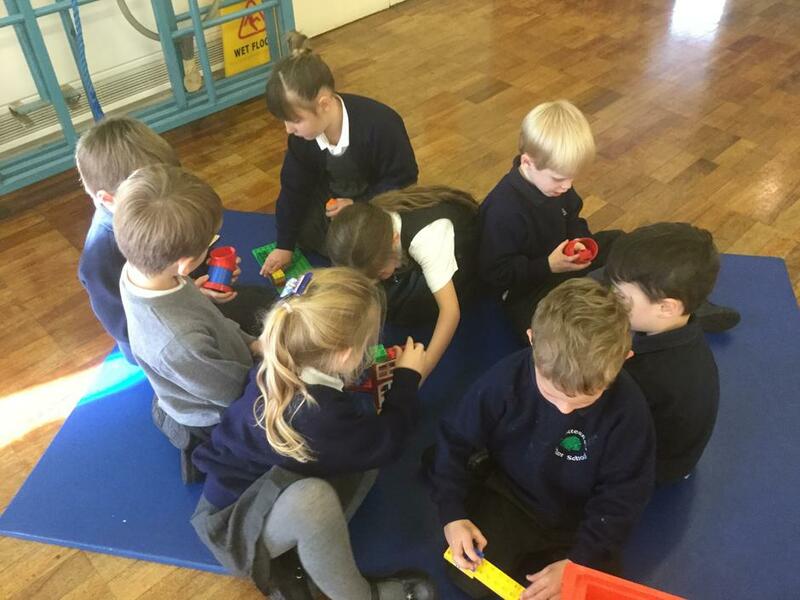 In 'Shape, space and measure' we will learn to tell the time to o'clock and half past, recognise coins and describe 2D and 3D shapes. 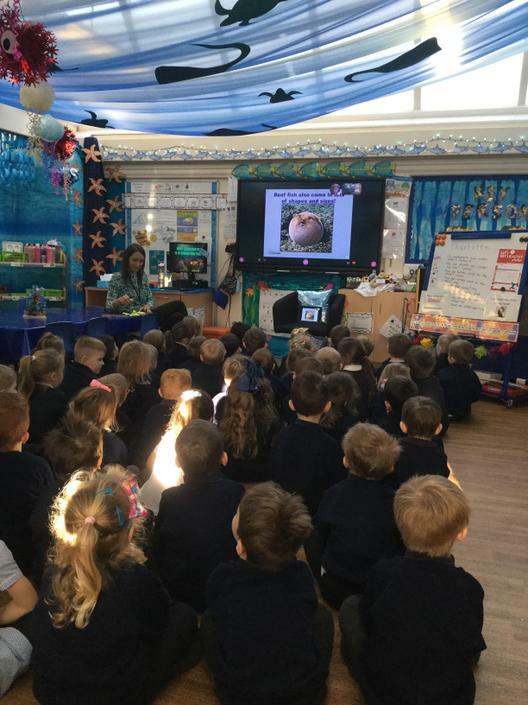 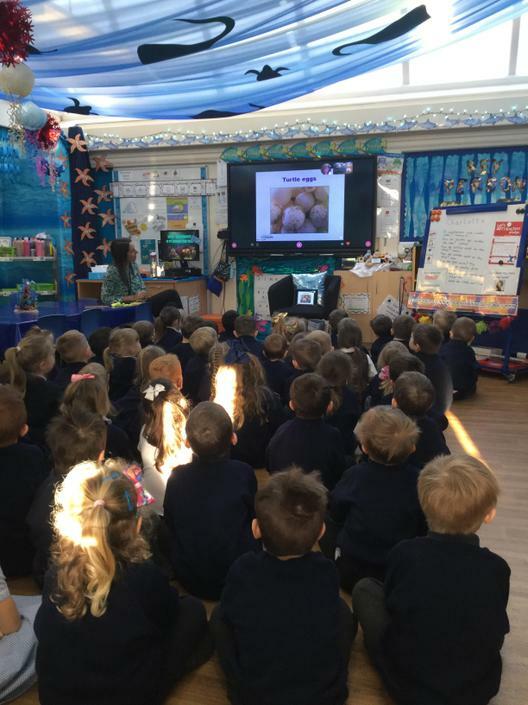 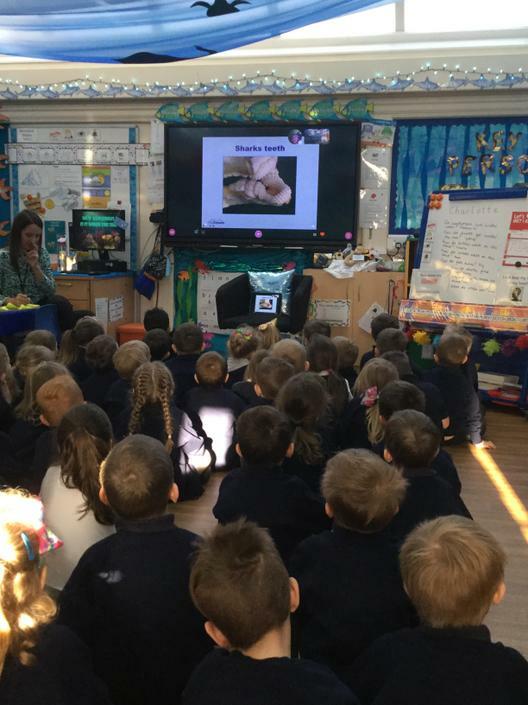 We will talk about our favourite things, families and likes/dislikes and learn about special celebrations such as Easter. 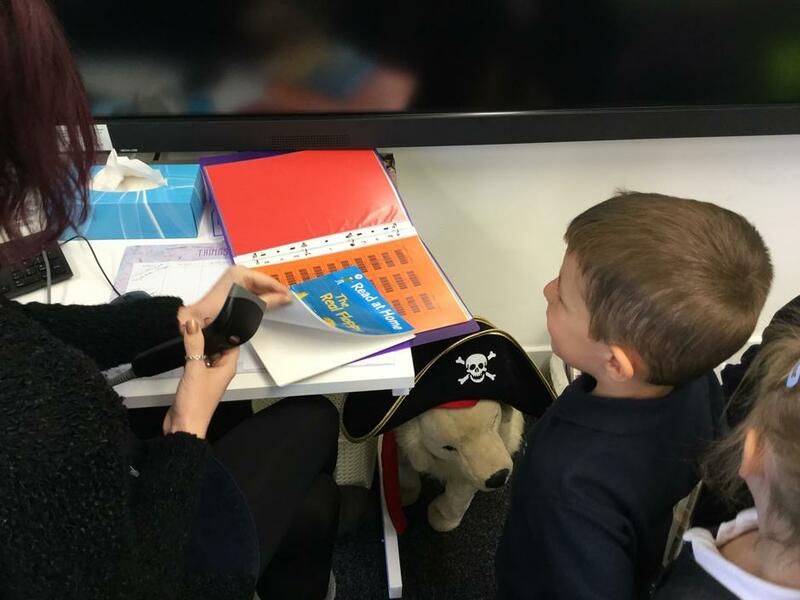 We will explore and use different technology such as iPad's and Dash, including Literacy apps on the iPads during guided reading sessions. 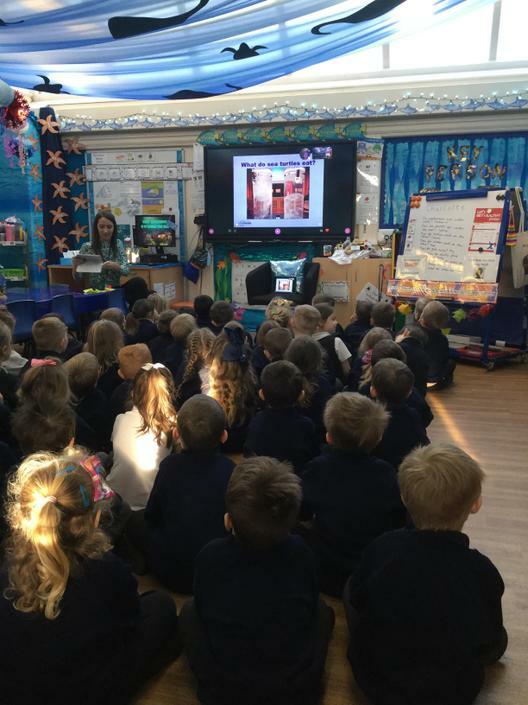 We will develop our understanding of keeping ourselves safe when using digital devices and online software on 'E-Safety day'. 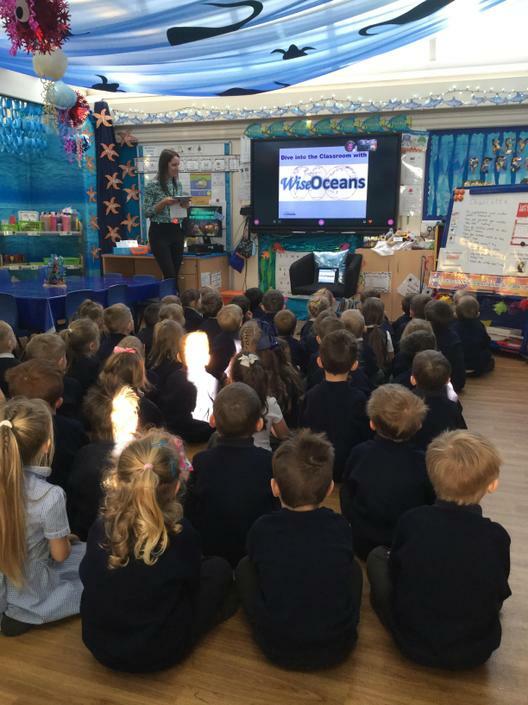 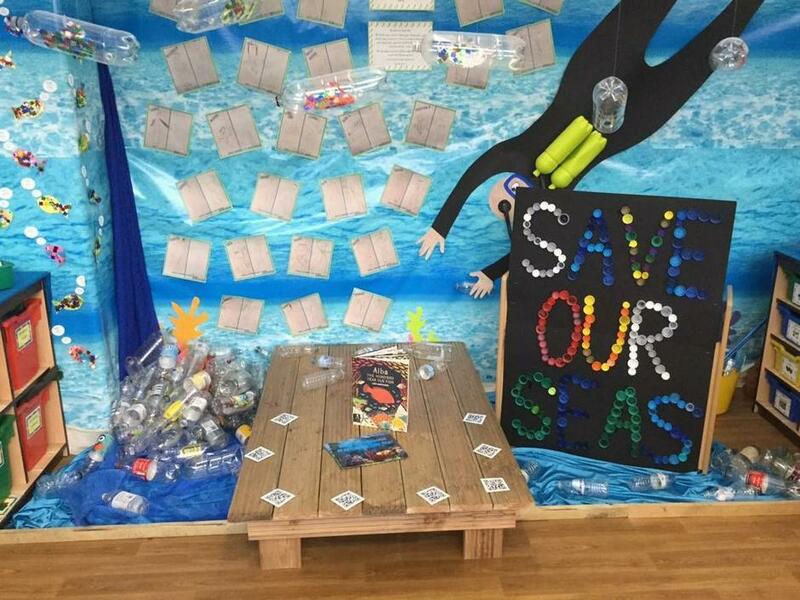 We will focus largely on the importance of recycling and the effects on the sea and also about 7 very dangerous sea creatures! 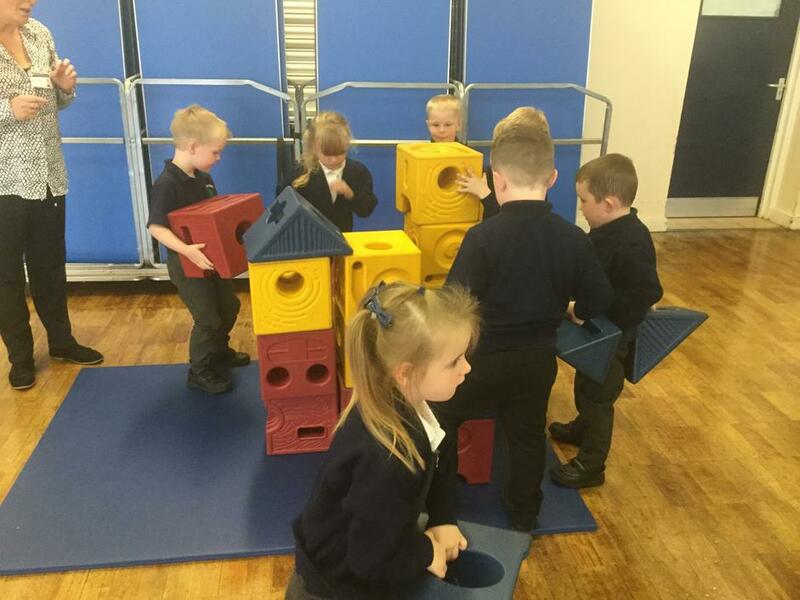 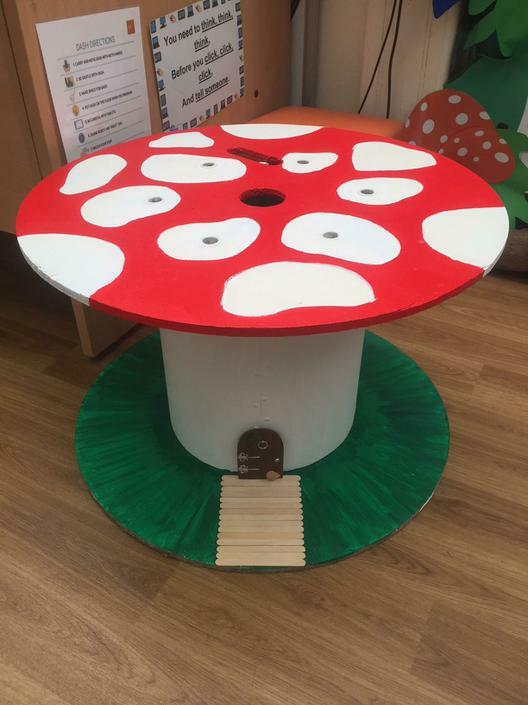 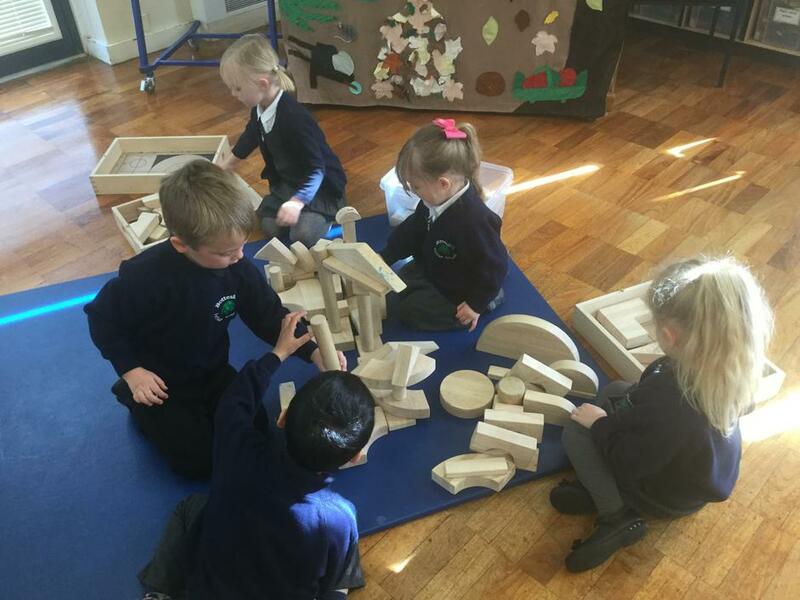 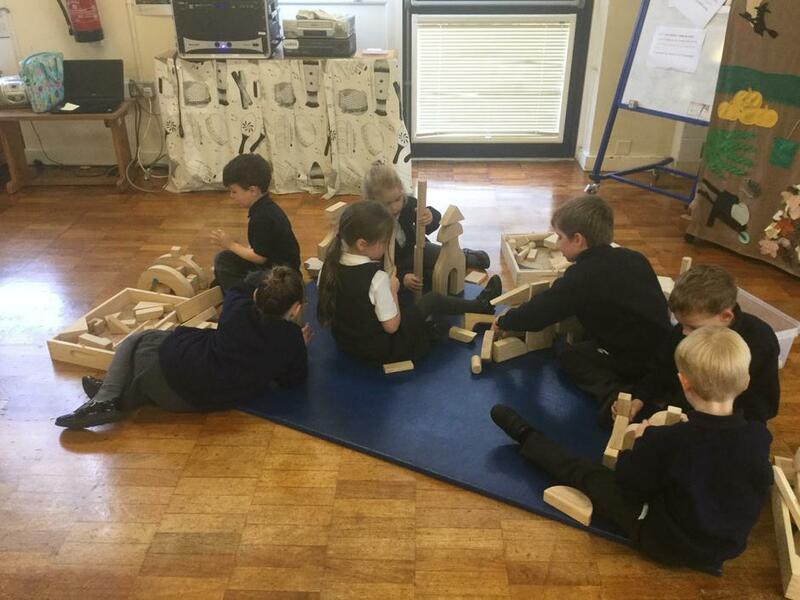 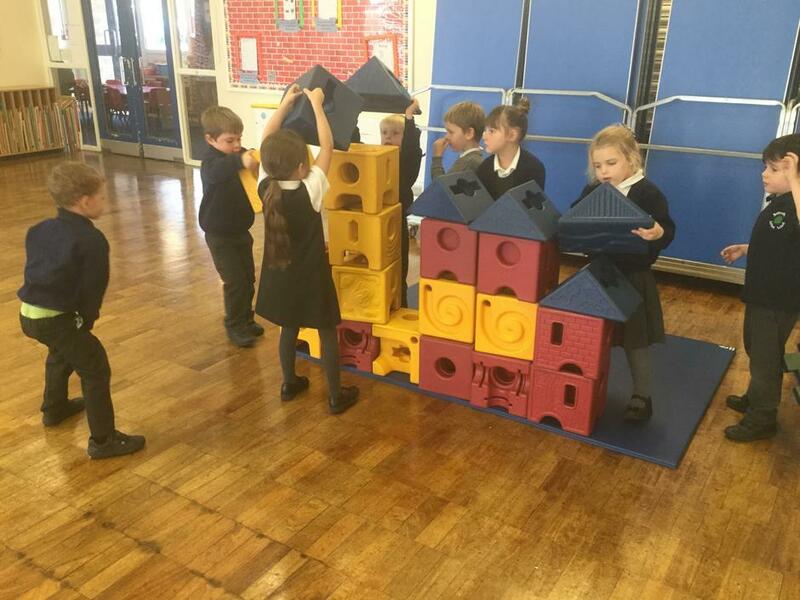 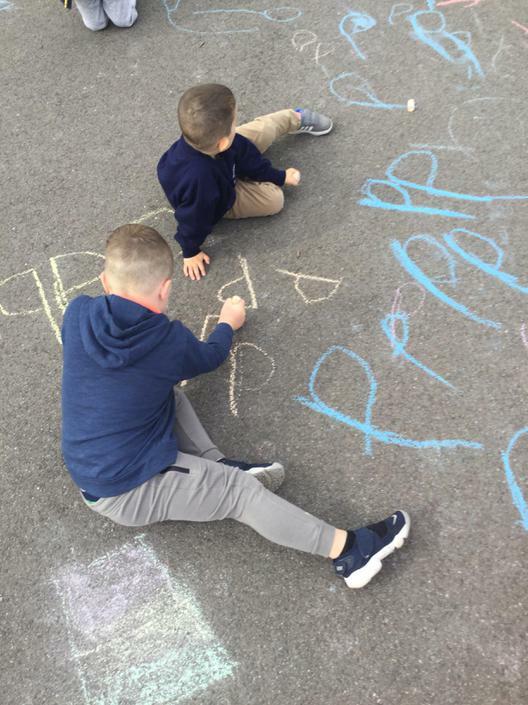 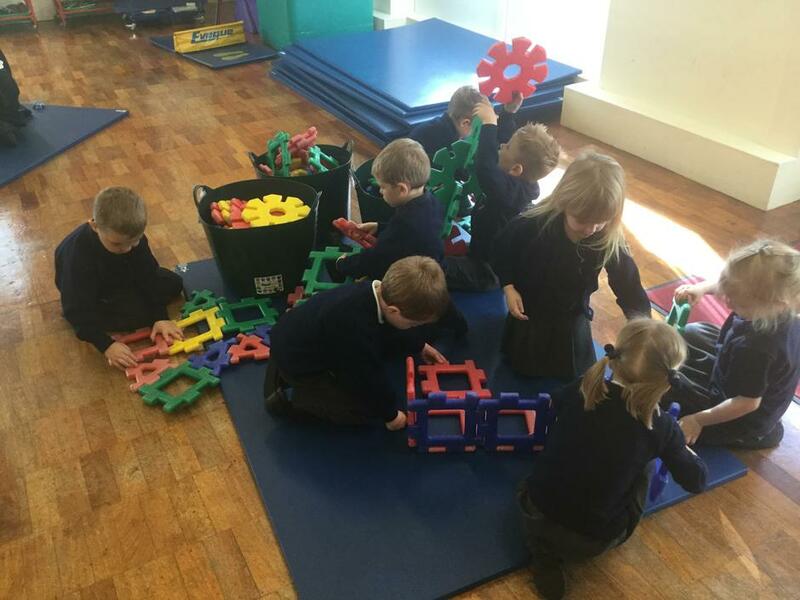 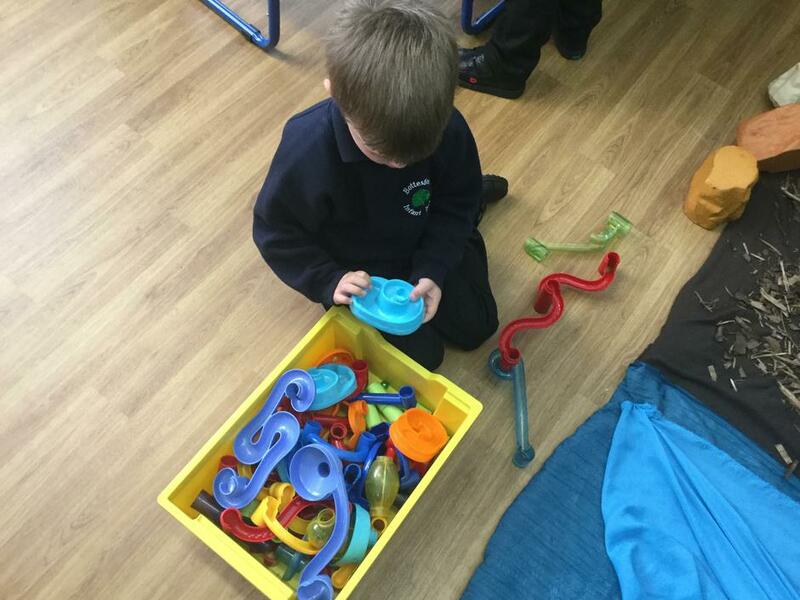 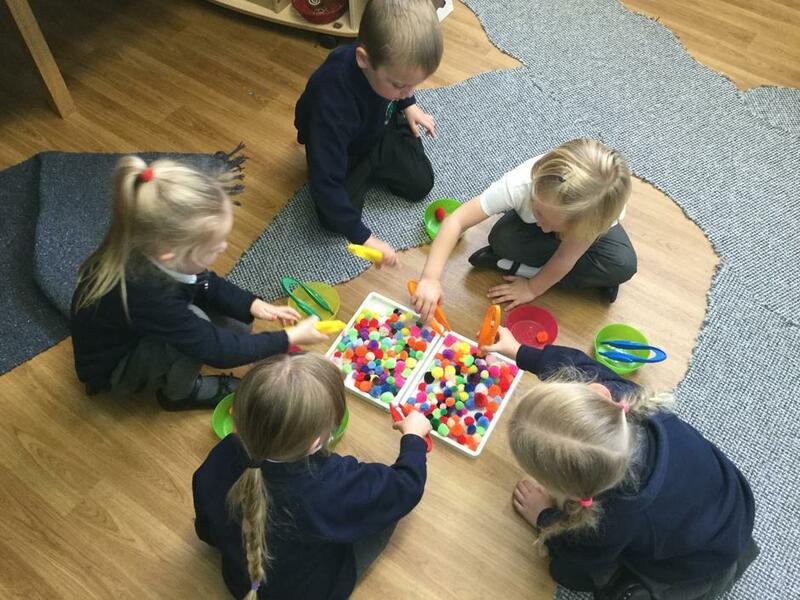 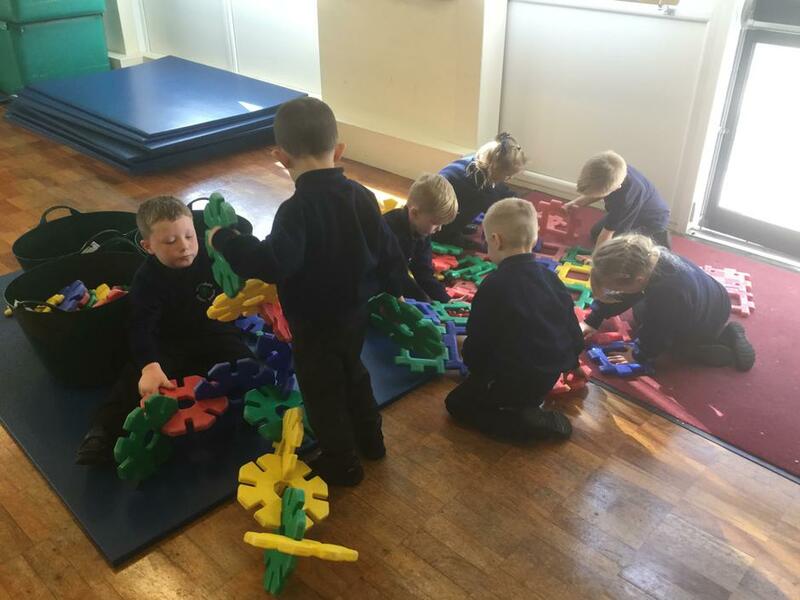 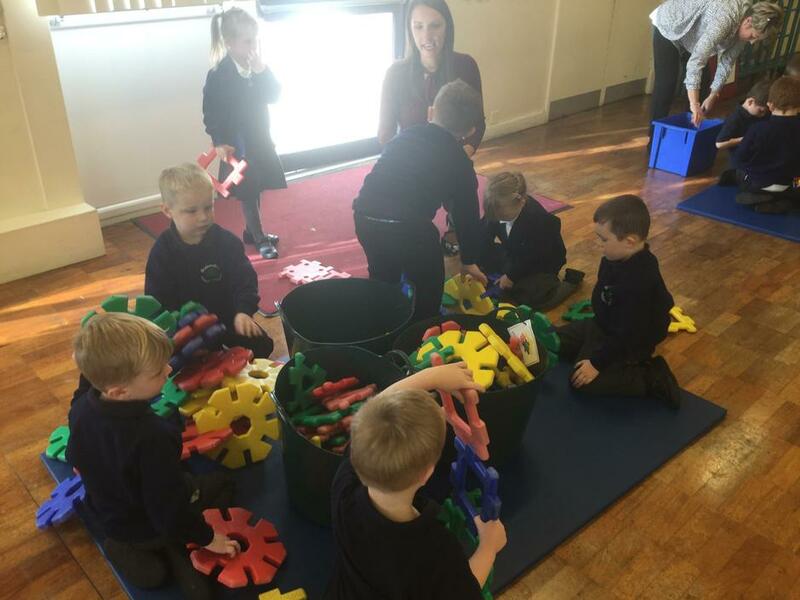 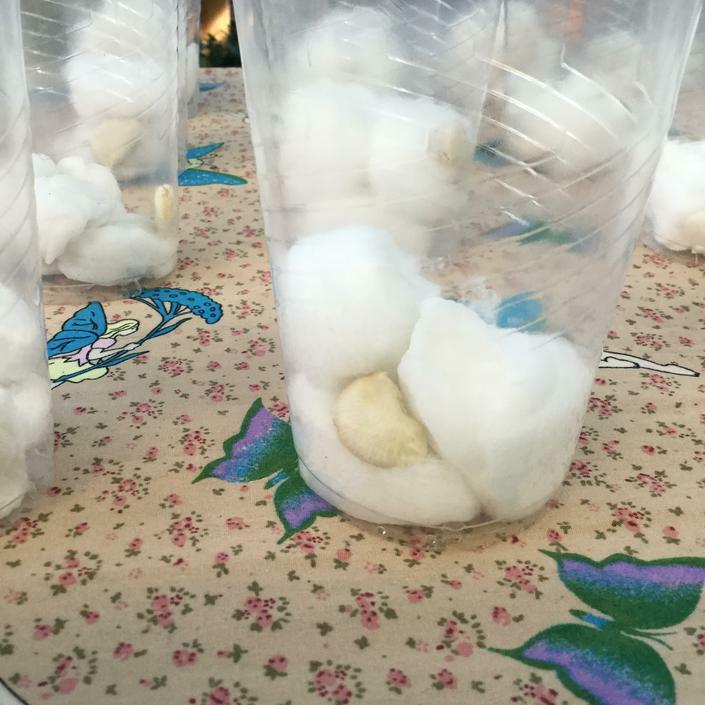 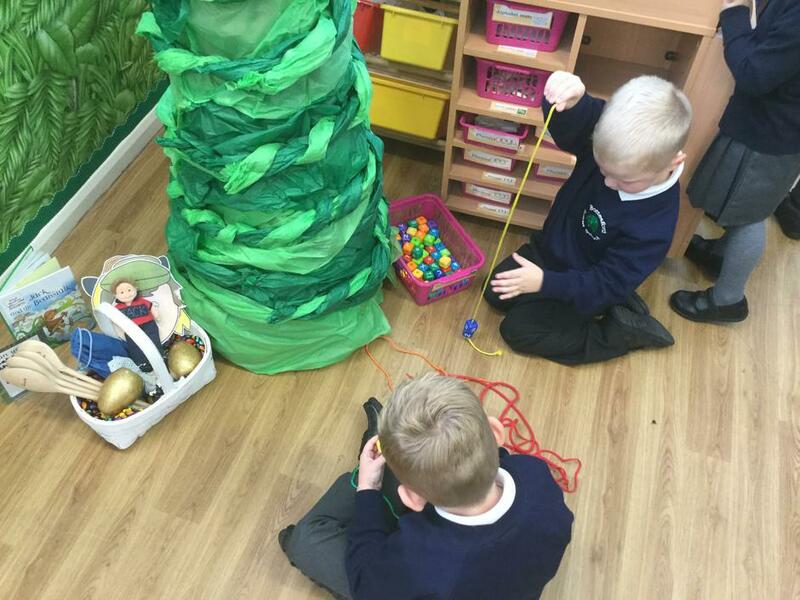 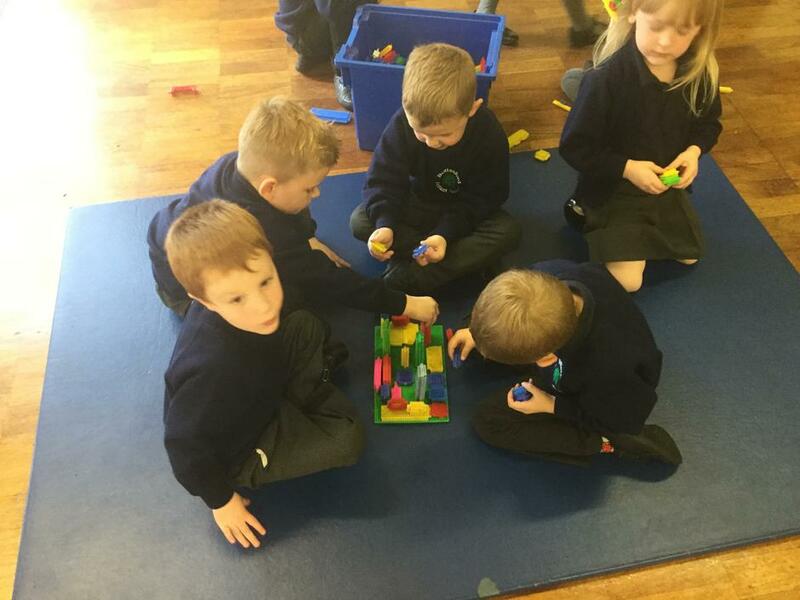 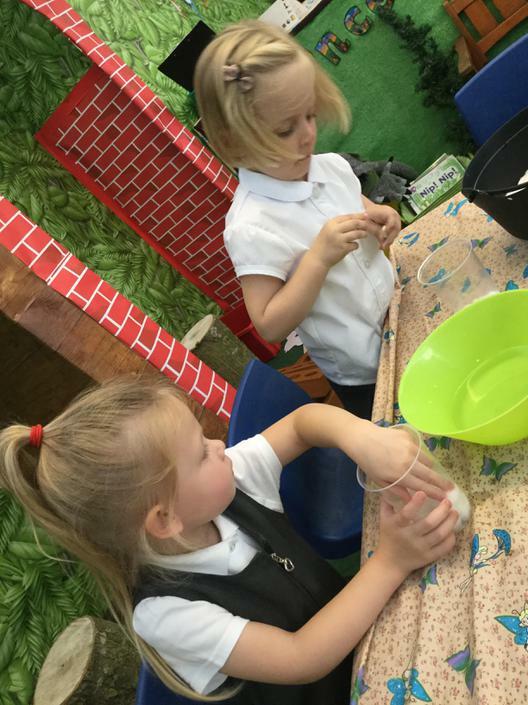 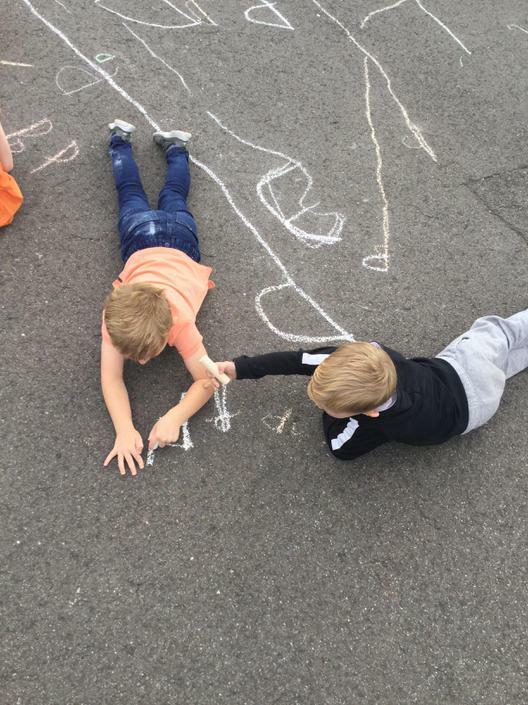 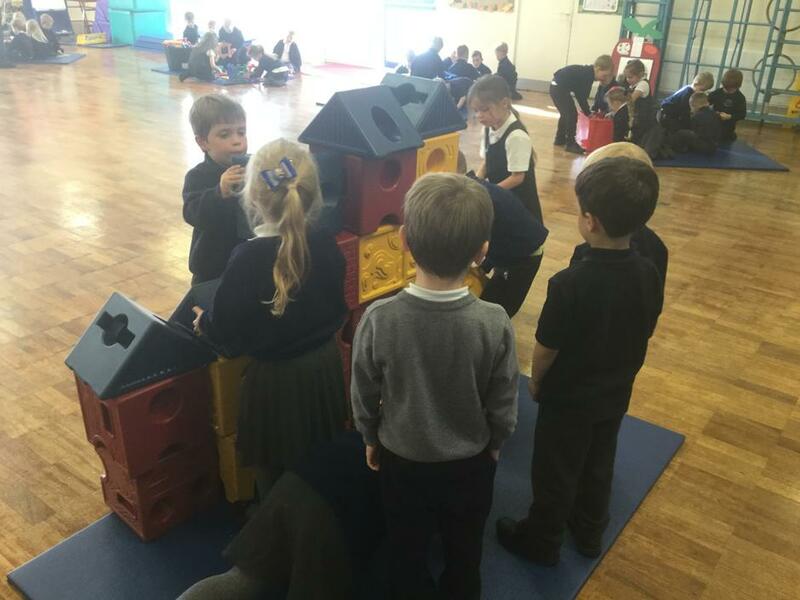 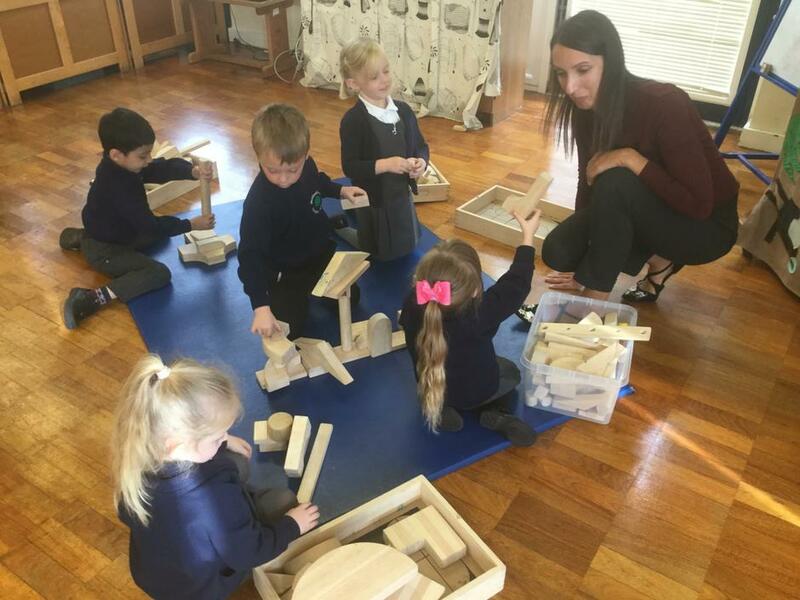 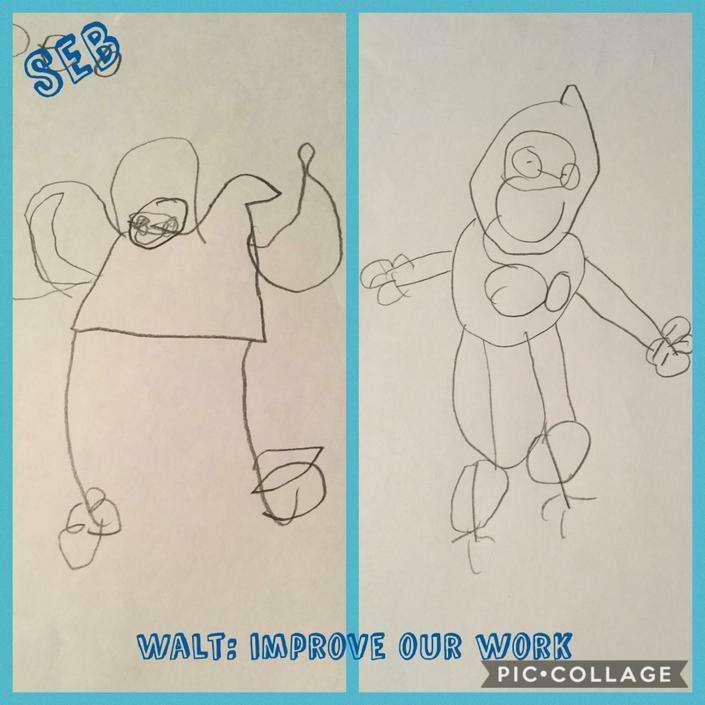 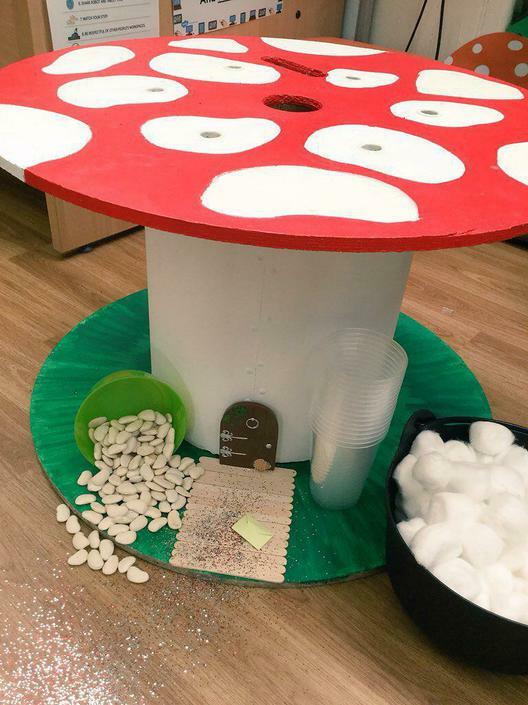 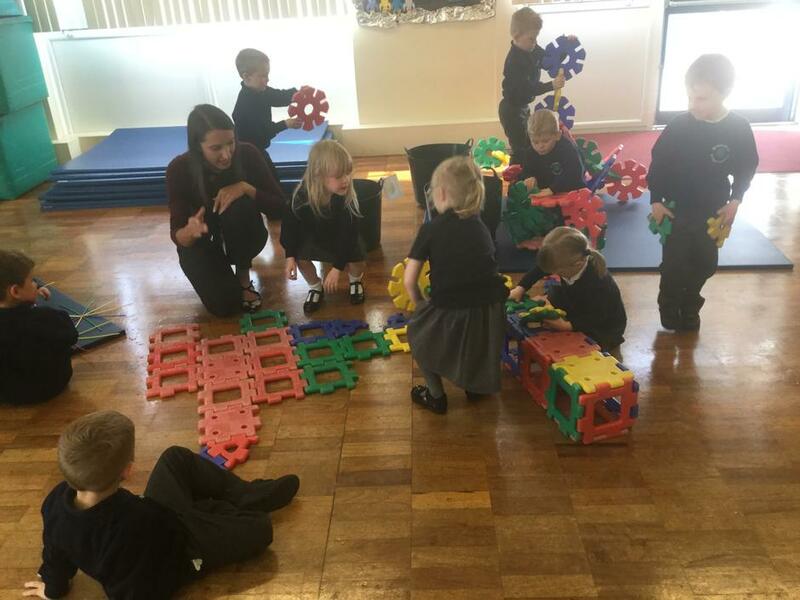 We will explore different techniques, resources and materials during both adult-led activities and self-directed play. 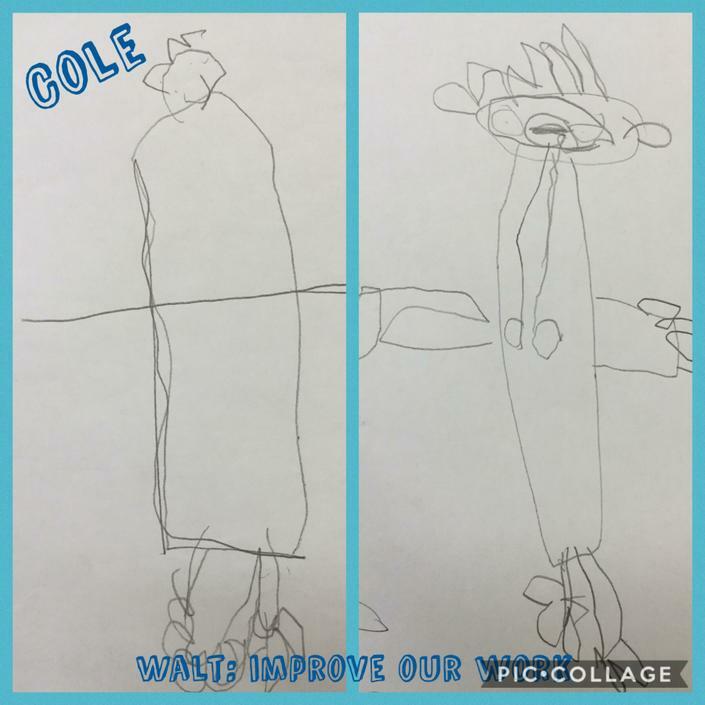 We will participate in whole school Wake and Shake routines and act out stories in role-play. 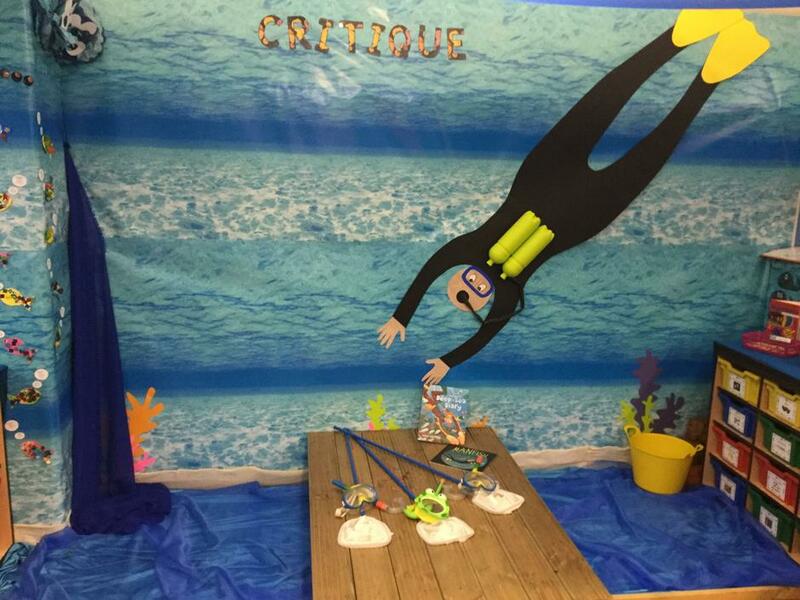 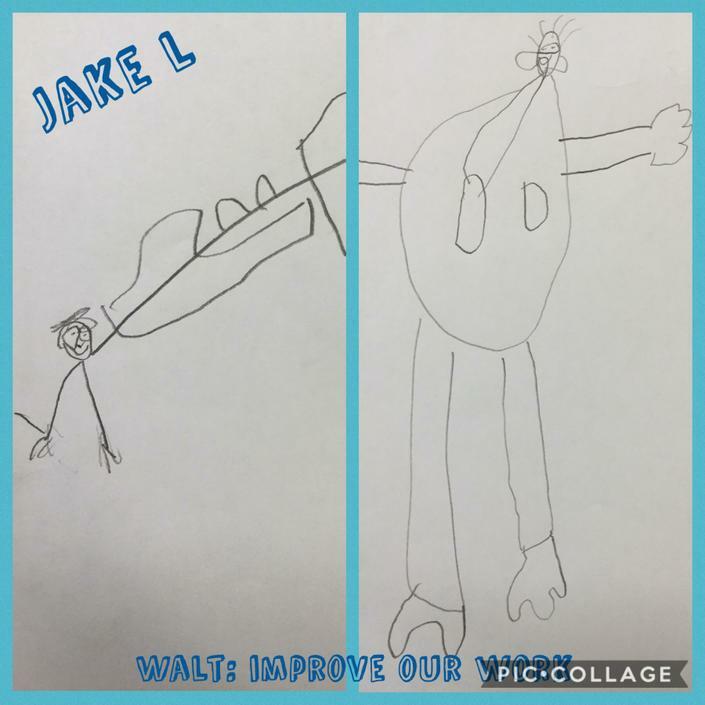 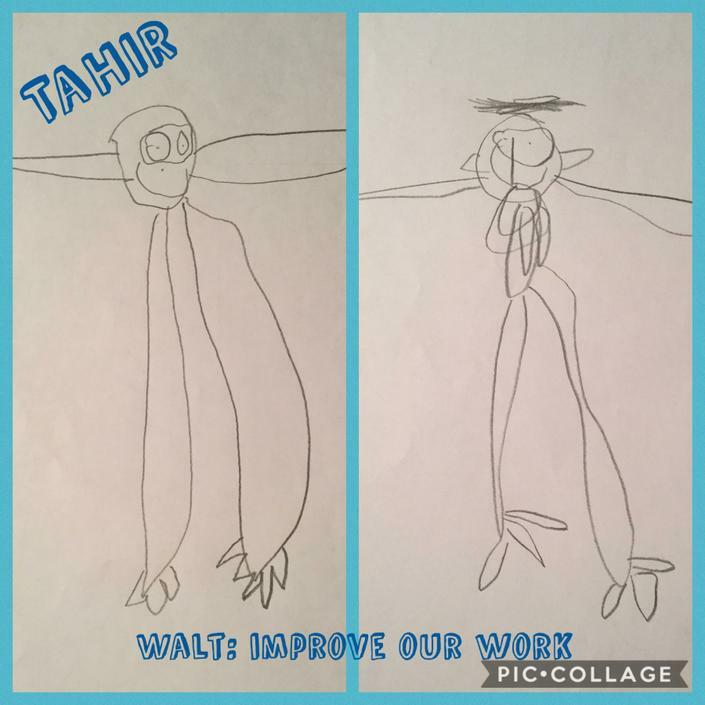 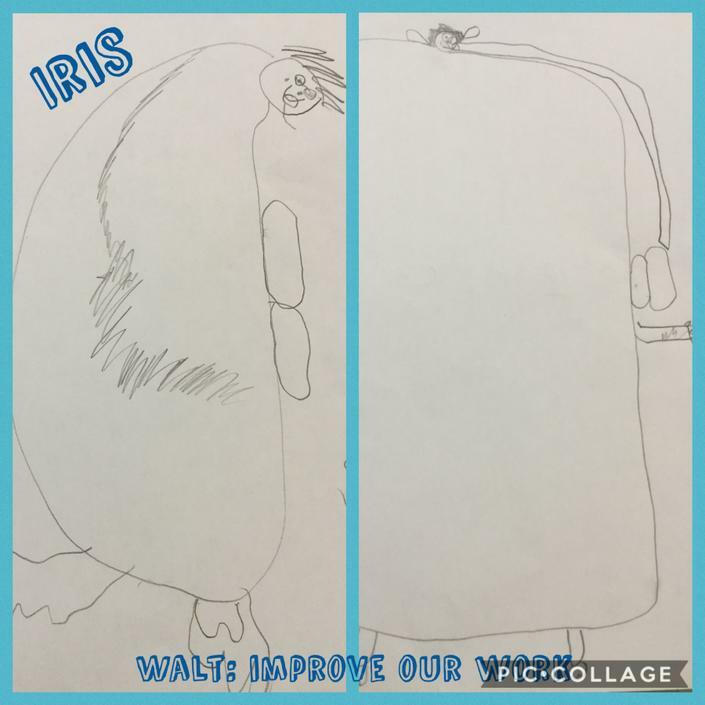 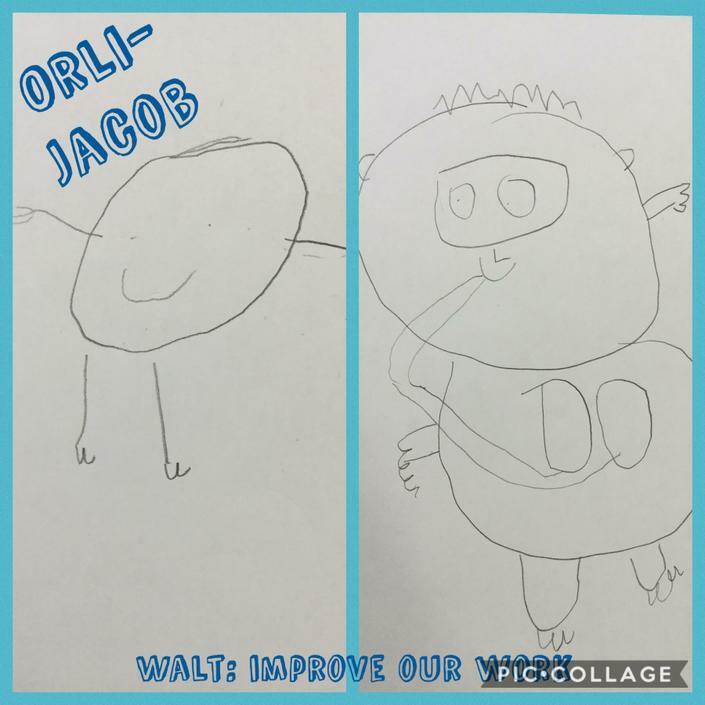 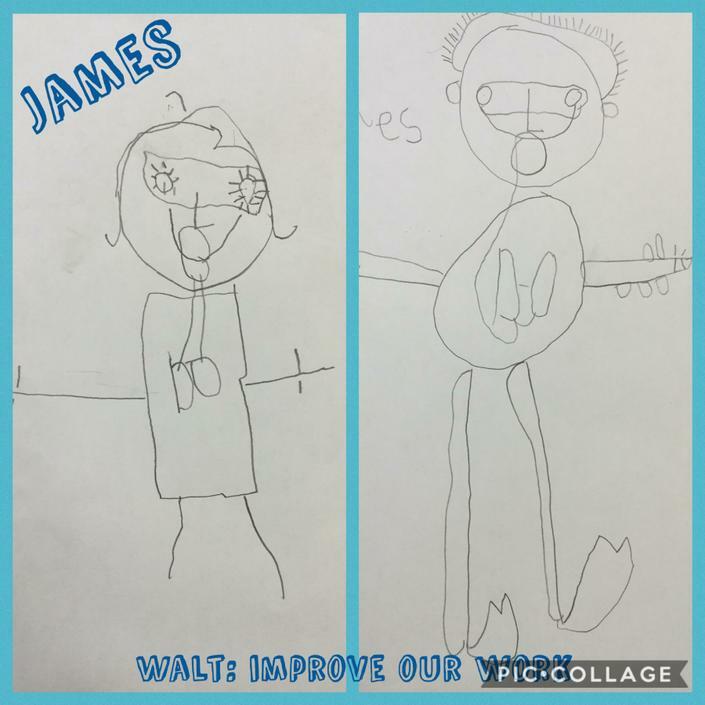 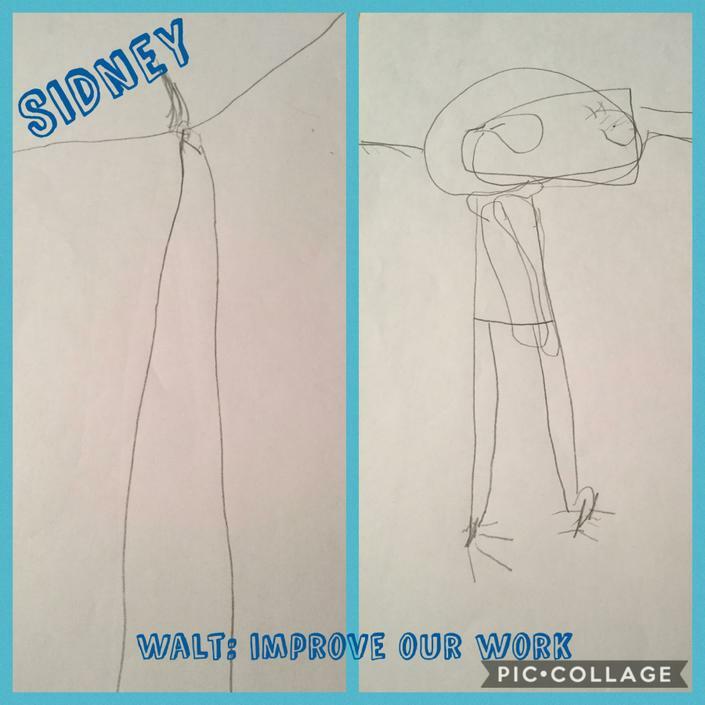 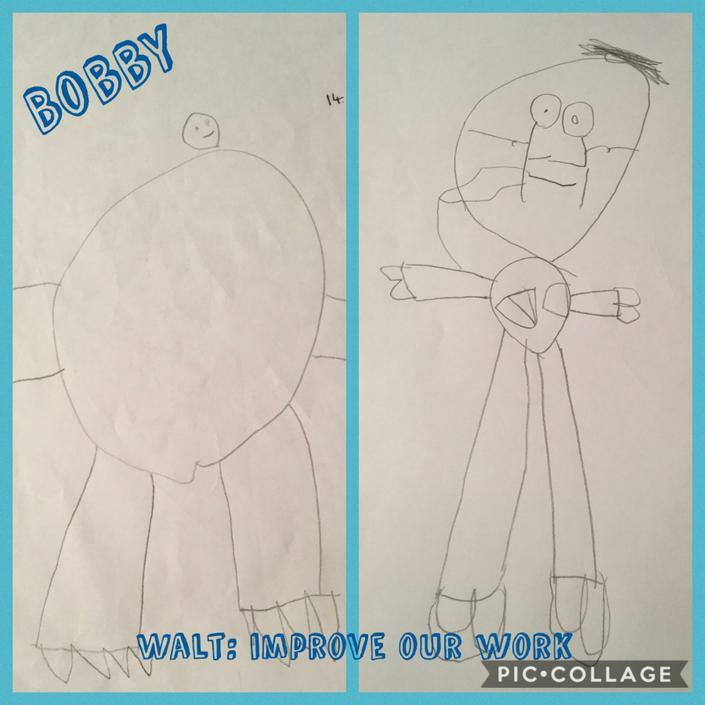 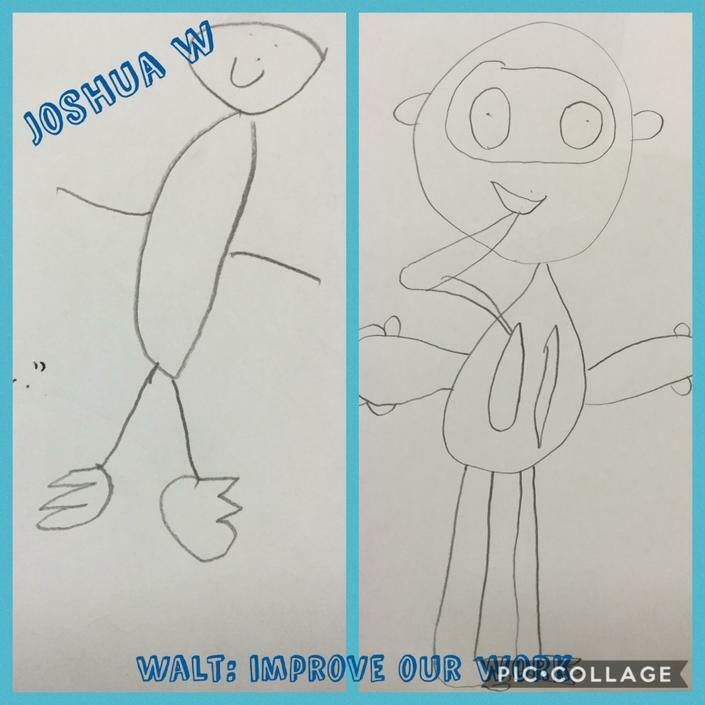 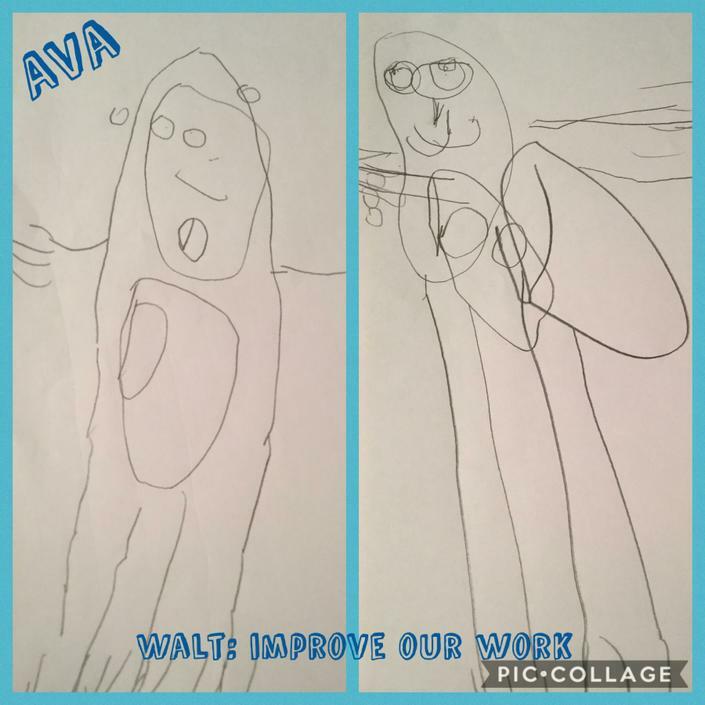 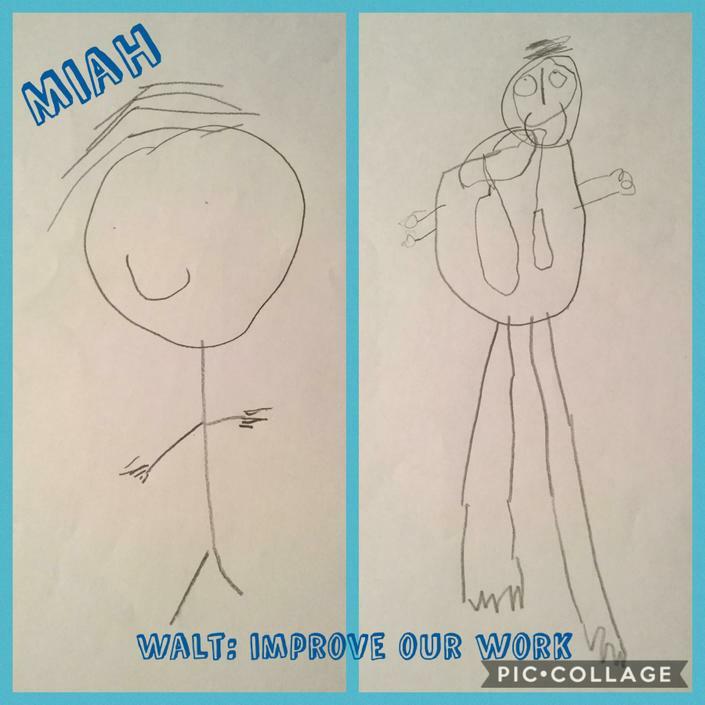 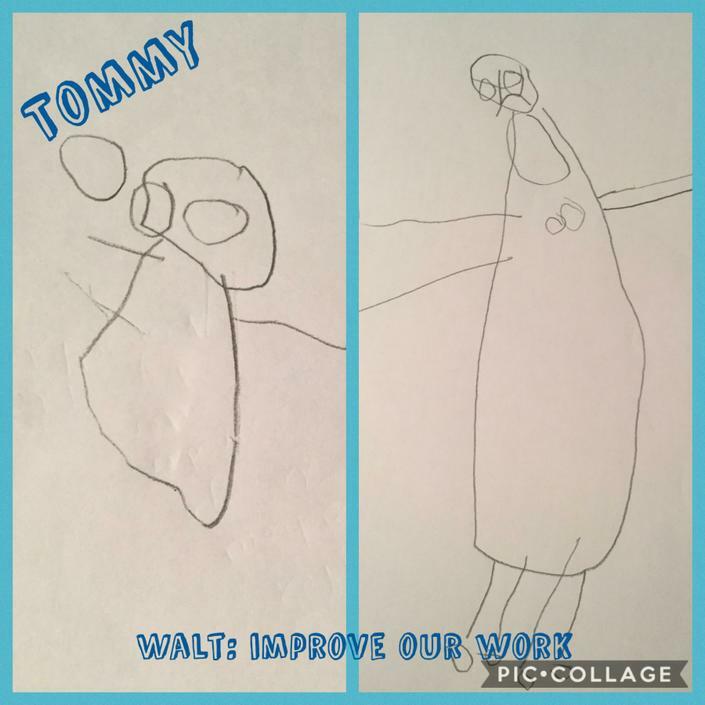 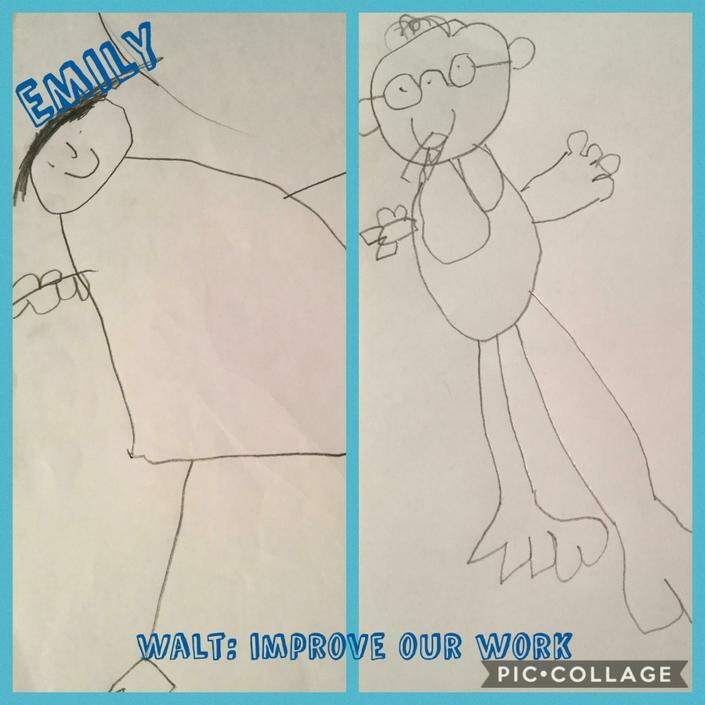 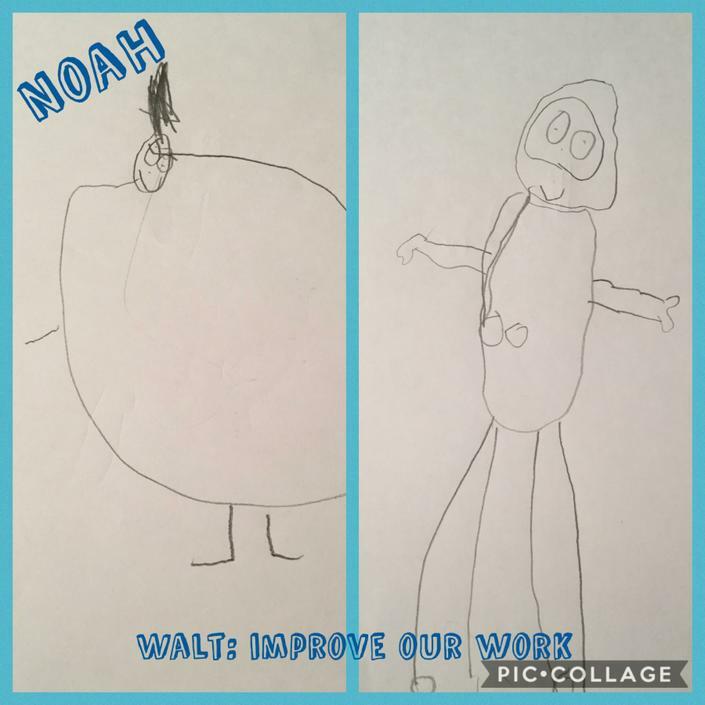 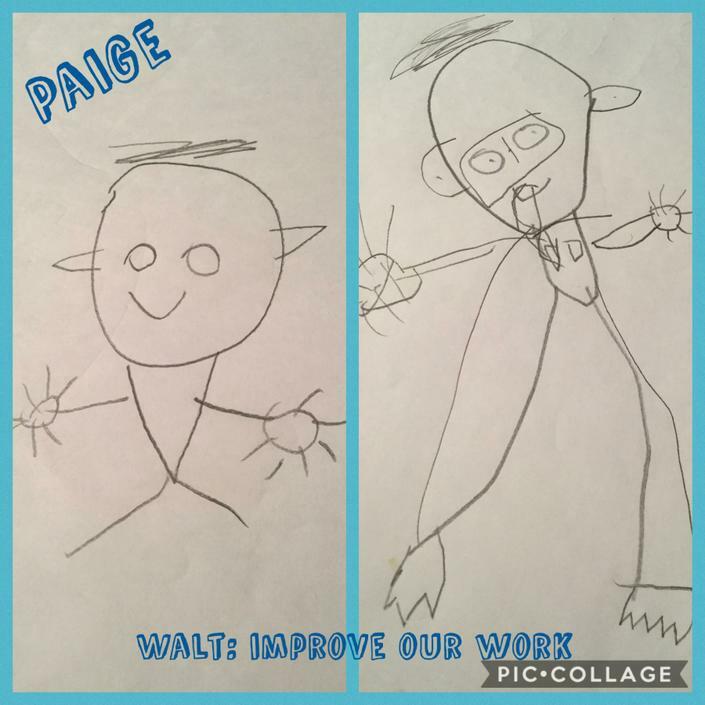 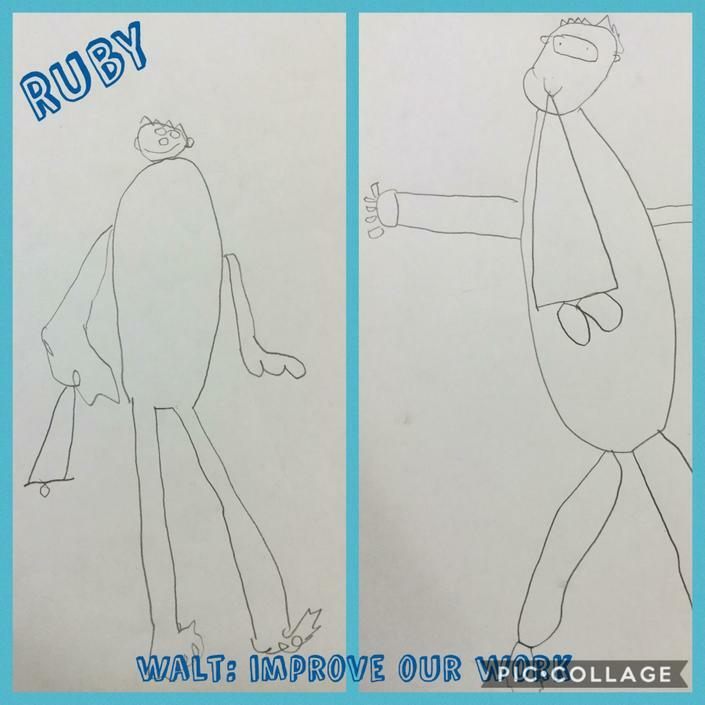 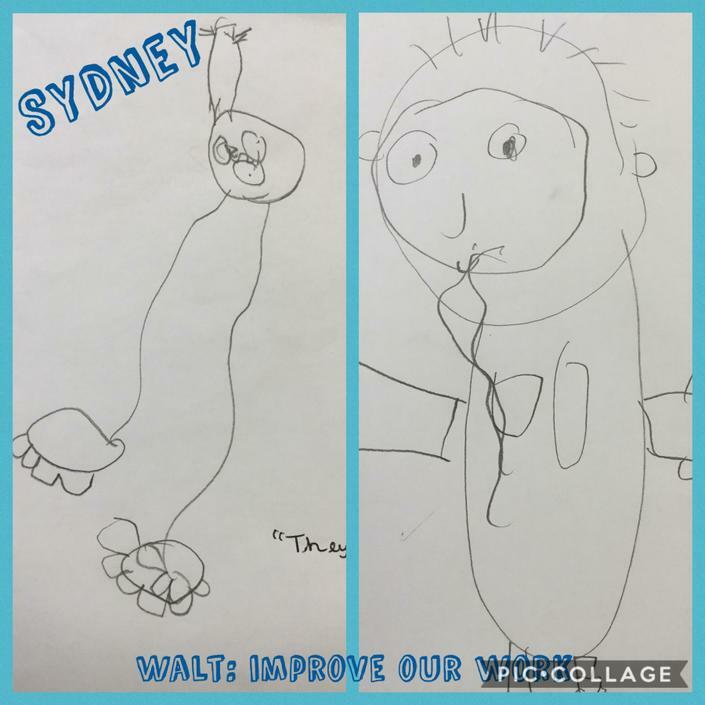 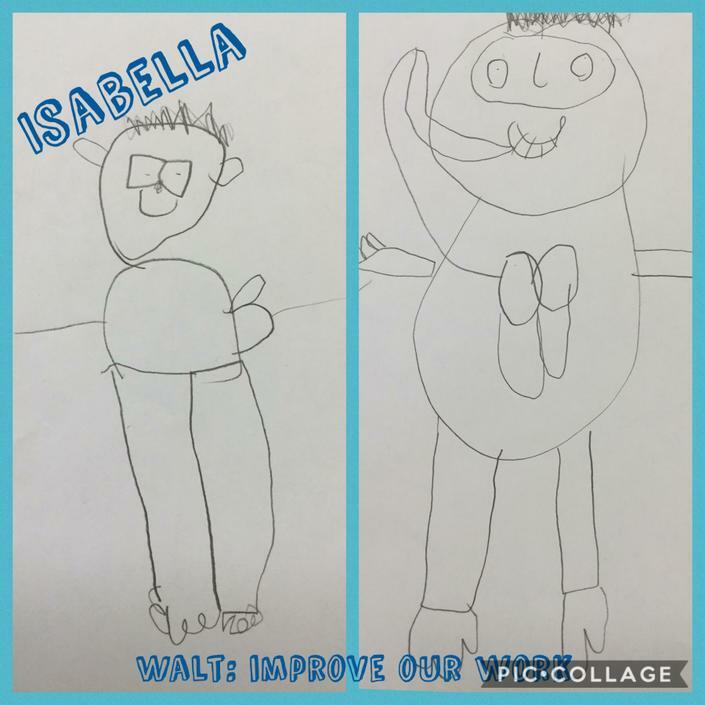 We will use critique to develop our artwork and create lots of masterpieces for our immersive classroom. 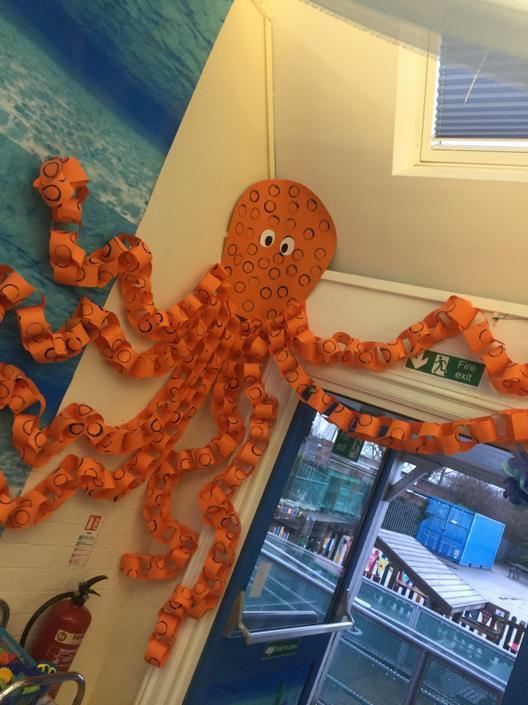 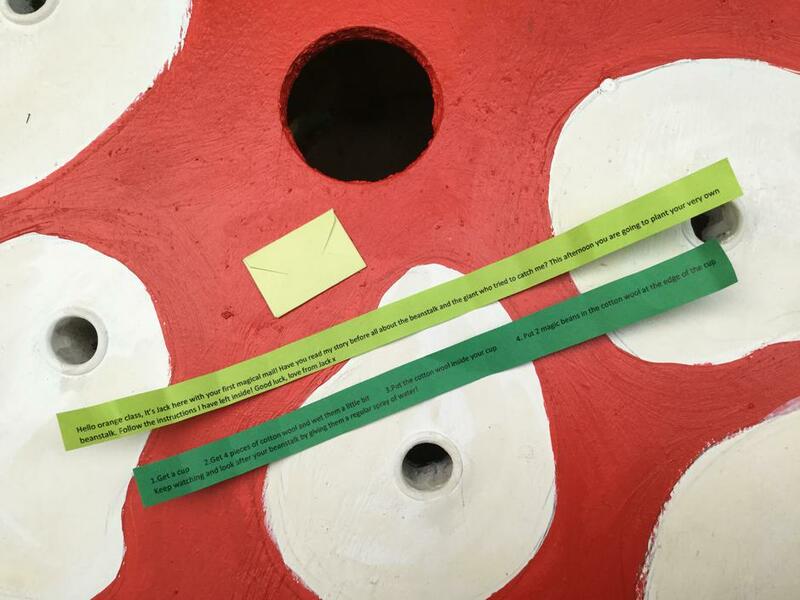 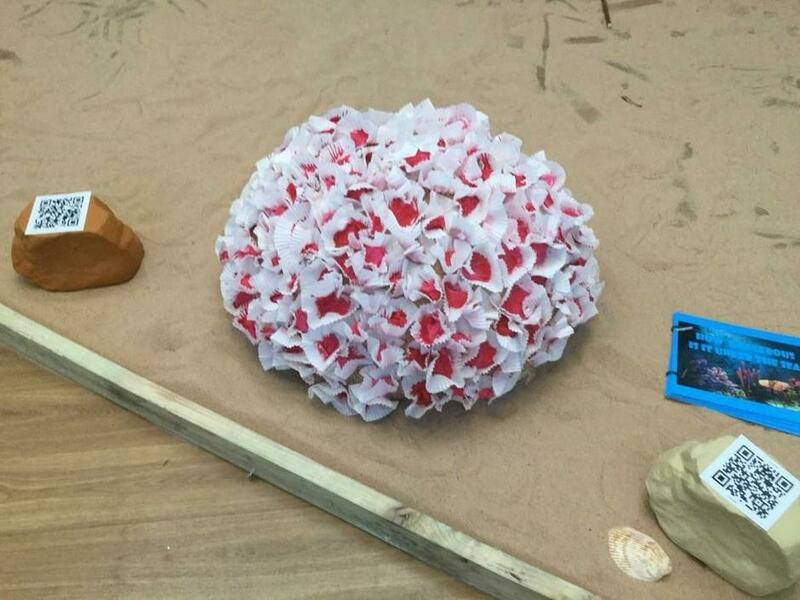 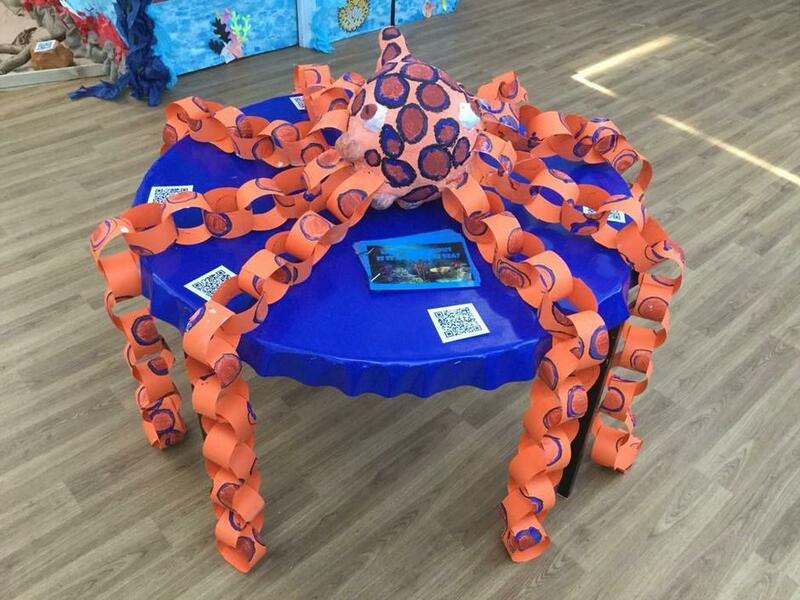 For our exhibition we will be working in teams to create large-scale models of dangerous sea creatures. 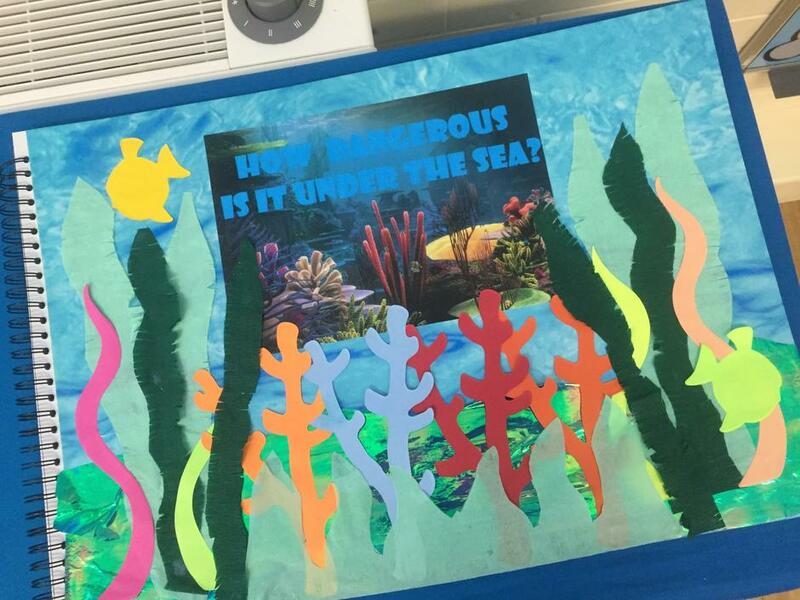 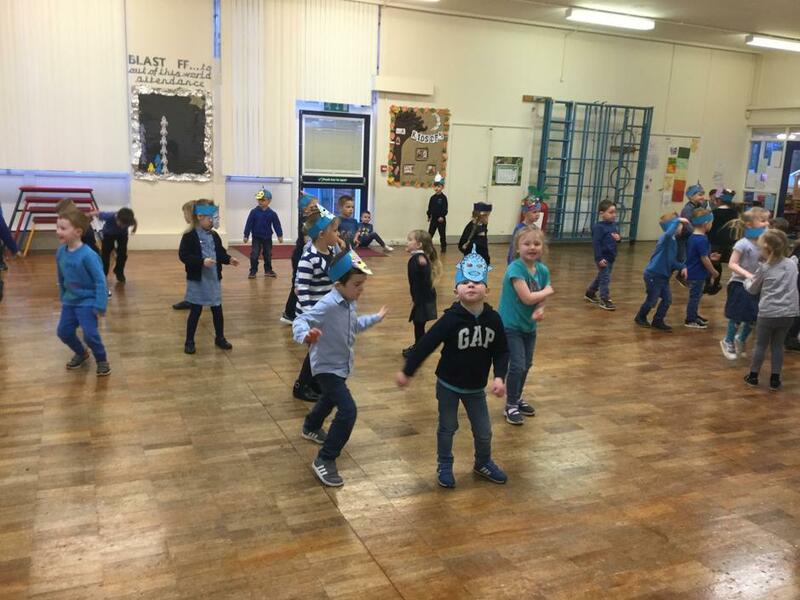 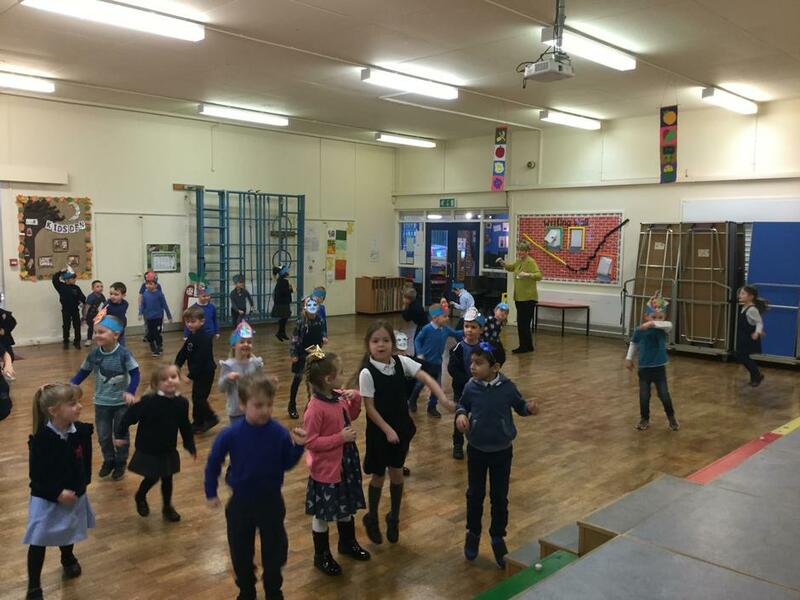 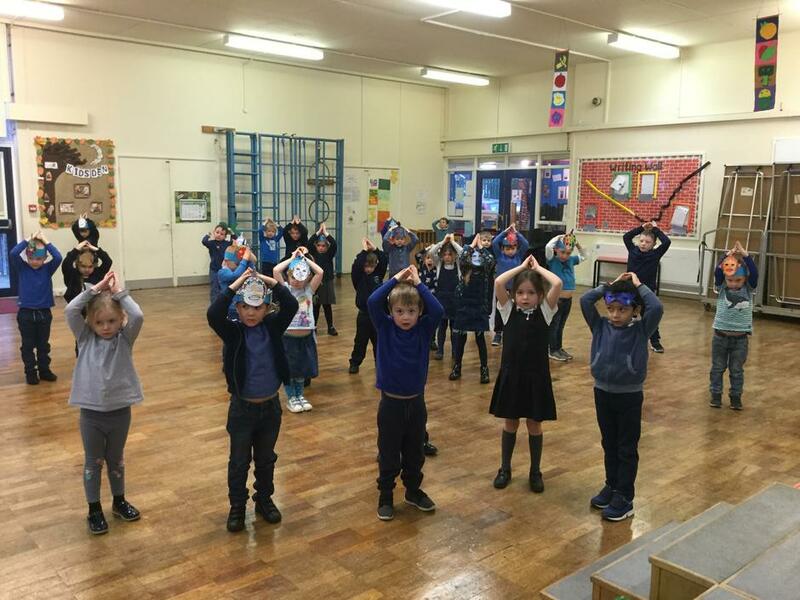 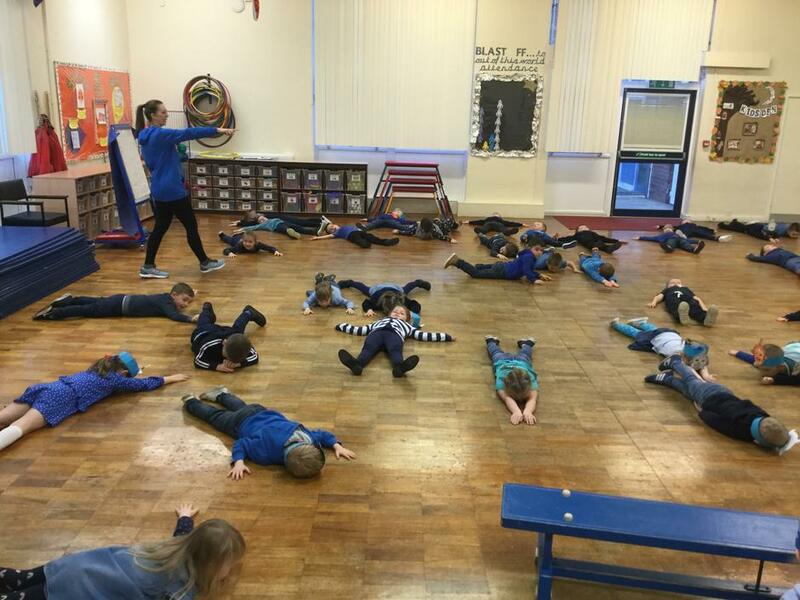 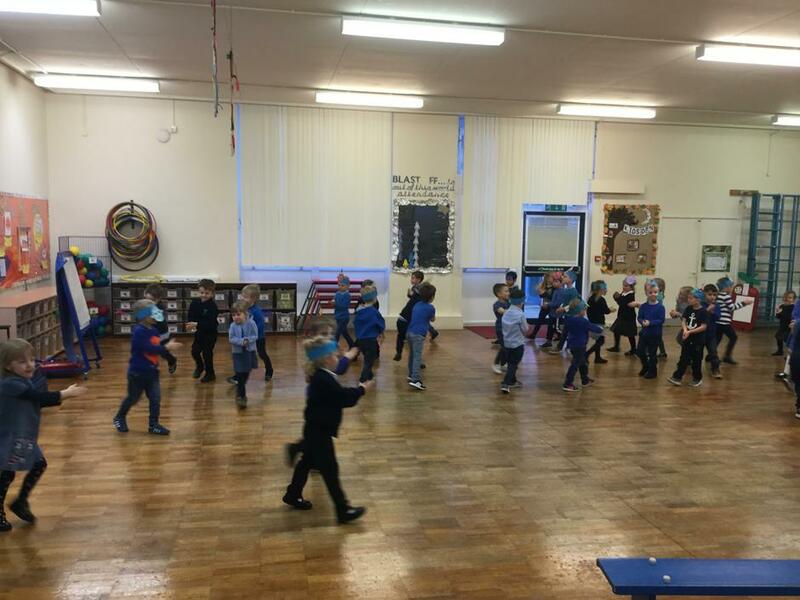 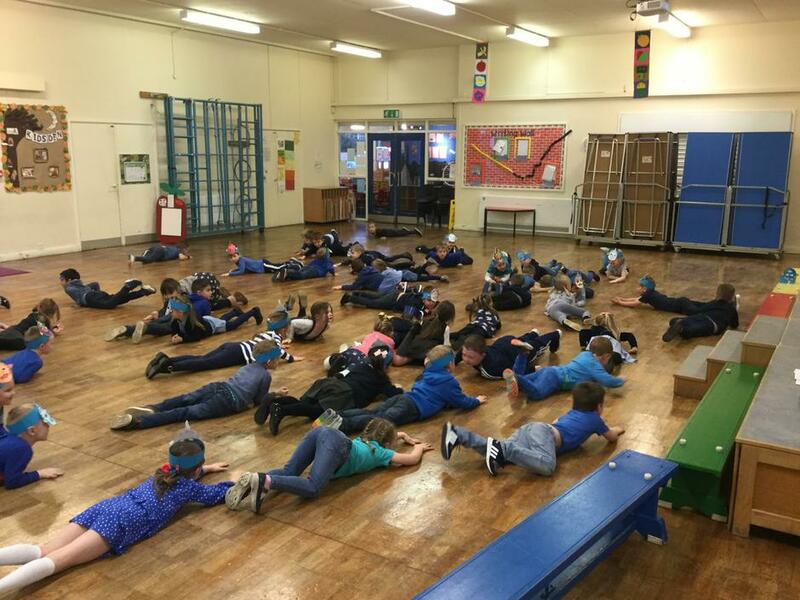 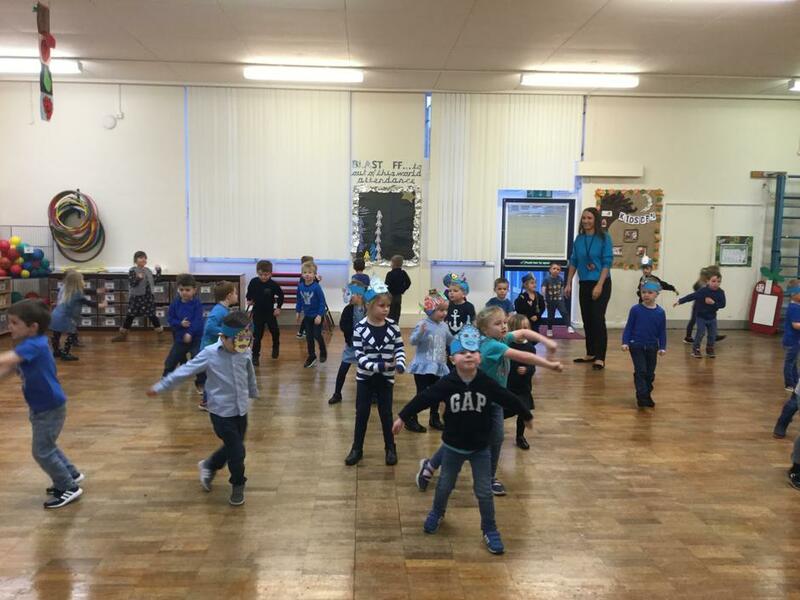 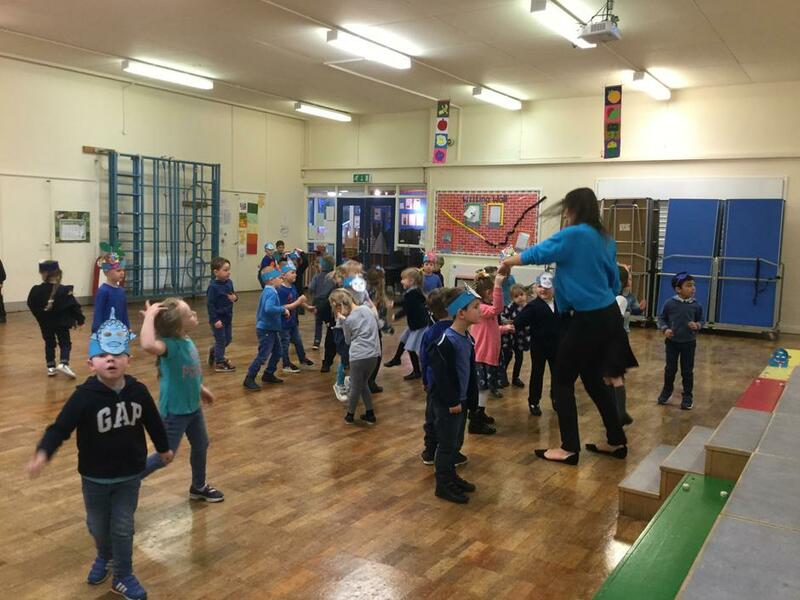 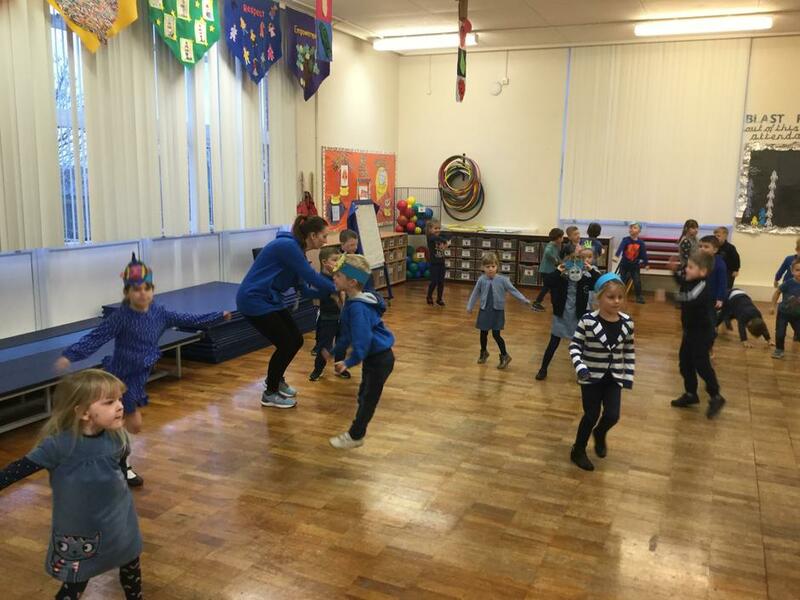 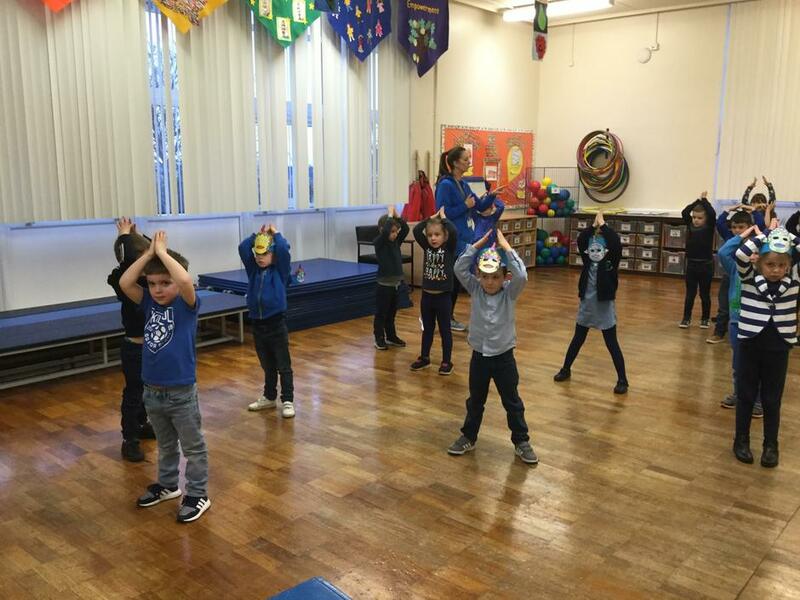 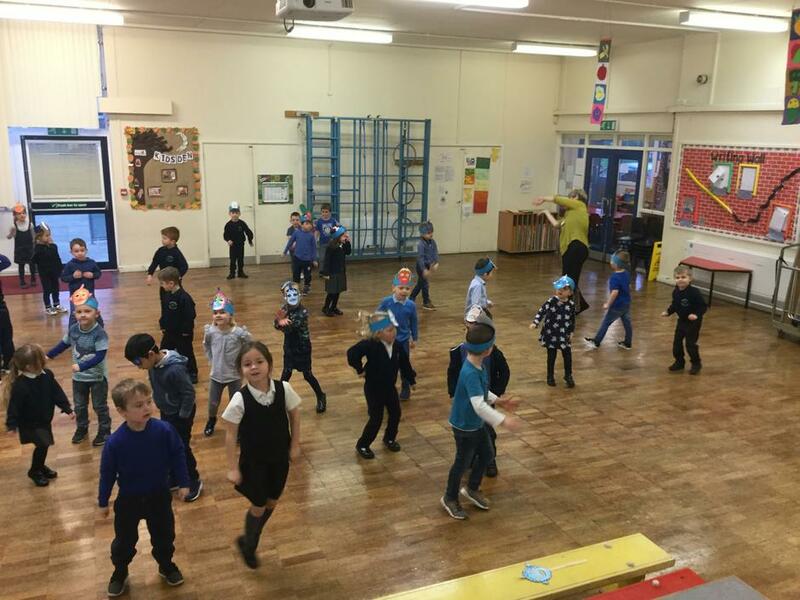 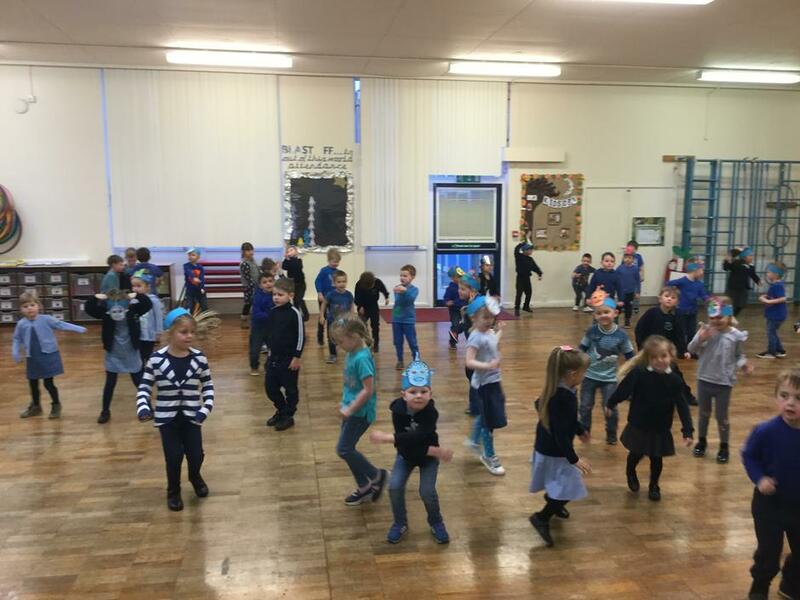 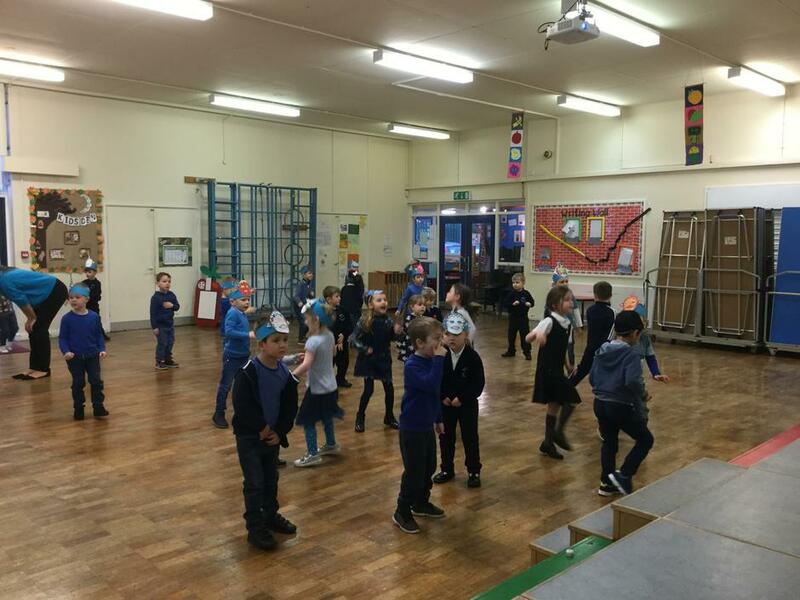 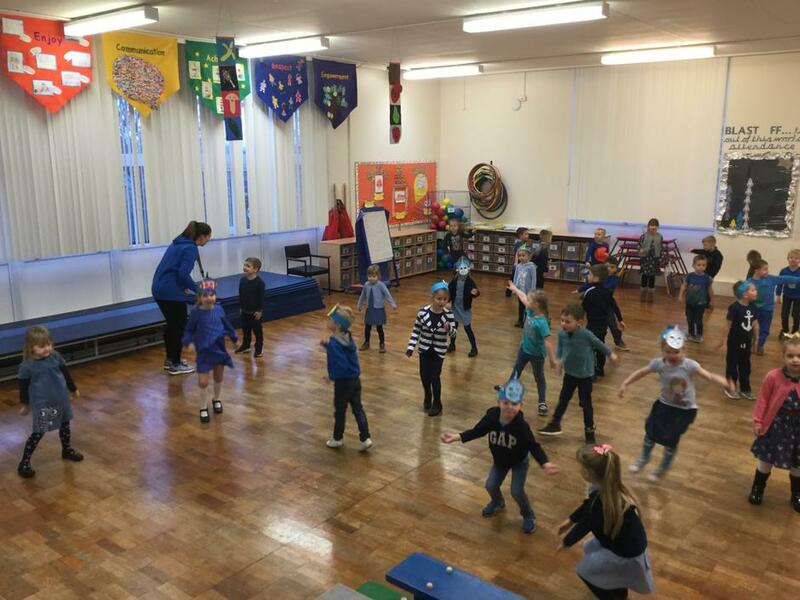 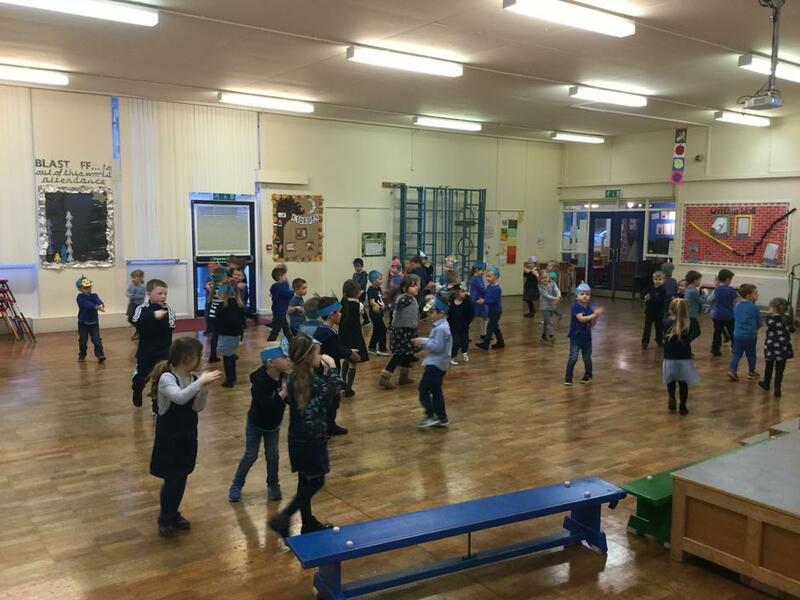 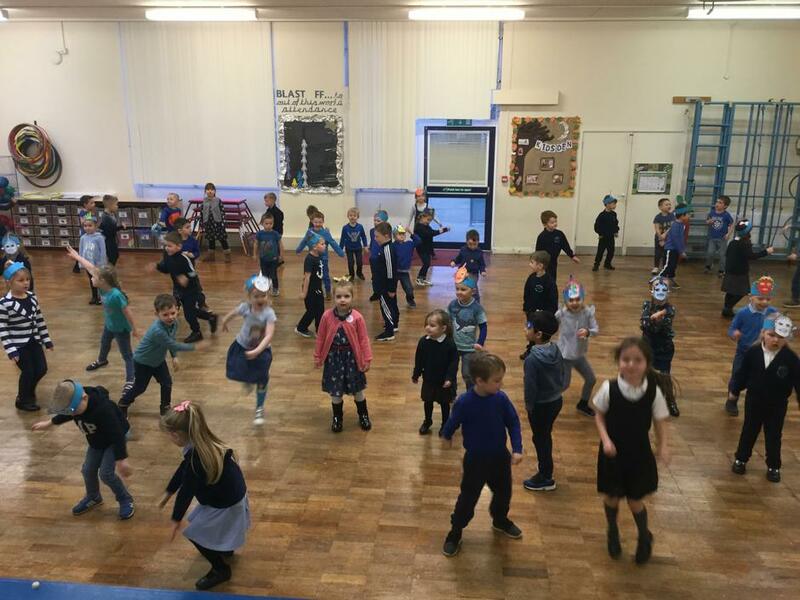 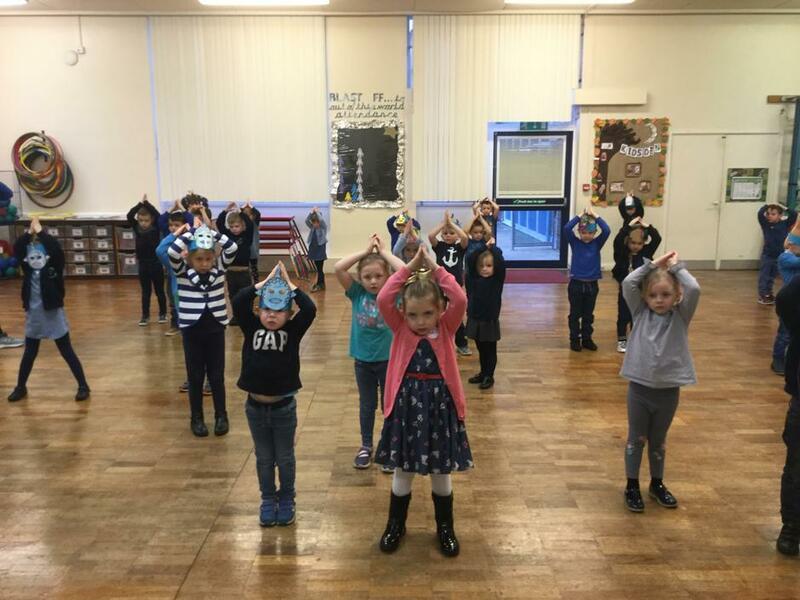 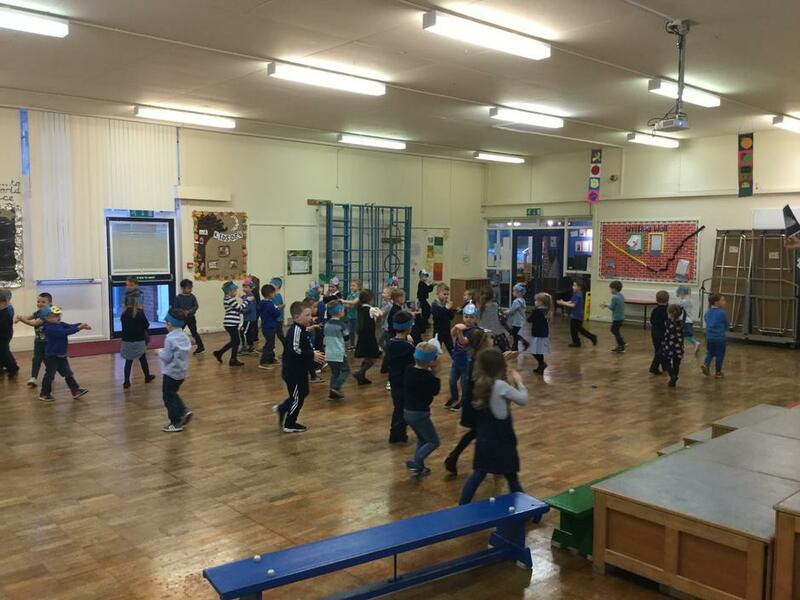 We will also incorporate dancing and singing into our exciting under the sea theme! 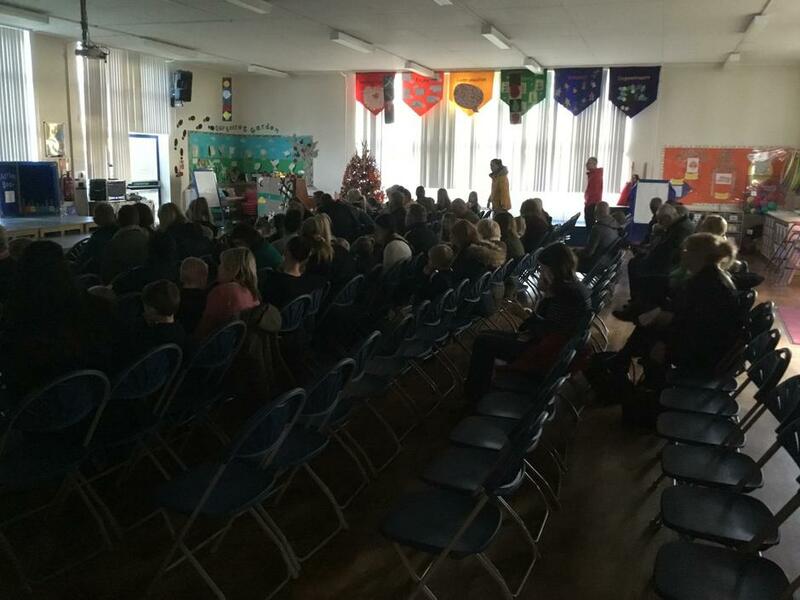 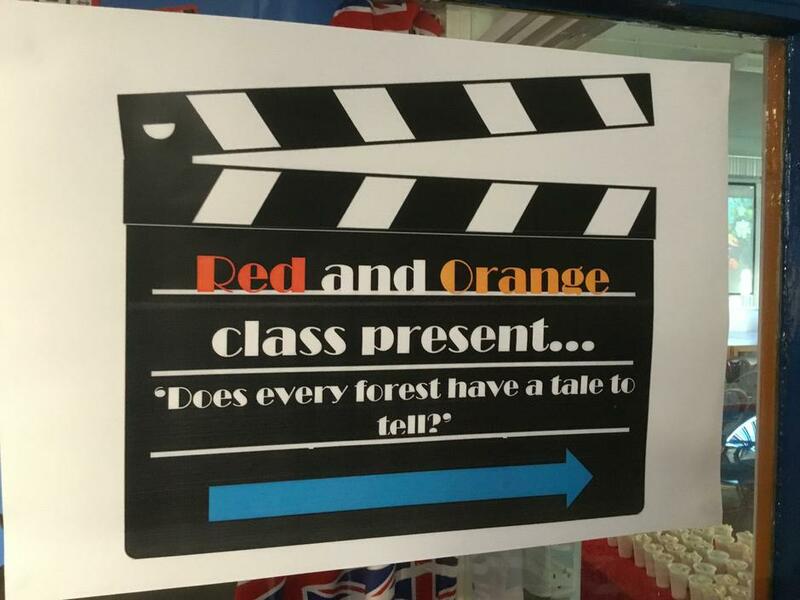 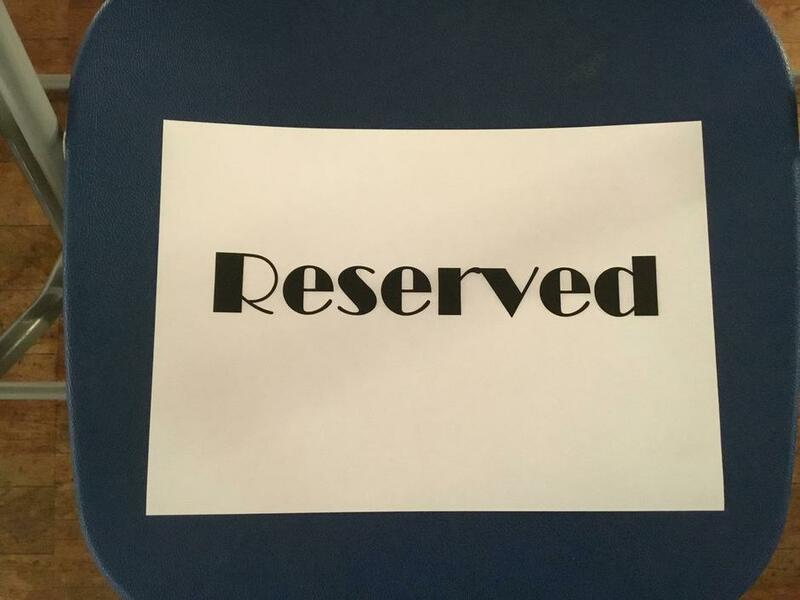 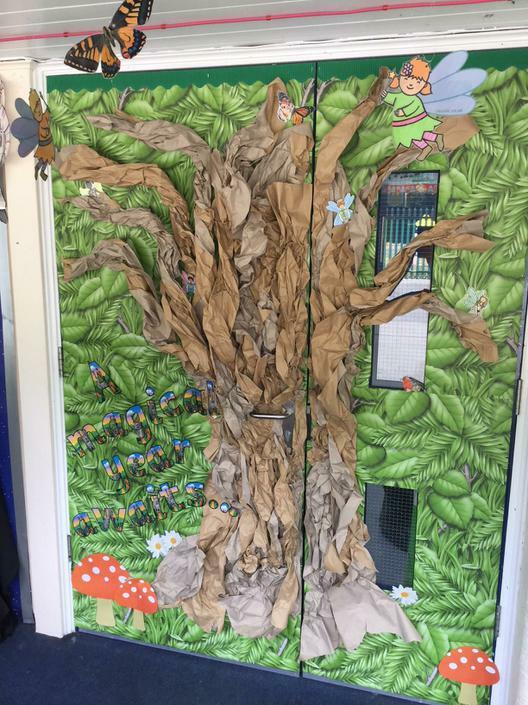 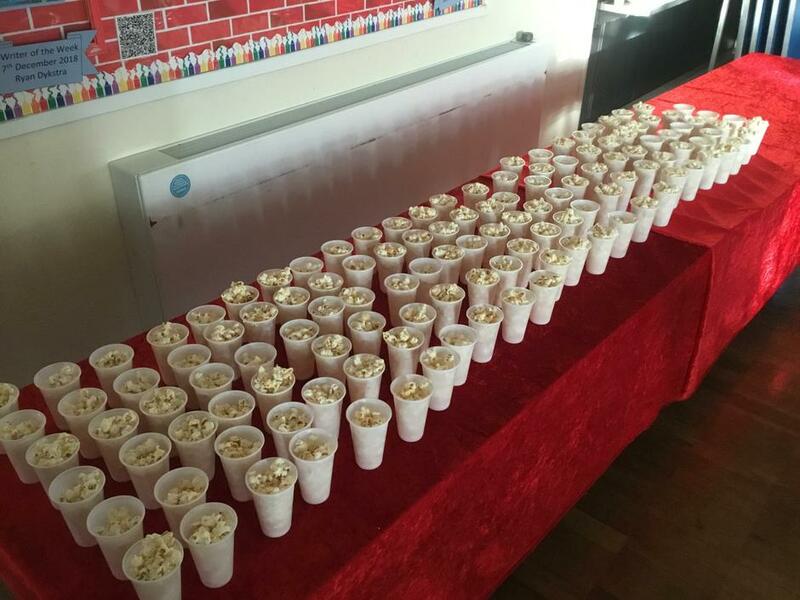 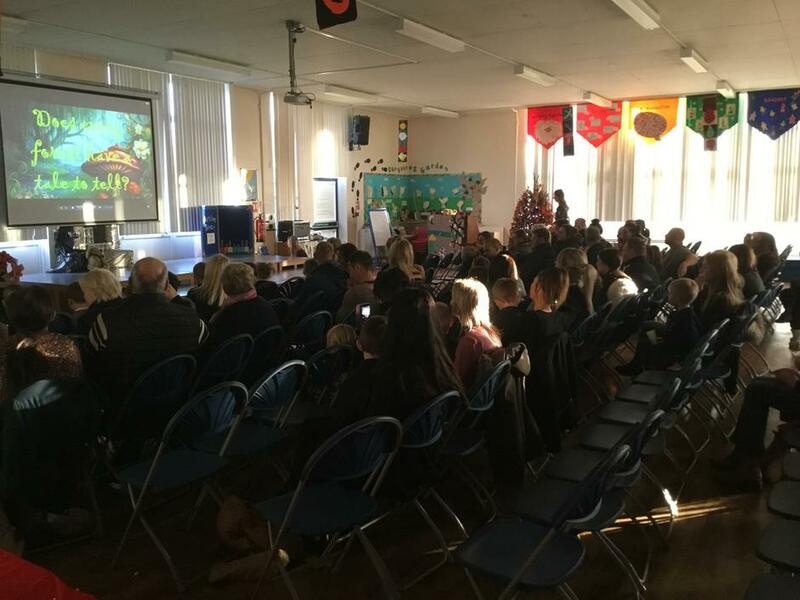 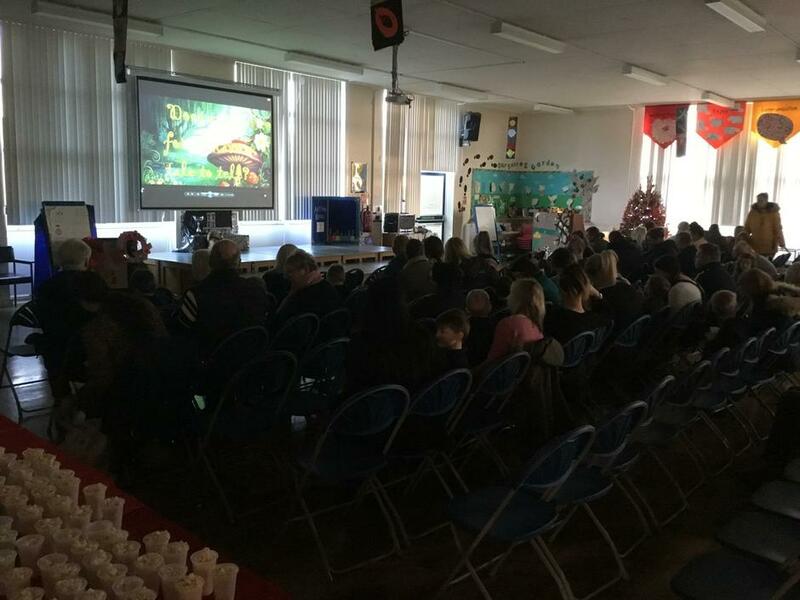 If you have any questions or would like to speak to a member of staff in Orange class please find us at the end of the school day. 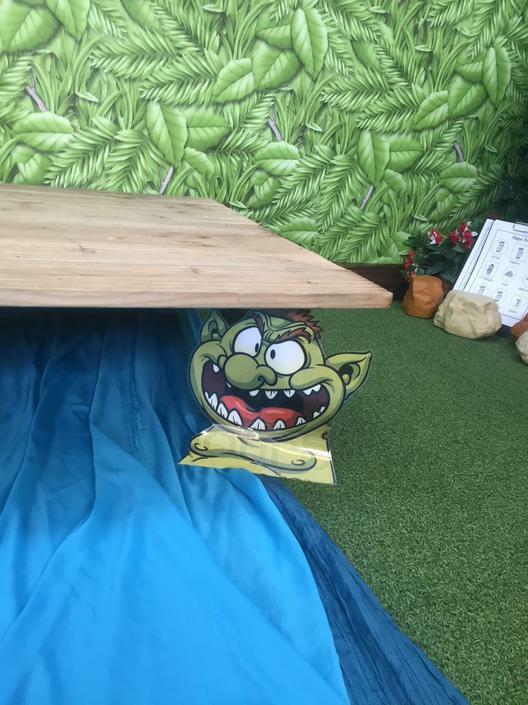 Alternatively, our learning mentor Mrs Holmes is available on the playground in the mornings.